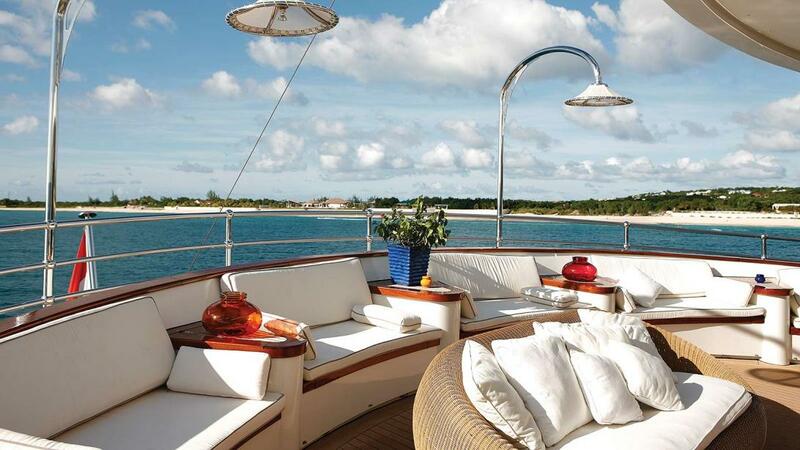 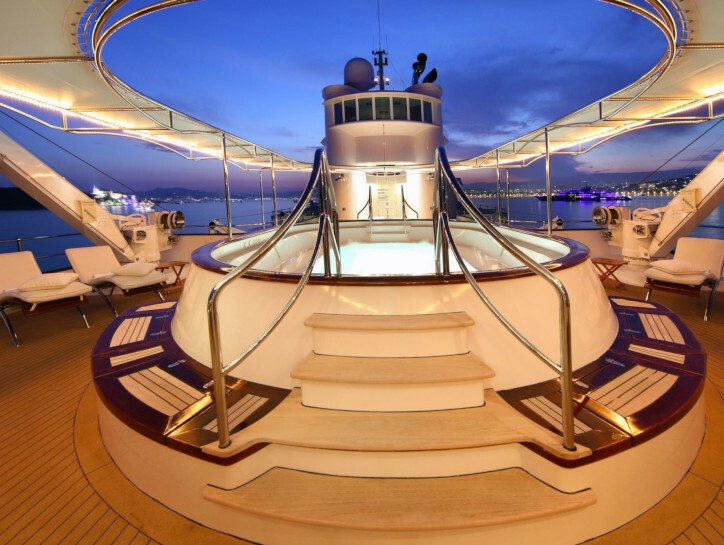 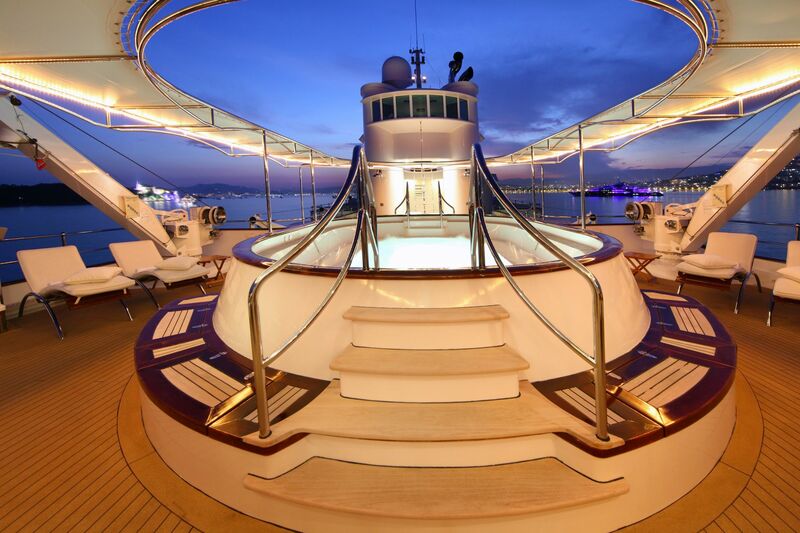 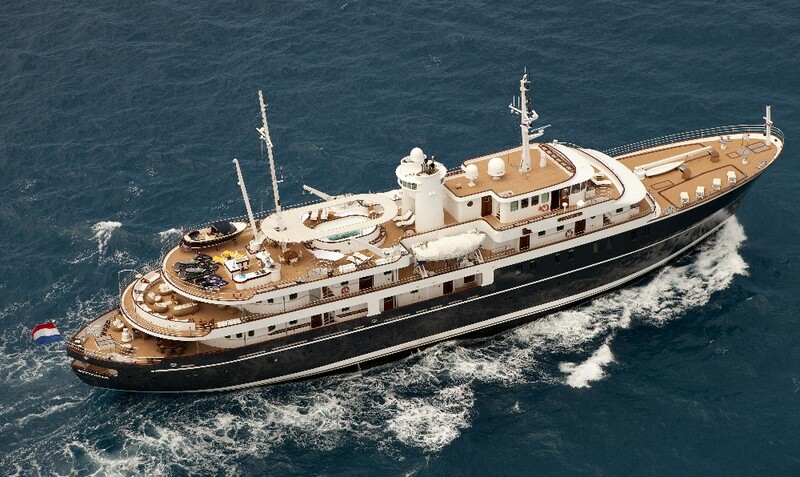 Luxury motor yacht SHERAKHAN is one of the most impressive superyachts available for charter. 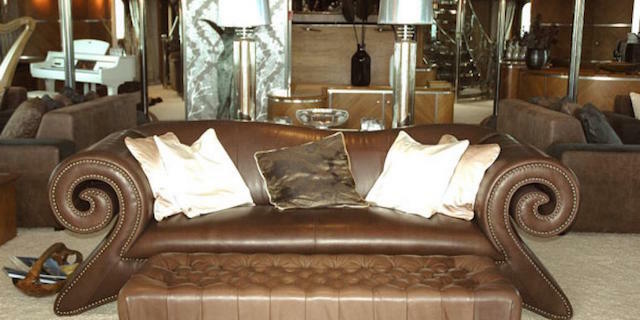 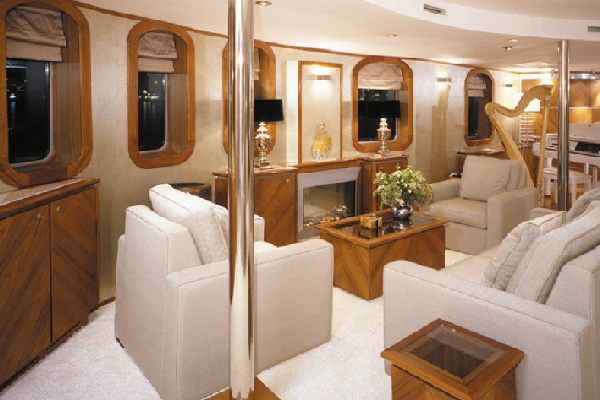 Her luxury interior décor and layout works very well to give a feeling of grandeur and comfort. 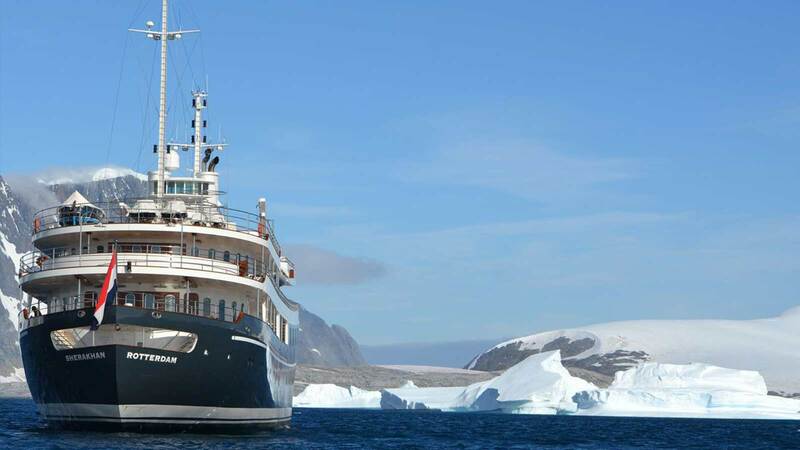 With 13 fantastic cabins, incredible amenities and an extensive selection of water toys, Sherakhan is ready to take 26 charter guests on an unforgettable journey to the most exotic destinations, as well as famous yachting events around the globe. 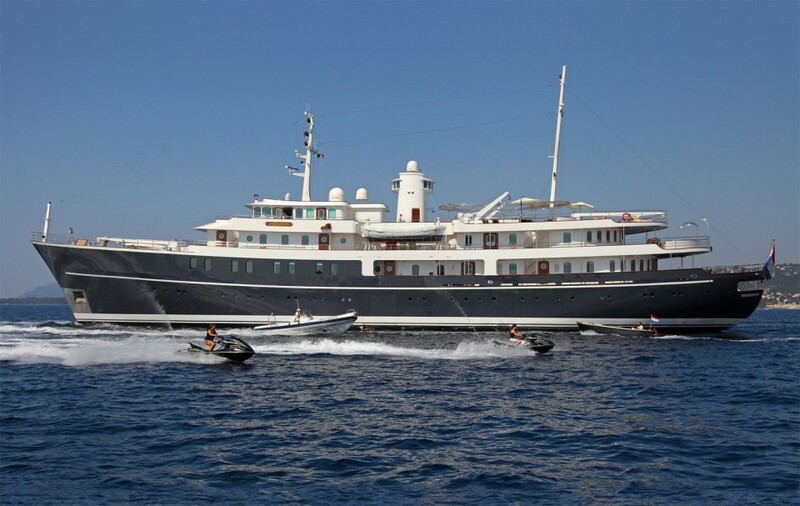 In 2014 this imposing 69.65m/228.5ft superyacht underwent a refit at ICON Yachts, while in 2017 she has received yet another extensive refit. 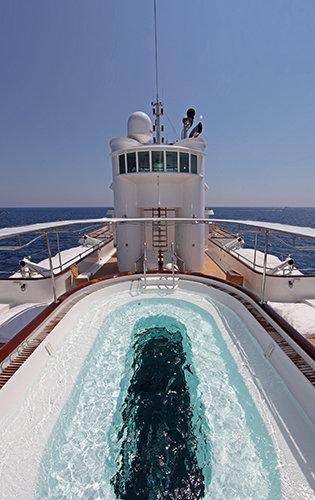 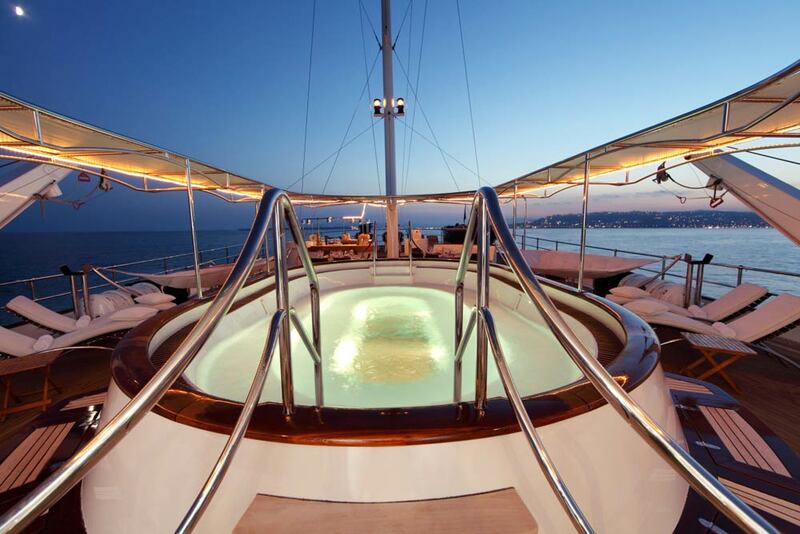 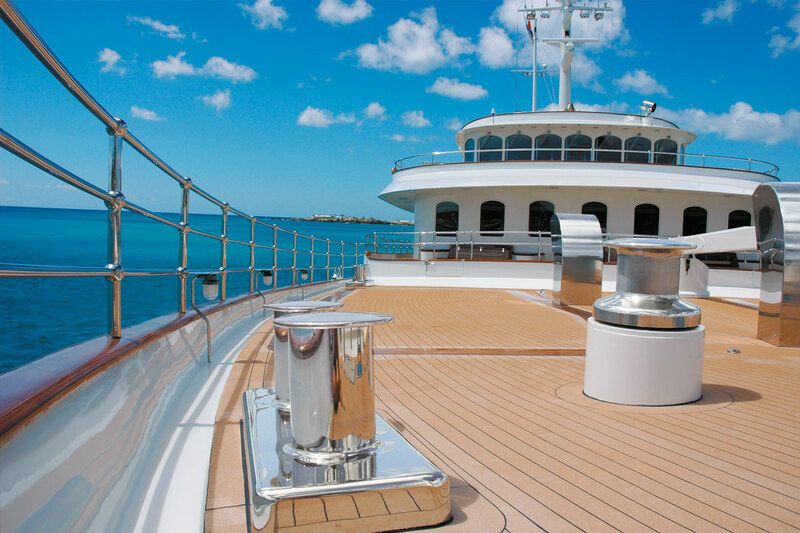 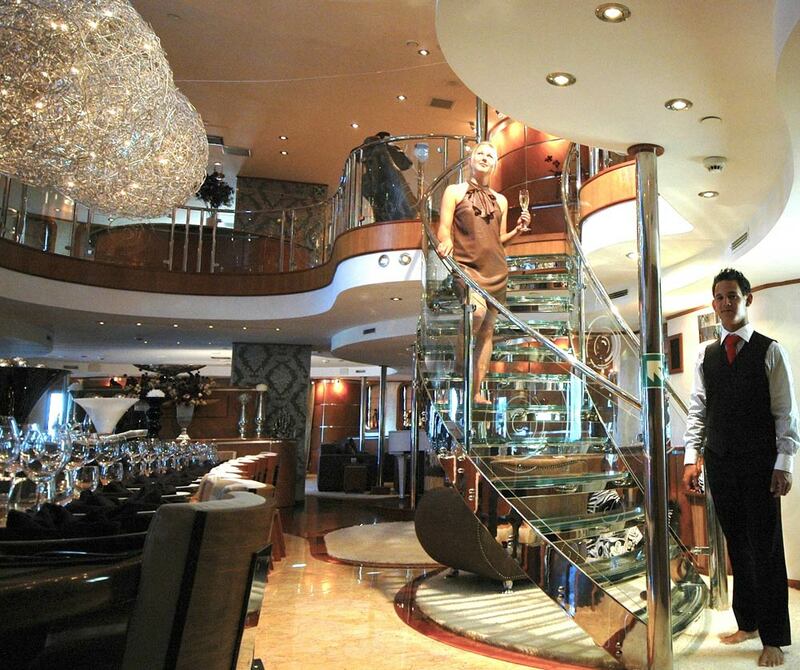 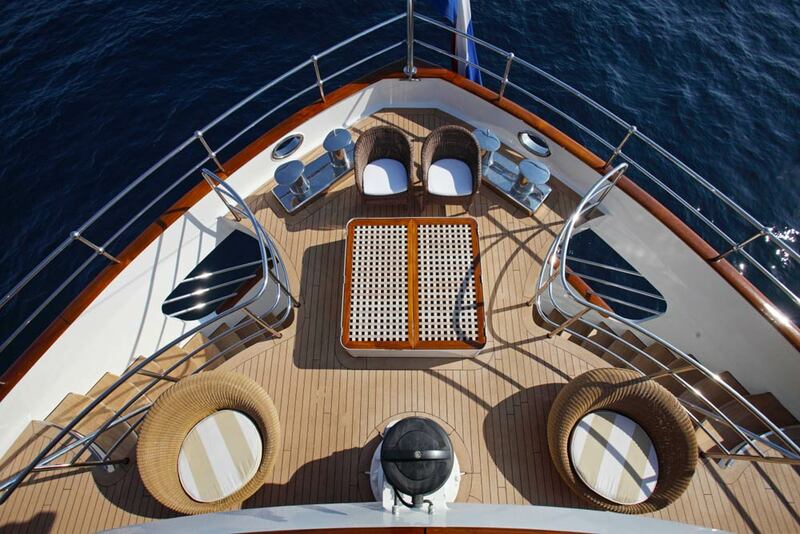 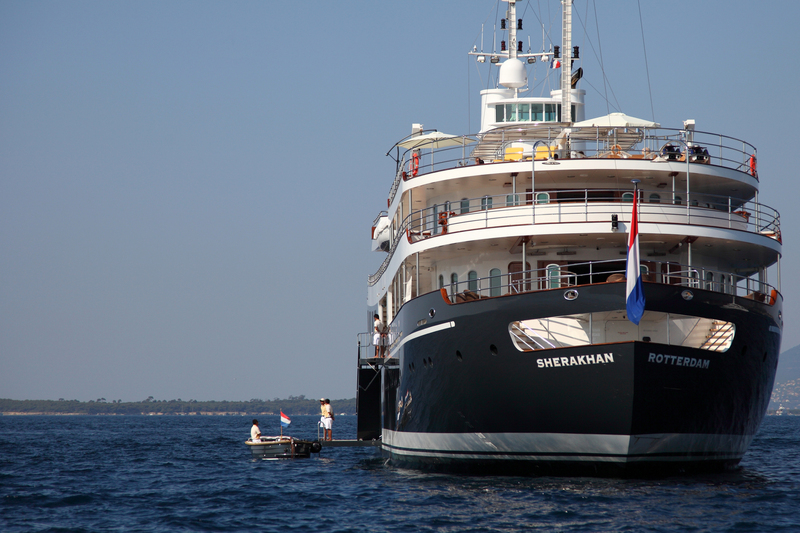 M/Y SHERAKHAN is the culmination of a dream for her owner. 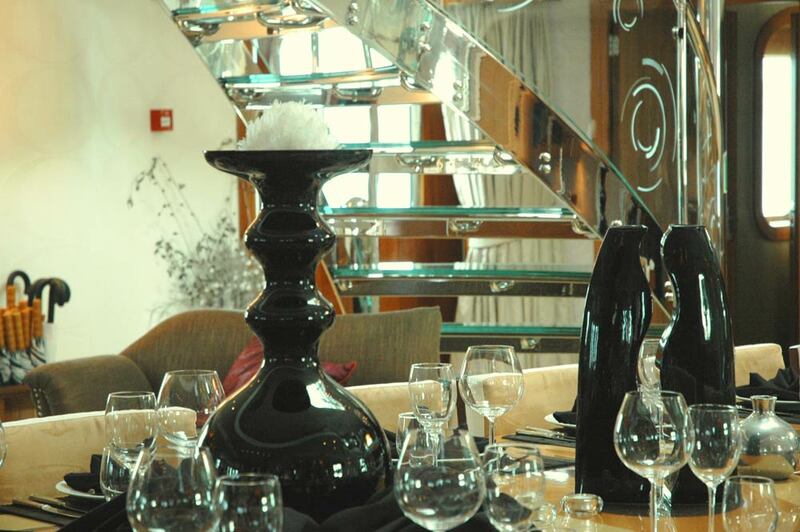 Whether it be the luxury dining room for 22 guests with its massive 7m Atrium bathed in natural light filtered down through the glass-bottomed Spa Pool or the Joy of standing in the lookout house perched above the sundeck a massive 20m above the water line. 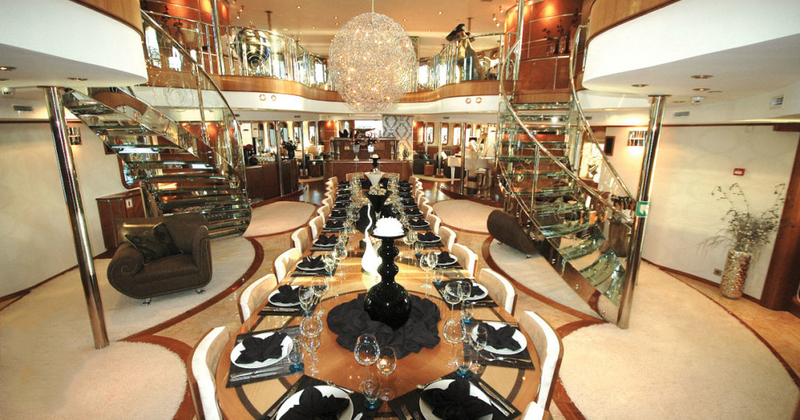 The main saloon is about 20 meters long and 9 meters wide. 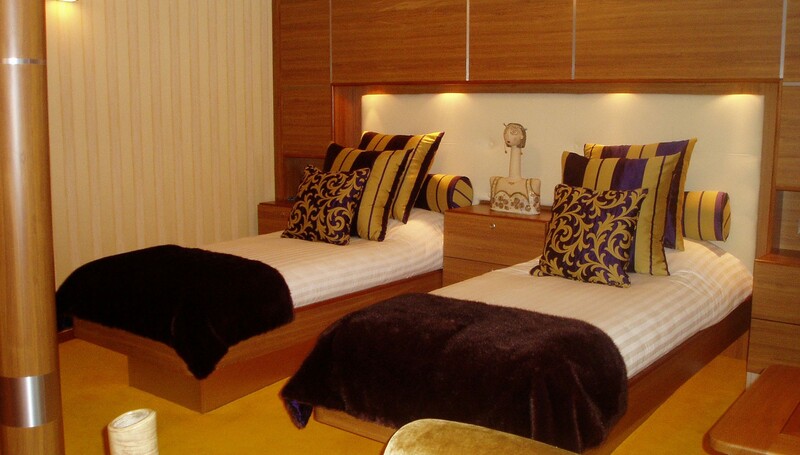 The style is cosy and homely. 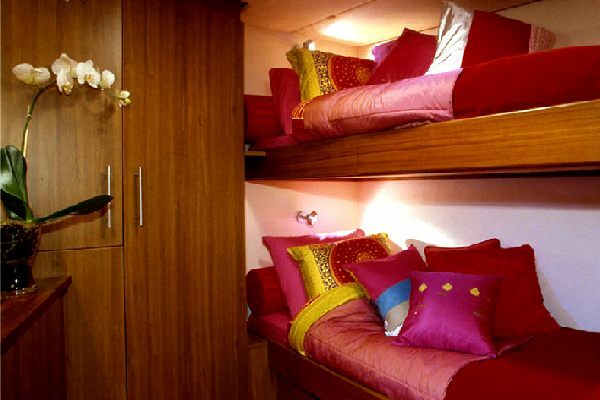 Every single guest on MY Sherakhan will be able to feel like home, while the highly experienced crew of 19 will take care of the daily errands. 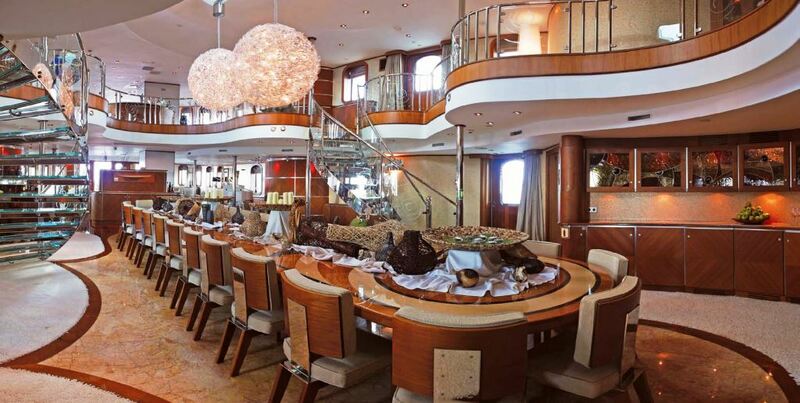 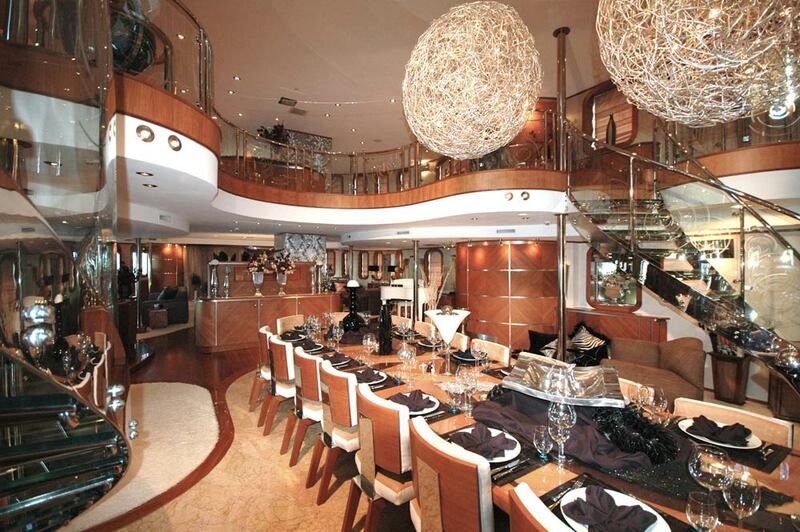 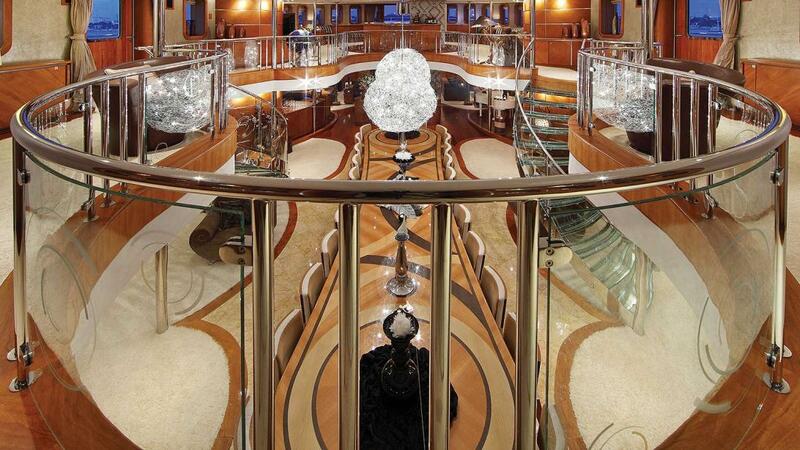 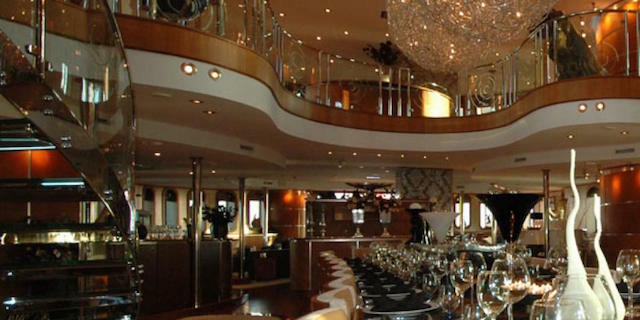 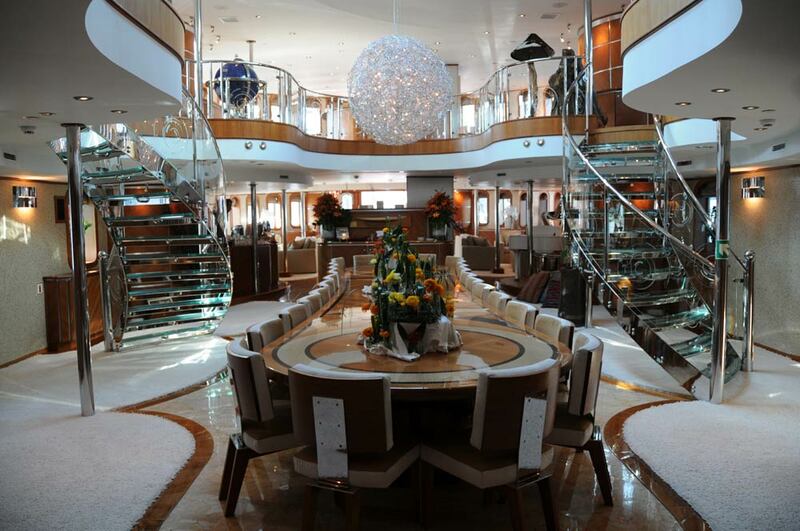 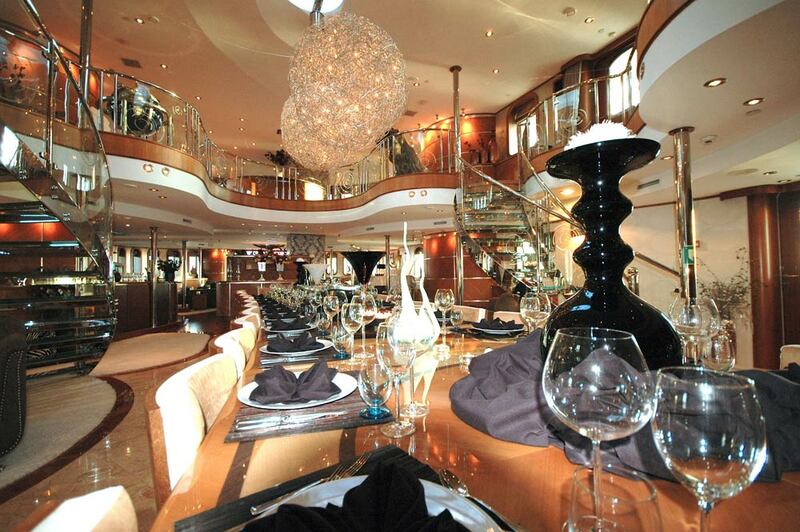 The main saloon is visually divided into two areas: dining and lounge. 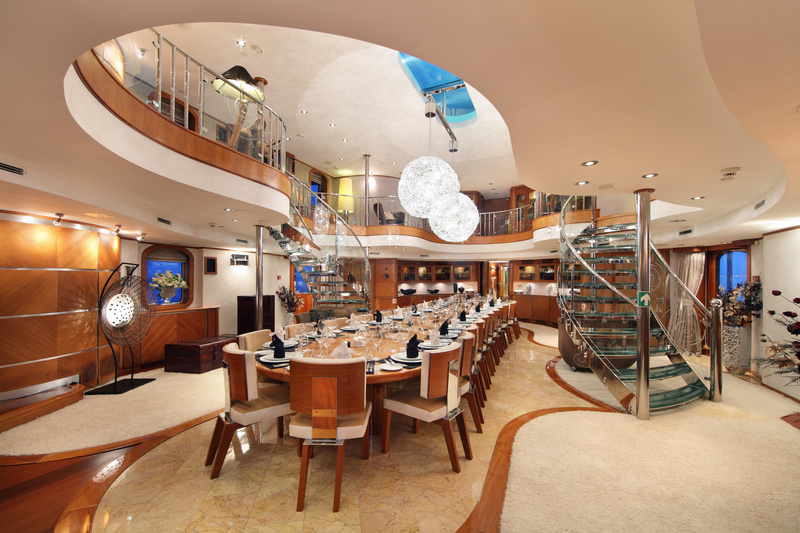 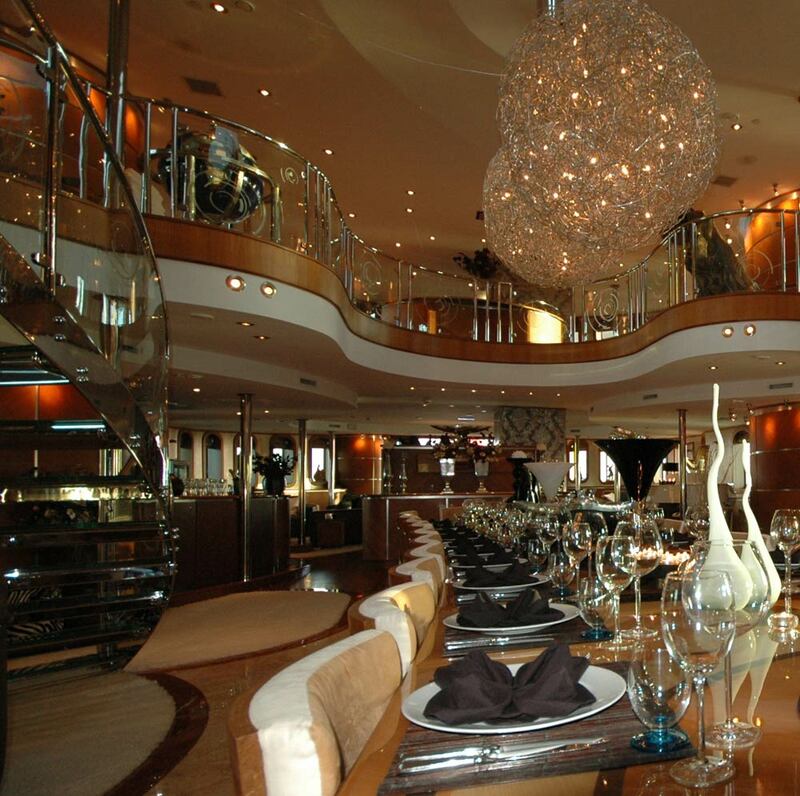 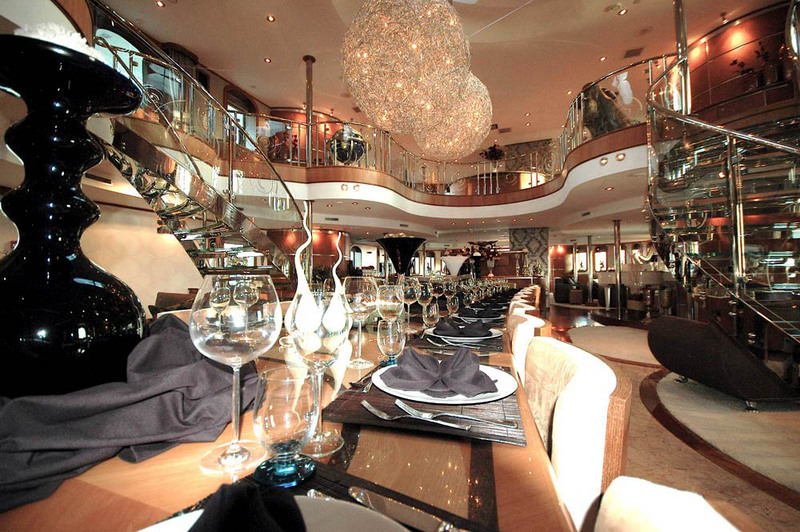 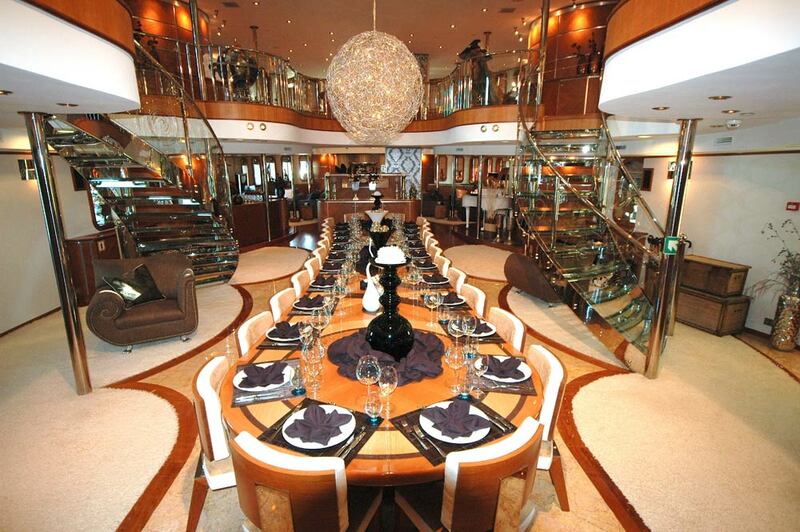 There is a beautiful dining area; with a massive table, where 22 people can be seated. 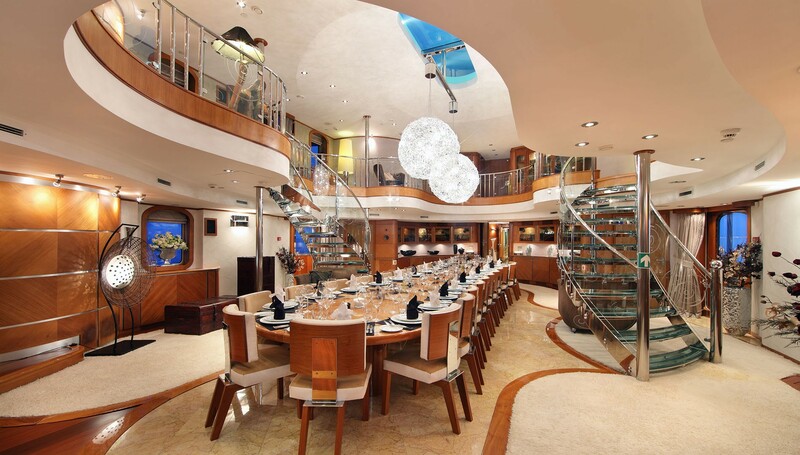 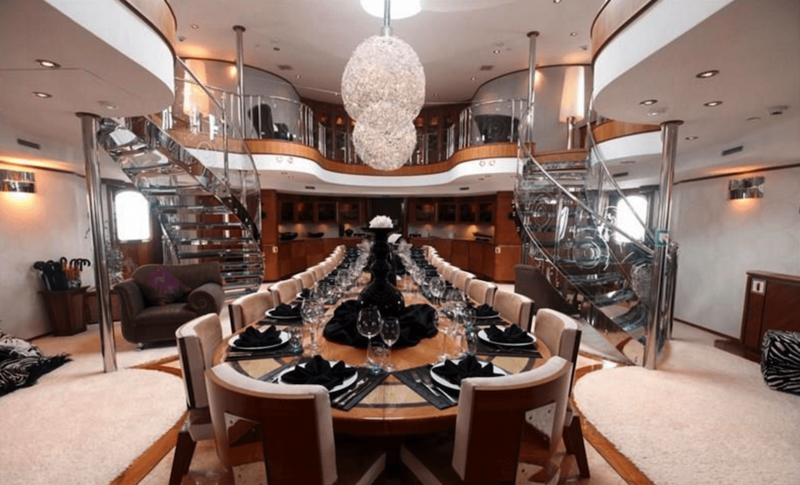 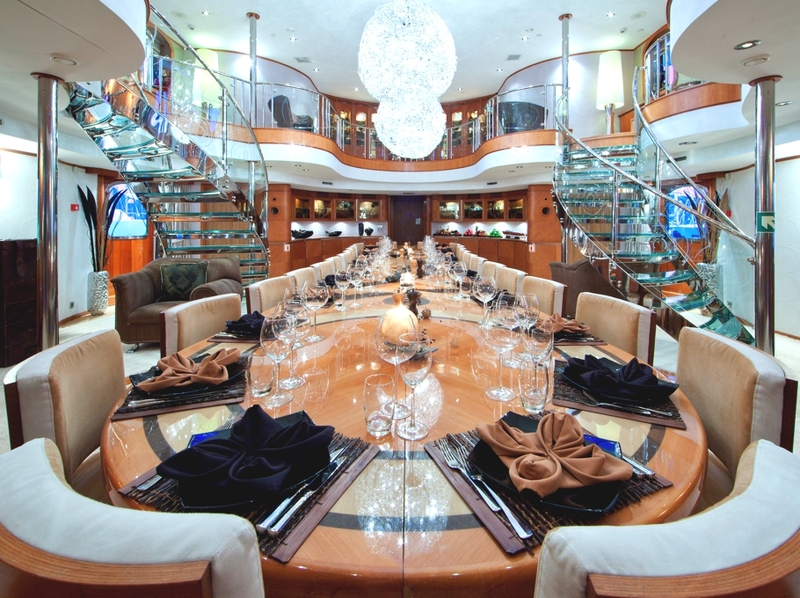 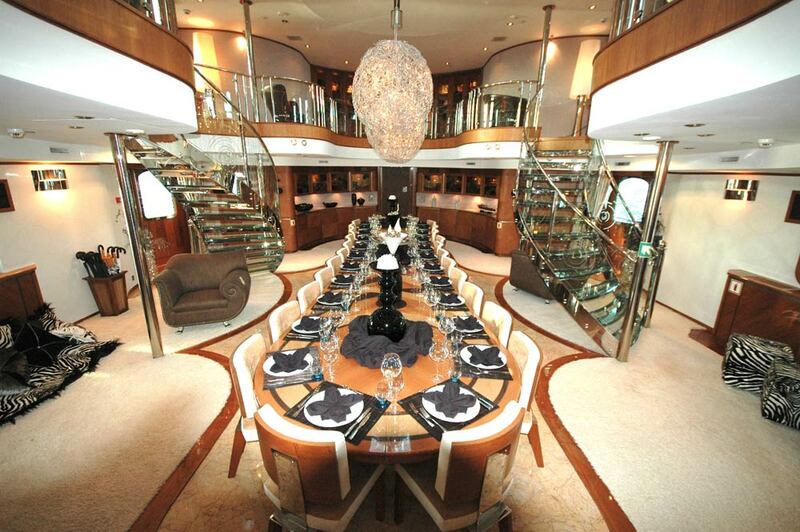 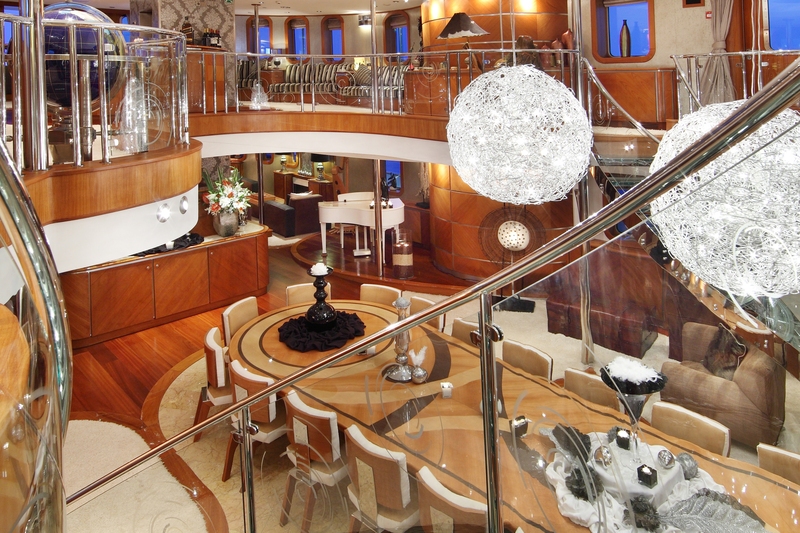 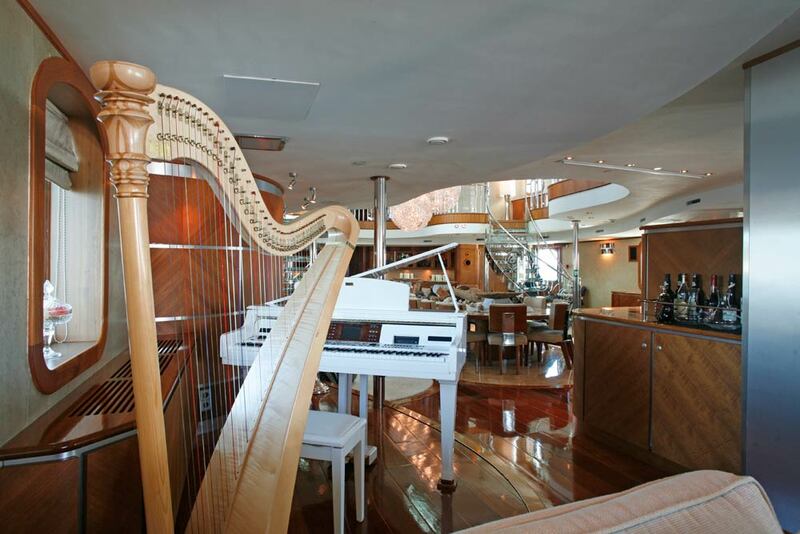 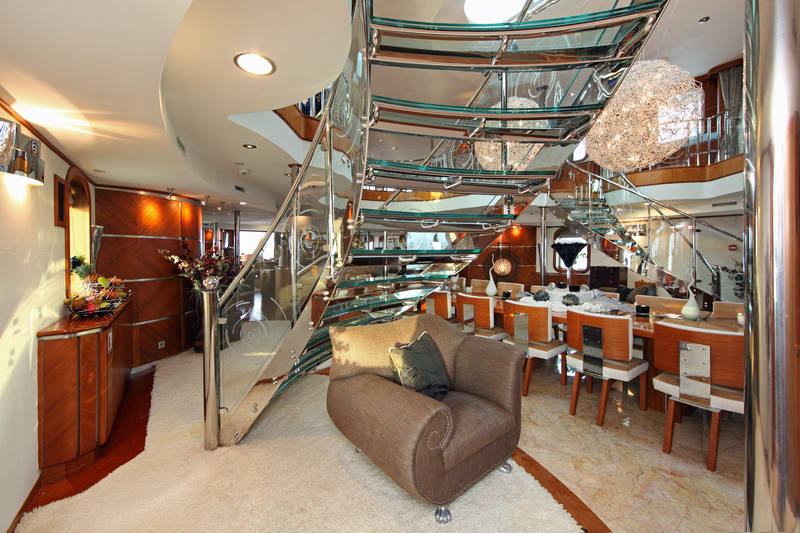 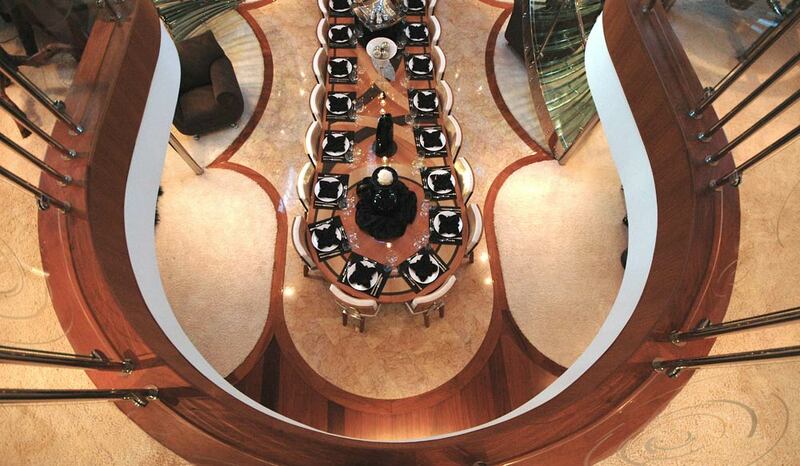 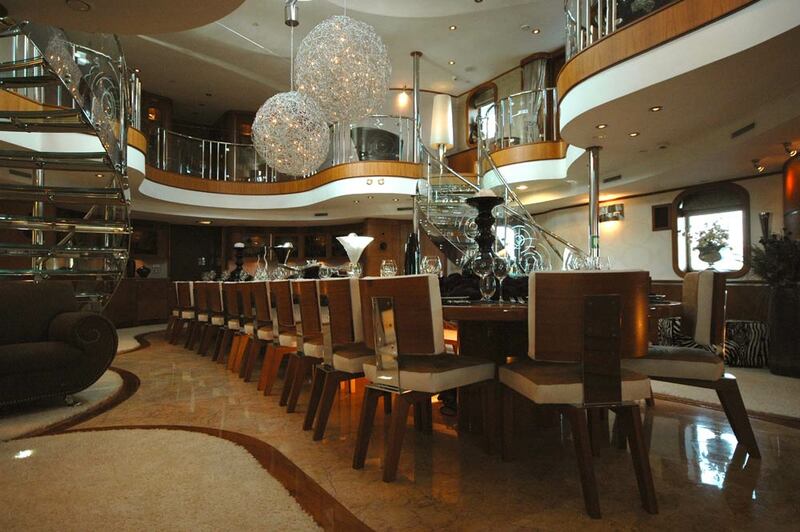 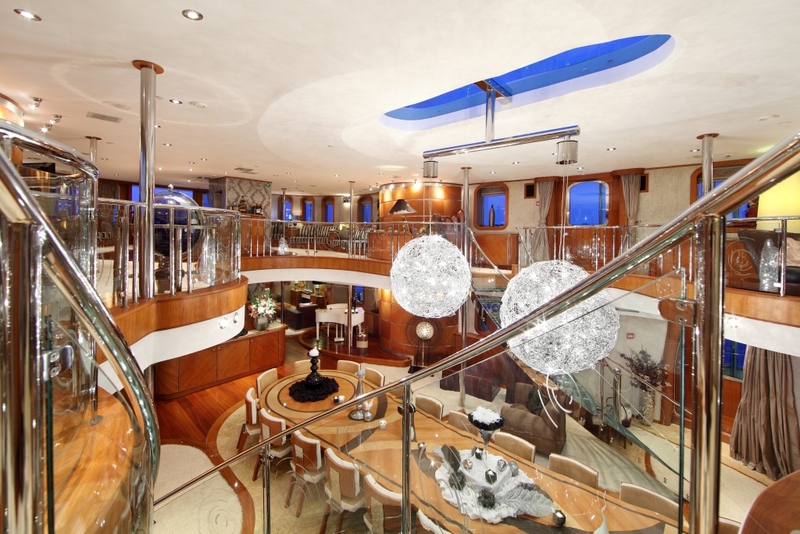 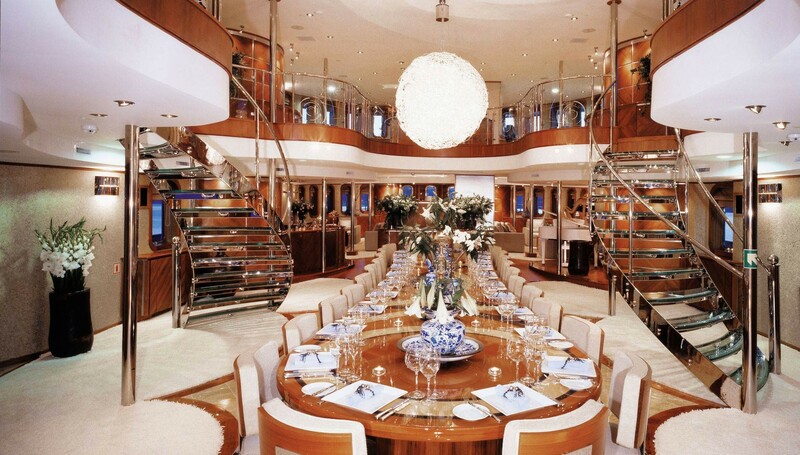 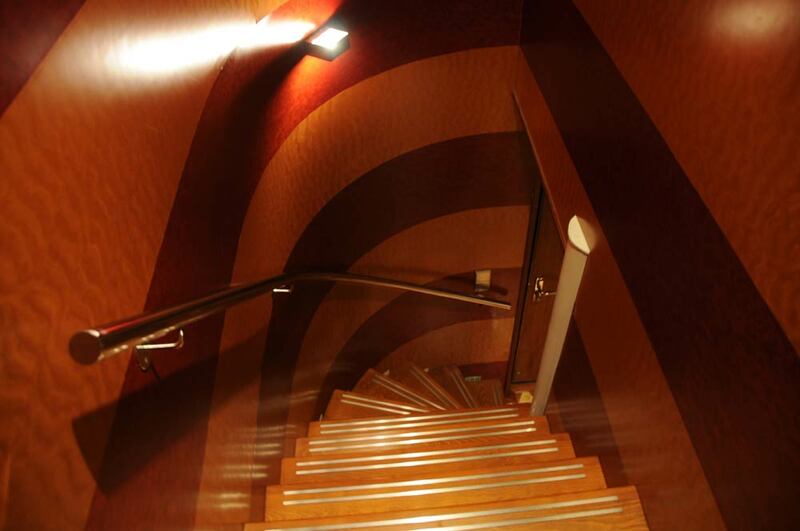 On both sides of the dining table, there are two impressive stairs which lead to the owner’s deck. 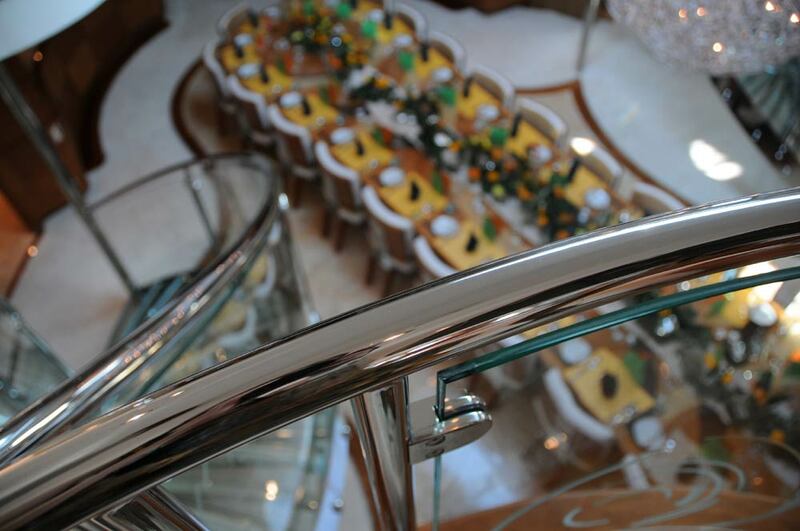 When you sit at the dining table and look up, you will be impressed by the atrium. 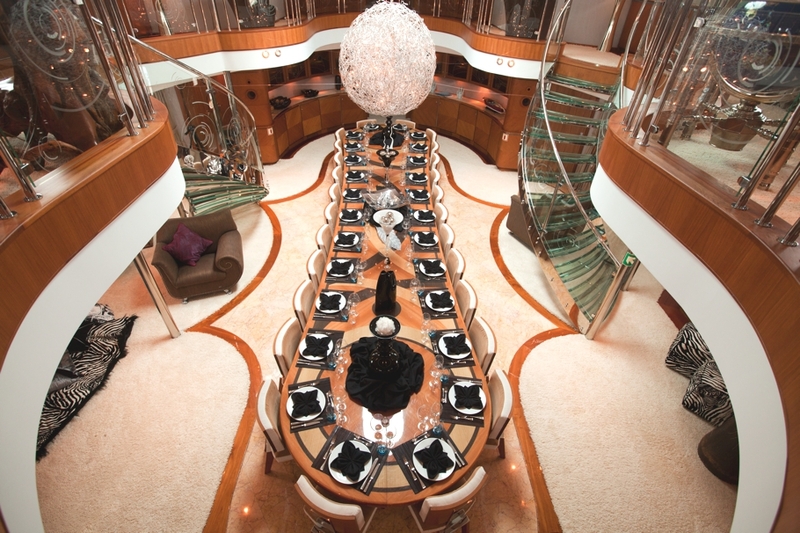 The enormous chandelier was specially designed for this area of 7 meters in height. 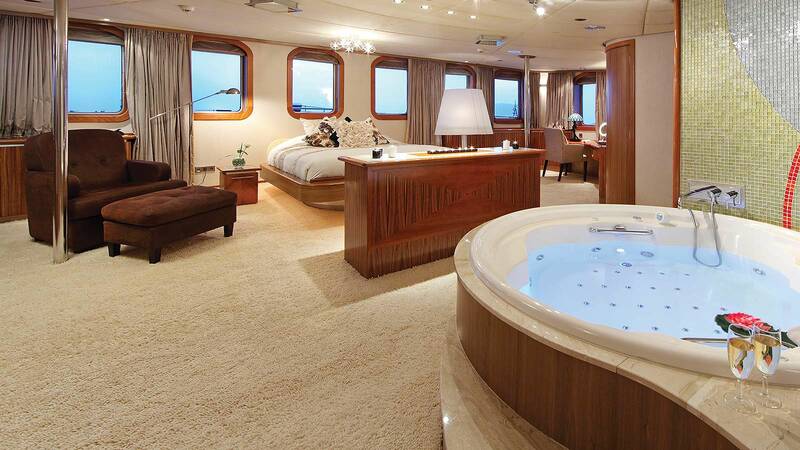 The other side of the saloon is furnished to relax. 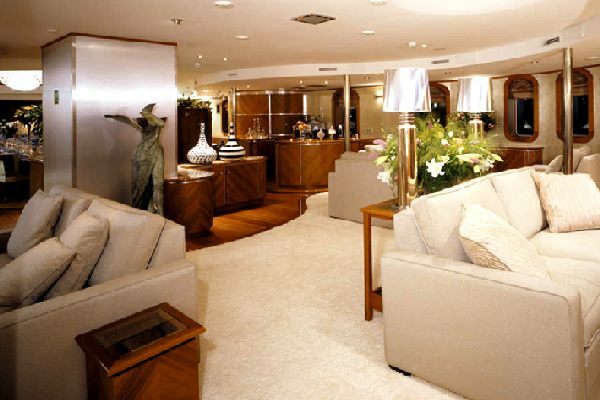 Nice cosy couches, comfortable armchairs, enormous vases, a fireplace, a flat screen television, a bar where the guests can sit down to enjoy some drinks and, of course, a little podium with a white grand piano. 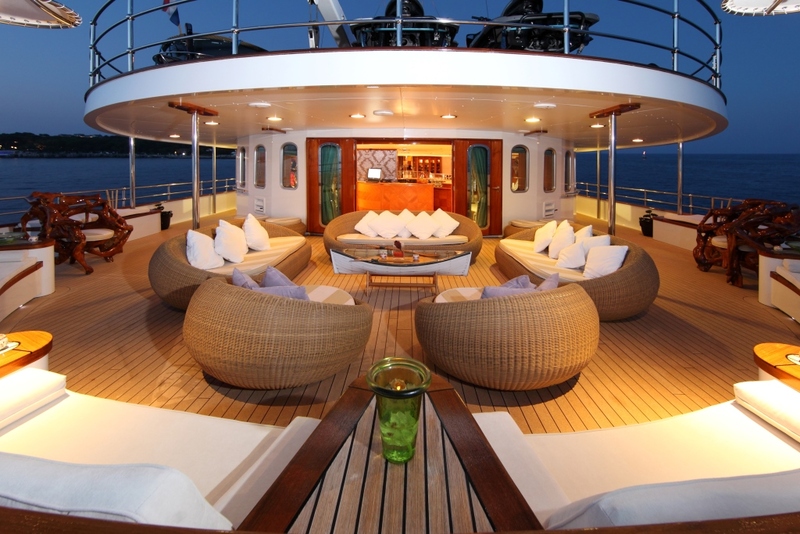 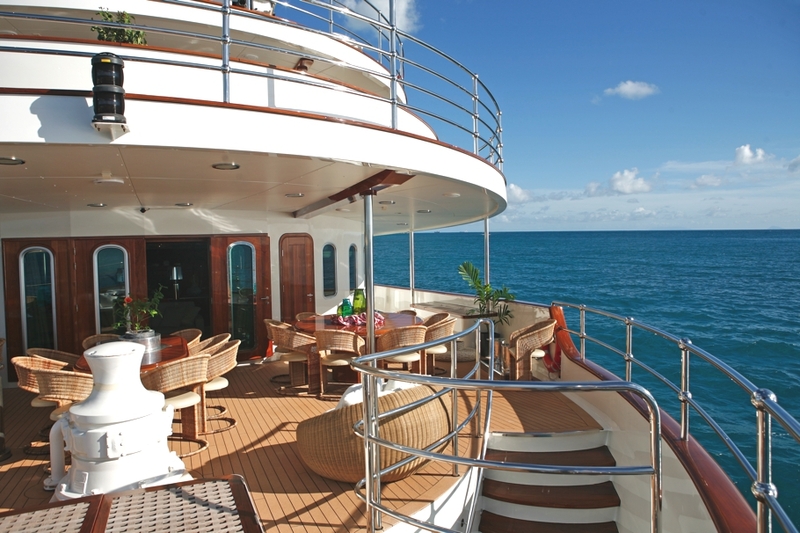 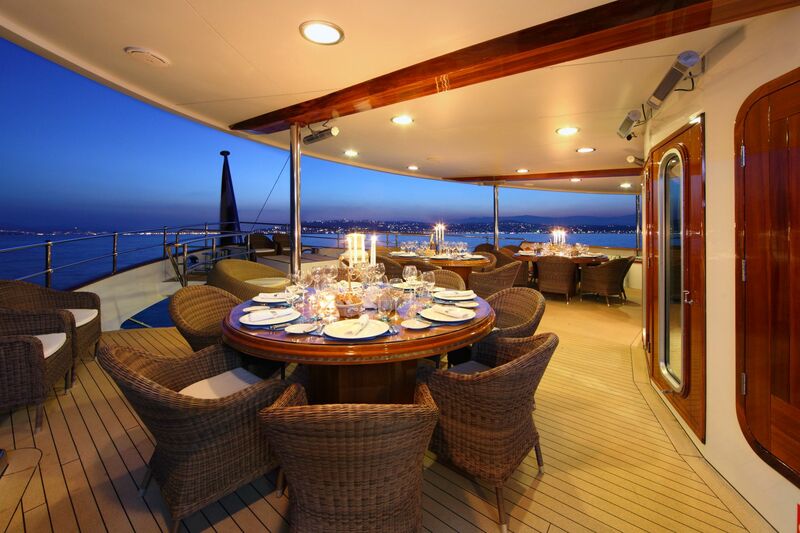 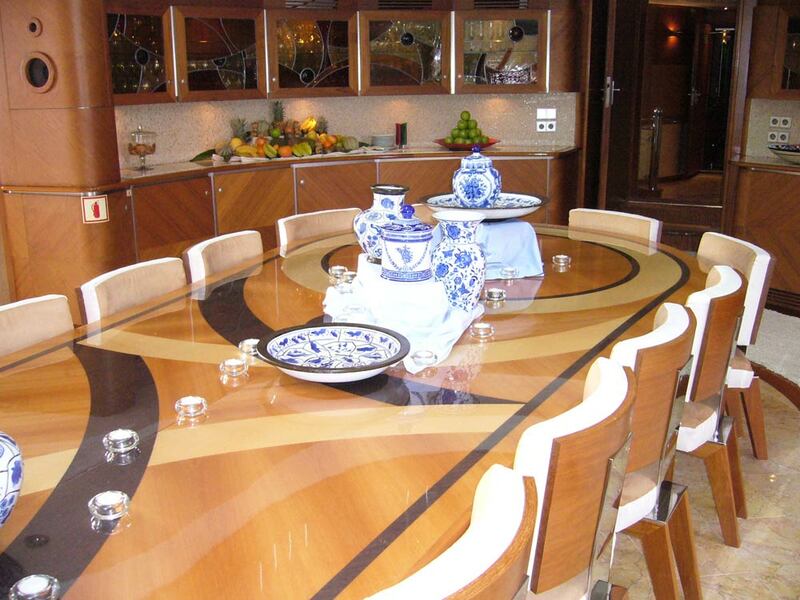 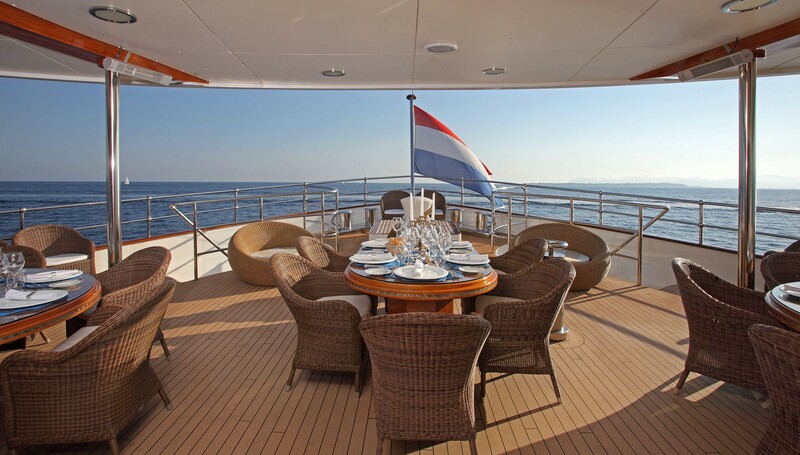 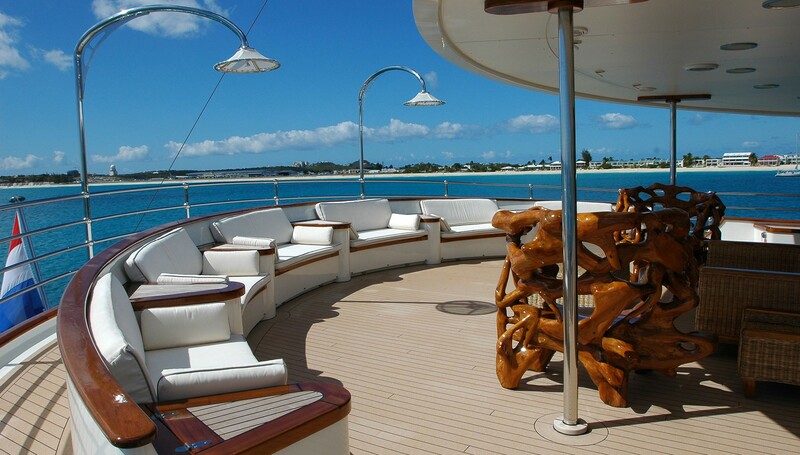 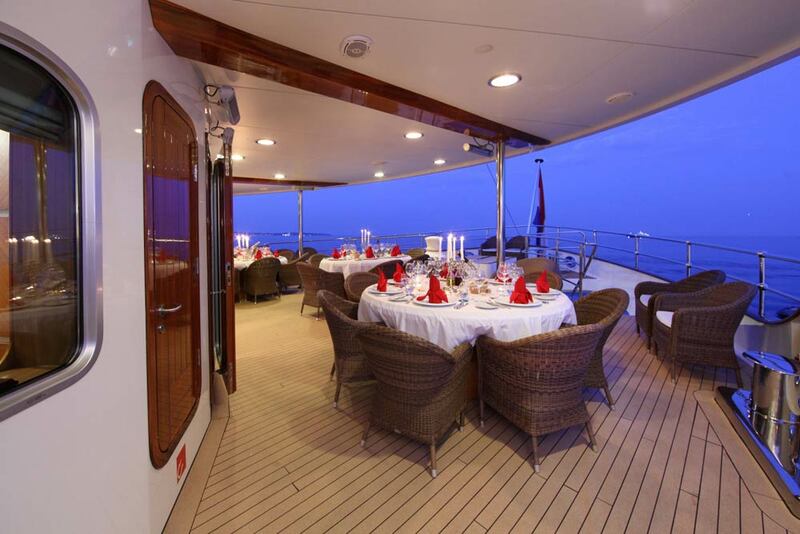 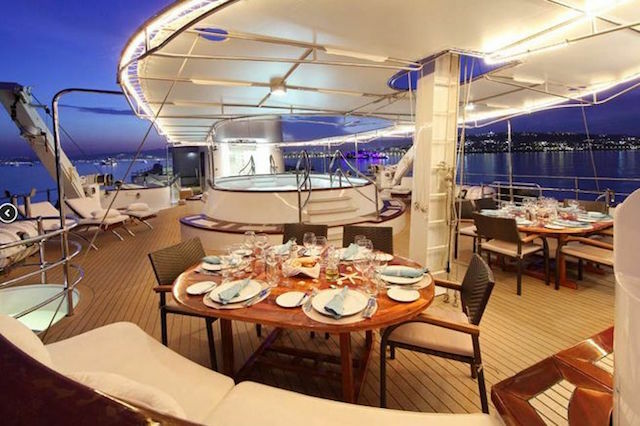 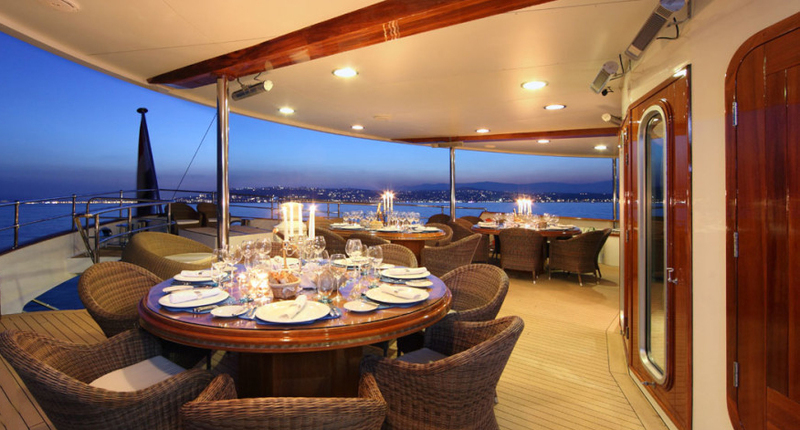 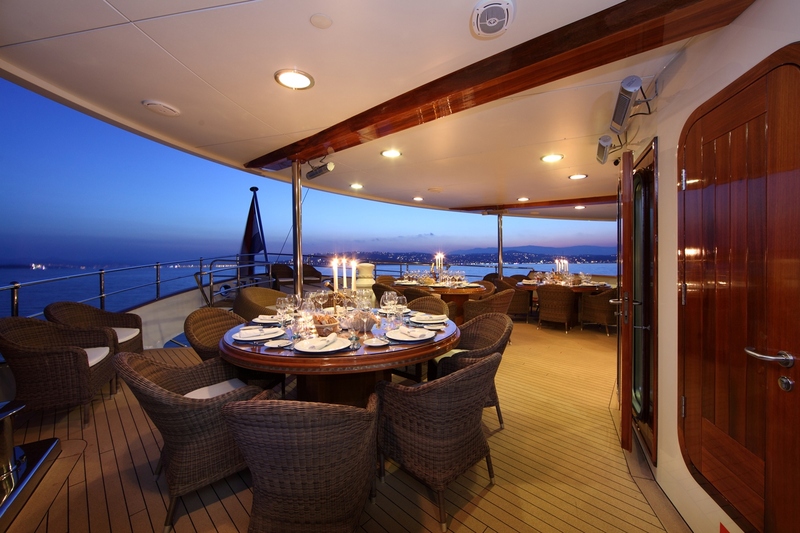 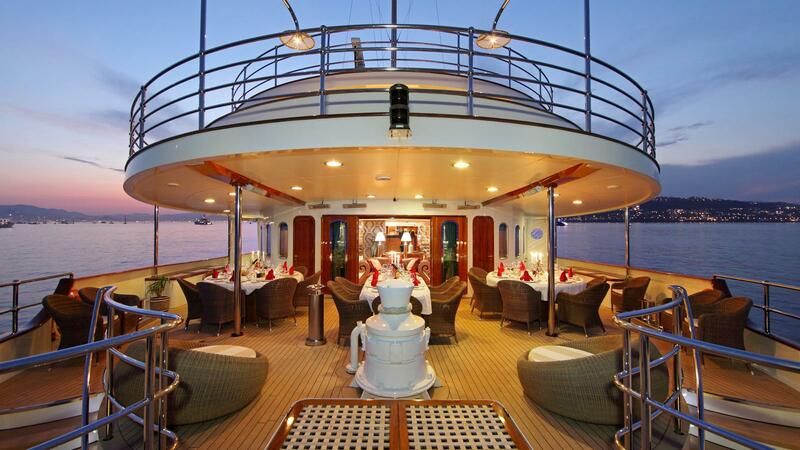 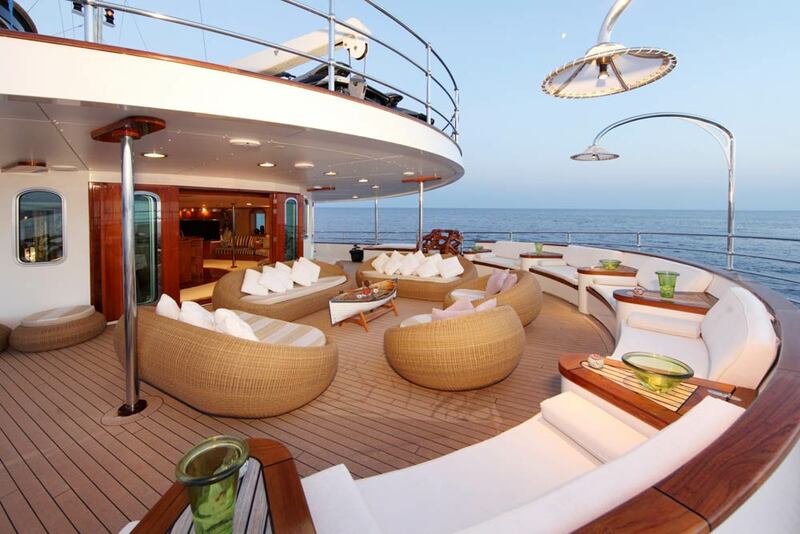 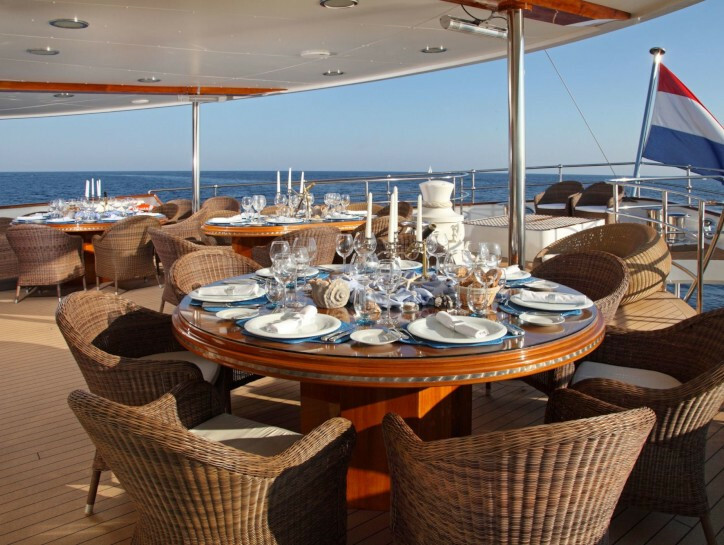 From this area, there is a nice view on the aft deck where the outside dining table is situated. 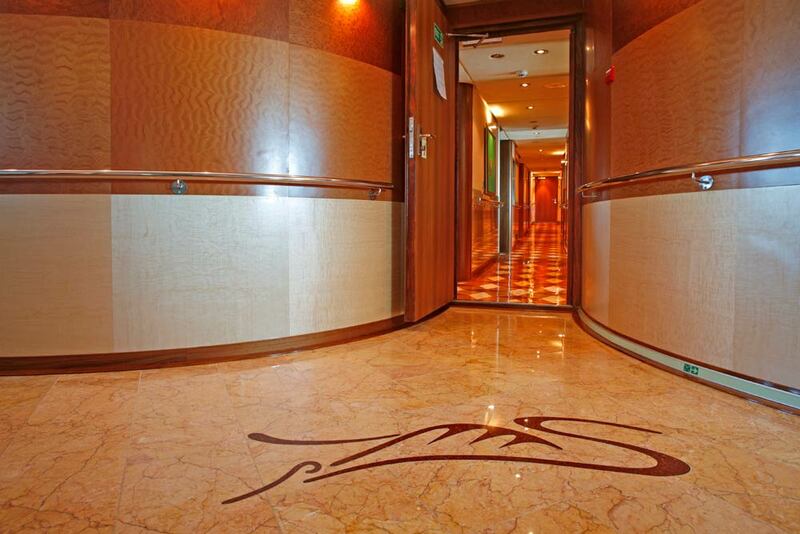 The walk-through this area leads to the vestibule. 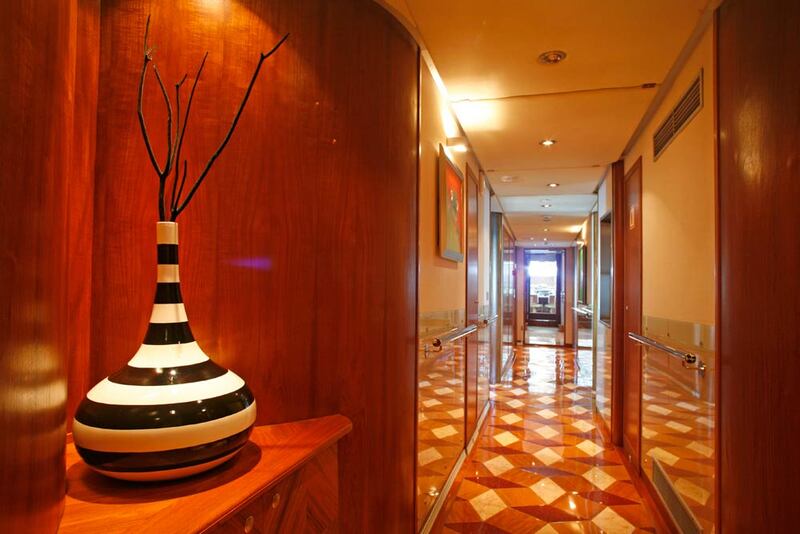 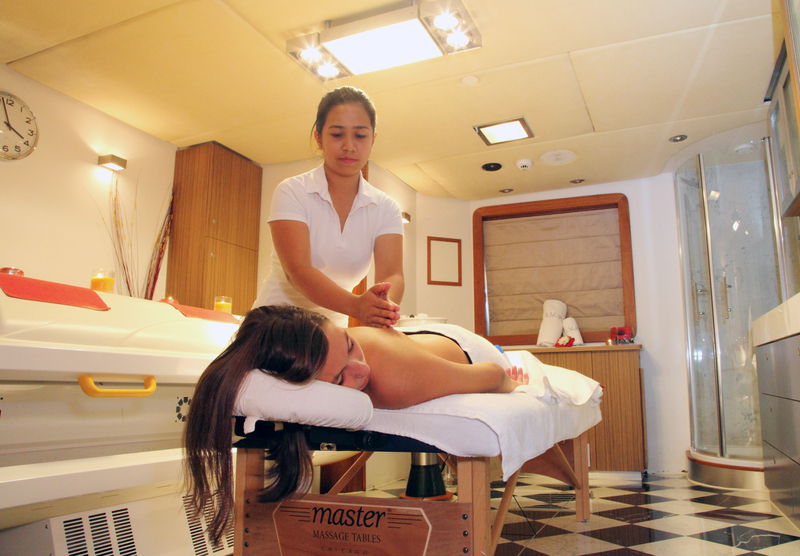 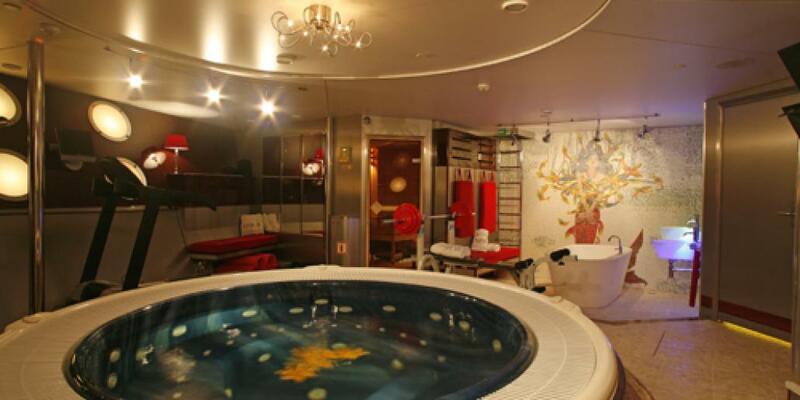 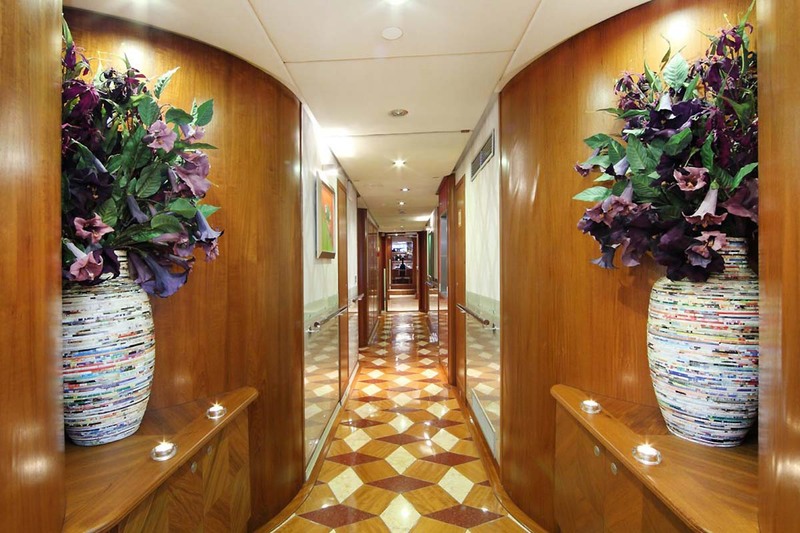 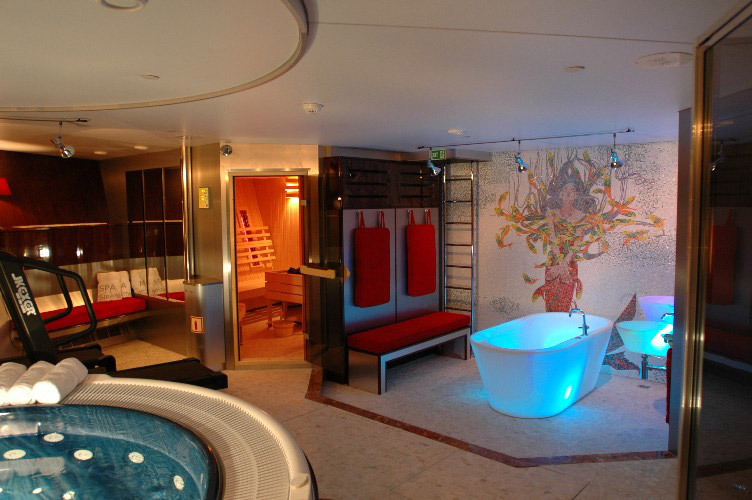 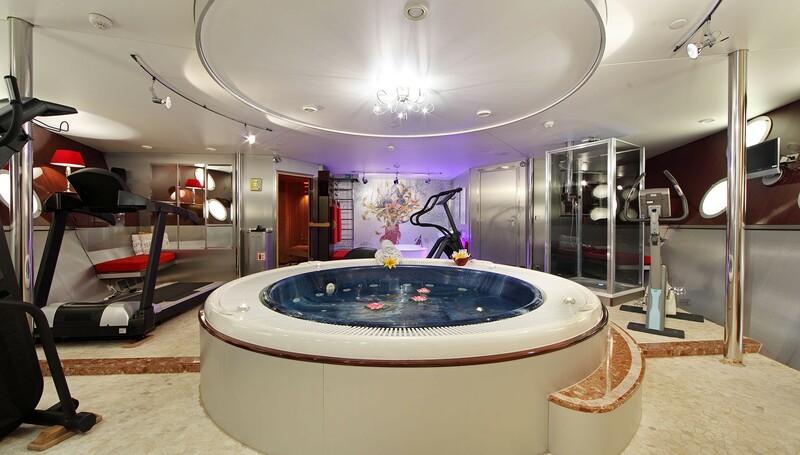 The beauty salon is located down from the vestibule on the accommodation deck, and the fitness-massage, sauna and Spa Pool on the lower deck. 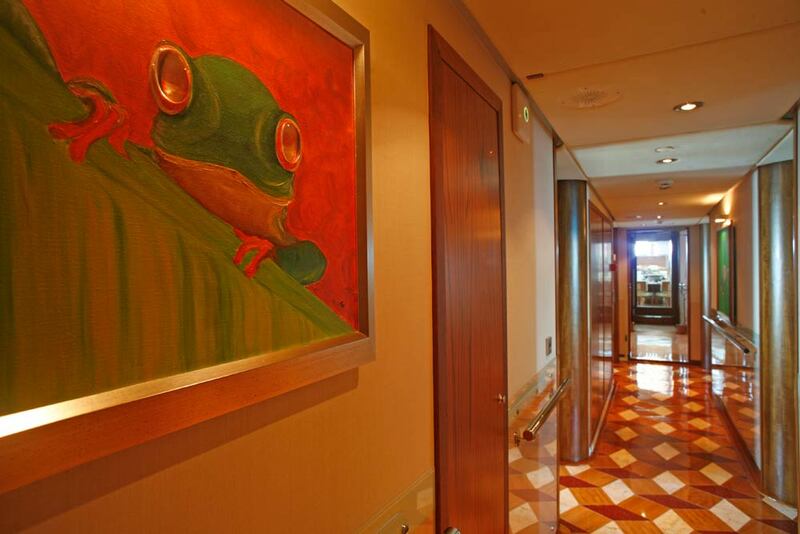 Going straight from the vestibule, there is ladies room on one side and library on the other. 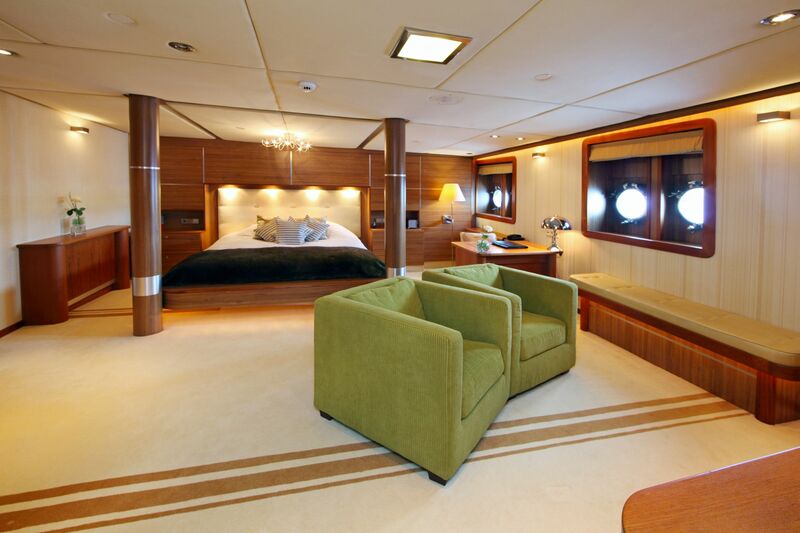 Further, there are two spacious suites. 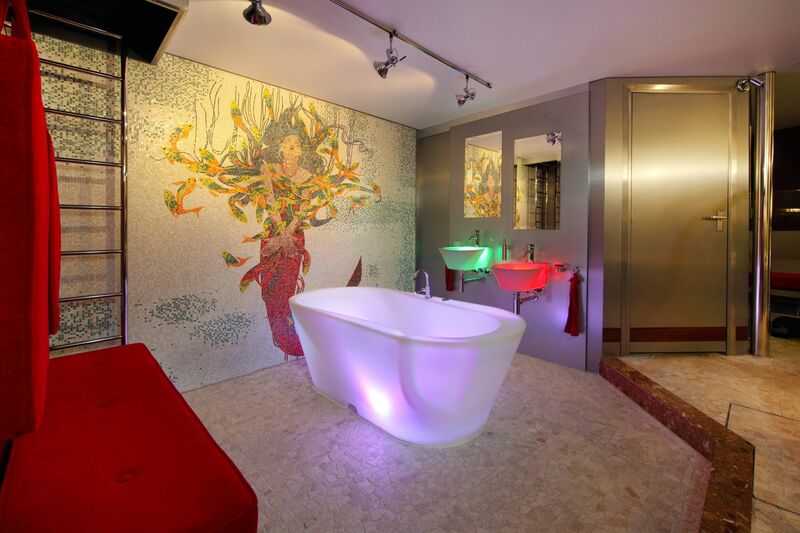 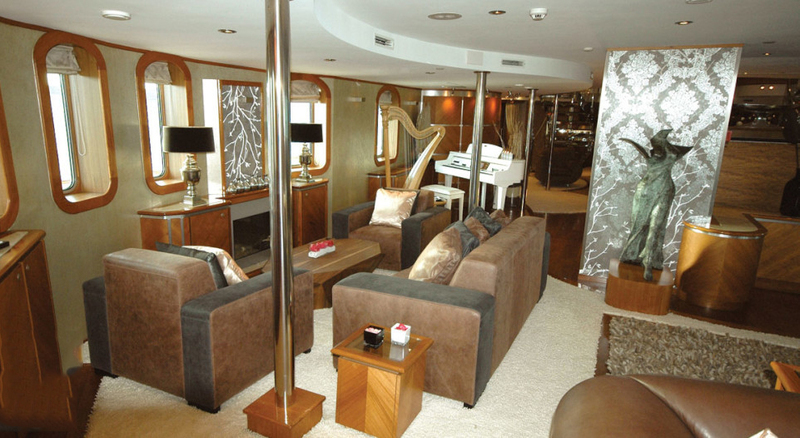 Suites range from 30-50 square meters and are impressive for their decor, style and of course sheer size. 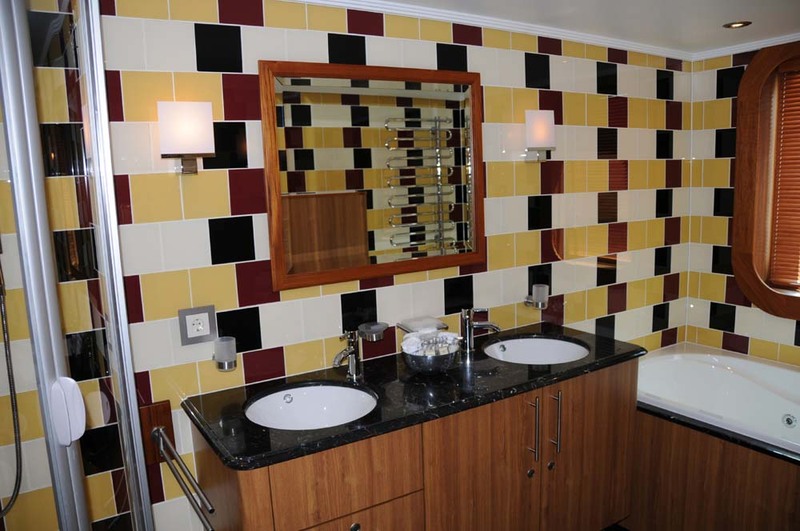 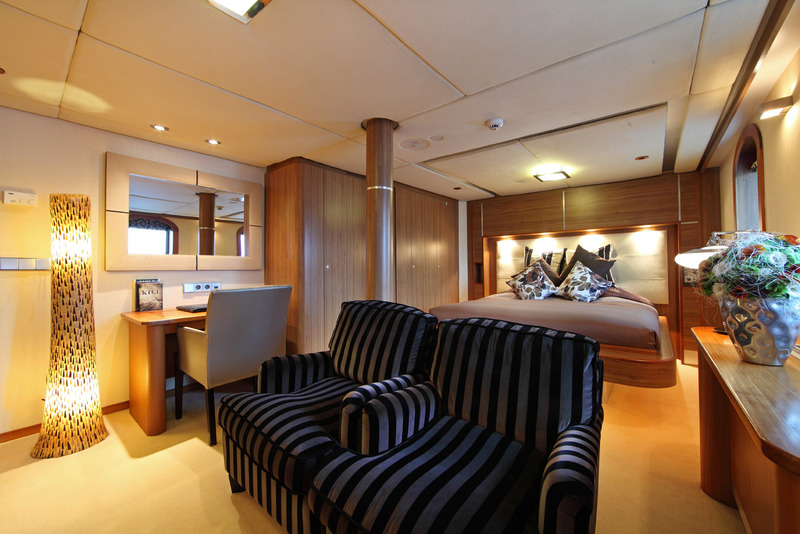 The guests will appreciate absolute privacy, and they must experience all the luxury of a 5-star accommodation. 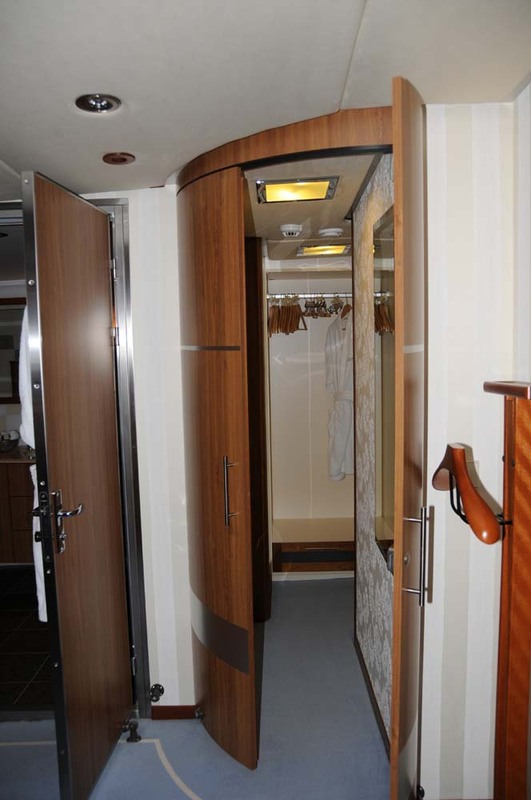 There is also a children’s themed cabin and a security cabin. 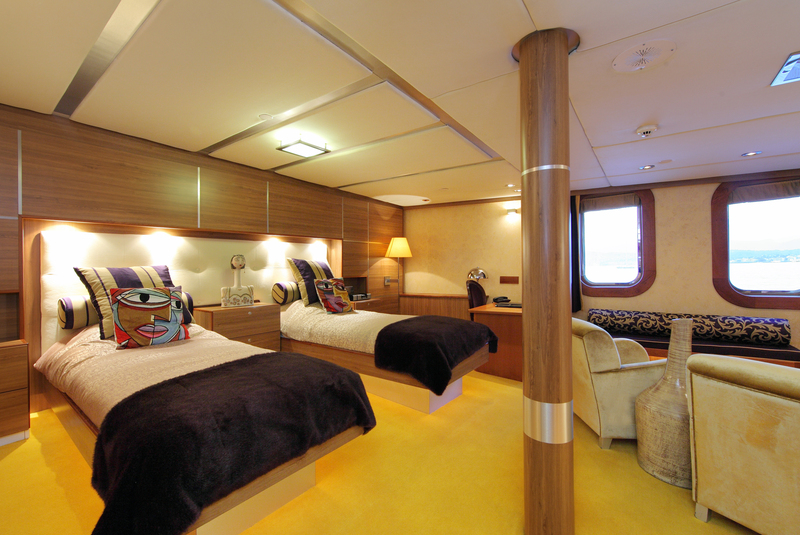 These cabins are connected with the two suites next door, but can also be used completely separately. 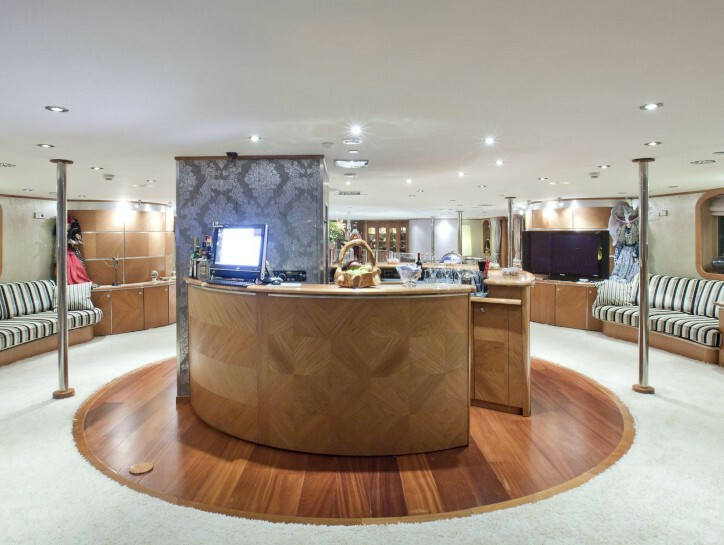 The beauty salon is also fully equipped hair- and nail studio. 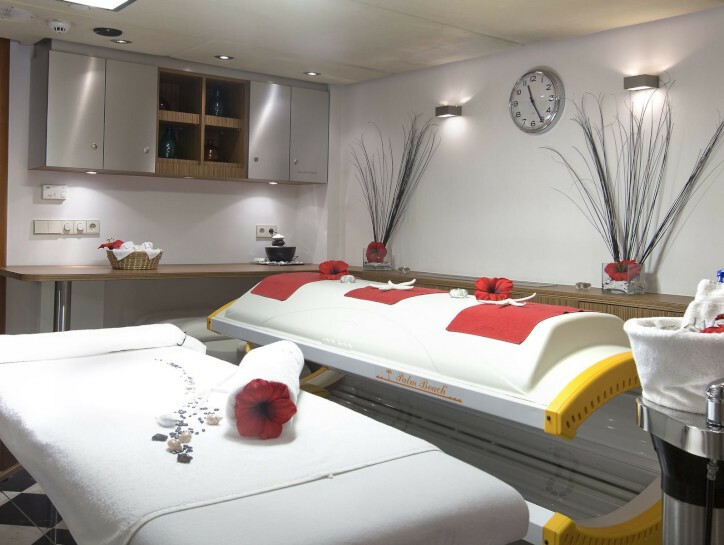 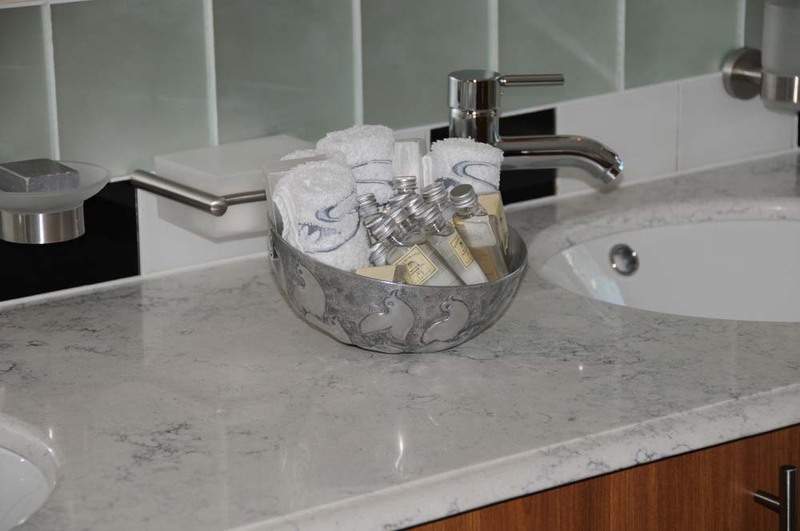 So the guests can be pampered as much as they want! 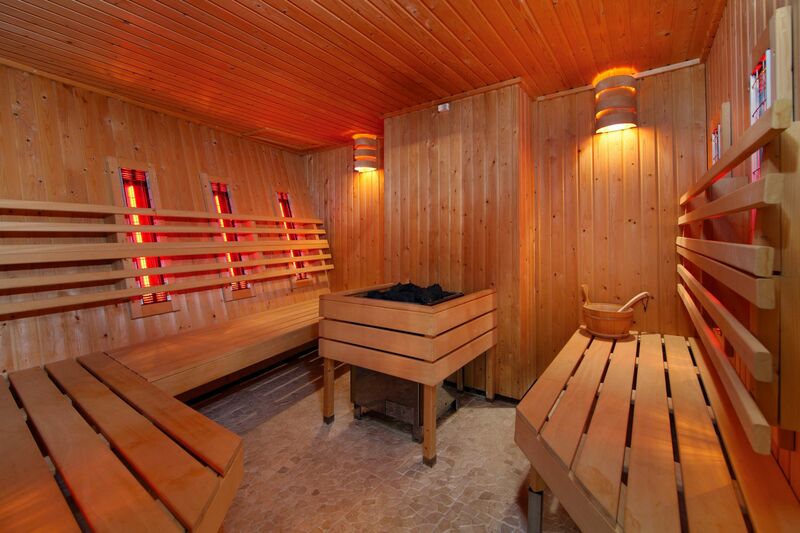 More relaxation and pampering await at the Sauna and large Spa pool at the Spa centre. 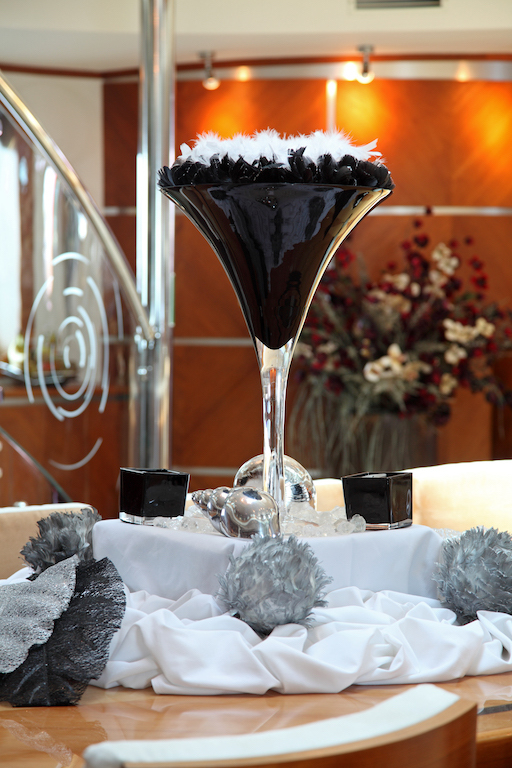 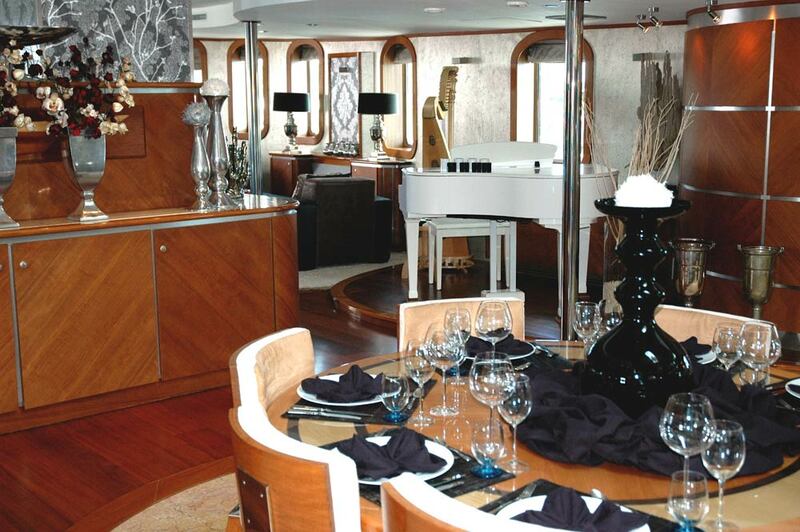 Refreshing drinks are served at the bar, where charter guests can get together for an aperitif before tasting some gastronomic delight, specially prepared by the chef on board. 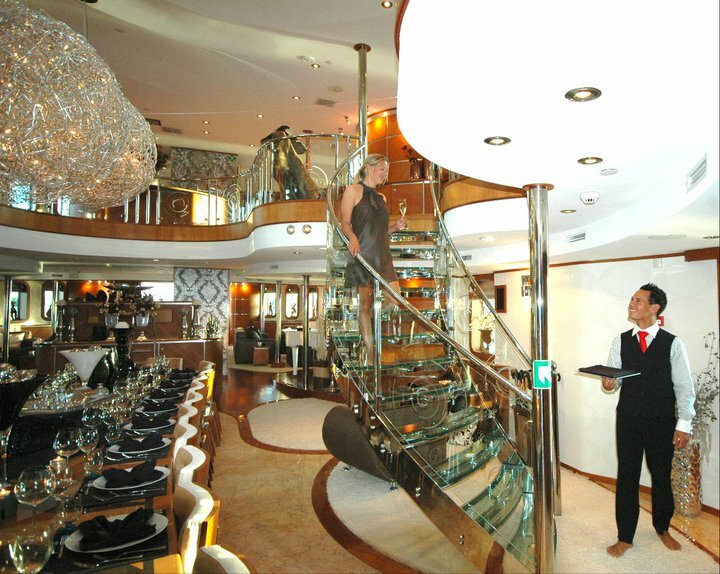 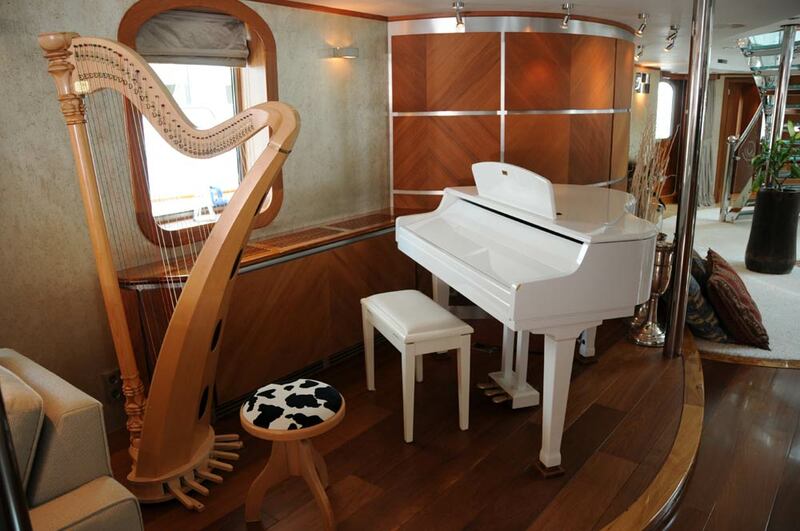 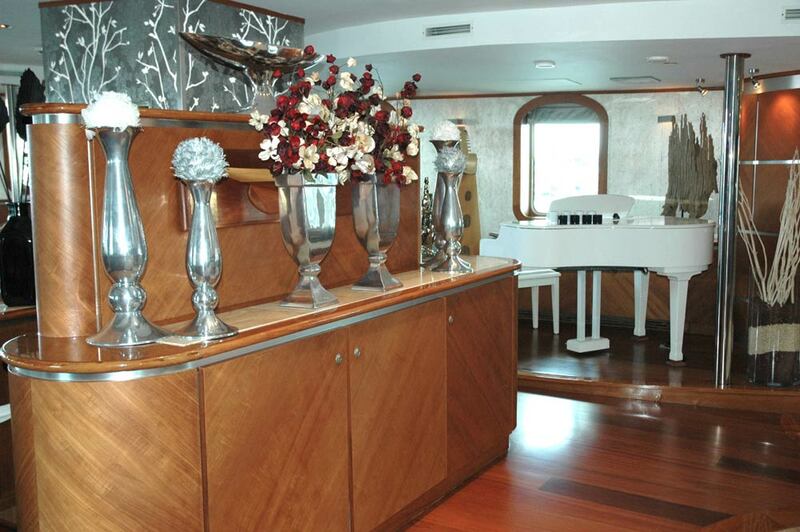 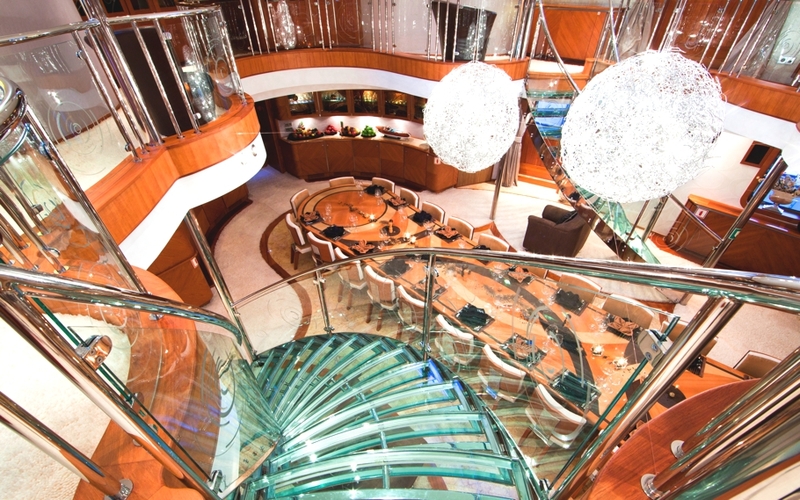 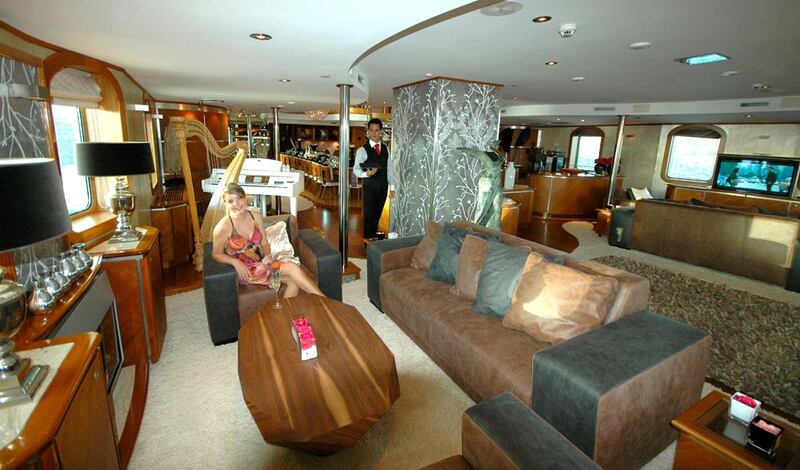 The owner's deck salon is further furnished with exclusive and comfortable chairs, a bar with an integrated piano and a dance floor for the ultimate fun. During the daytime, this area will be quite popular! 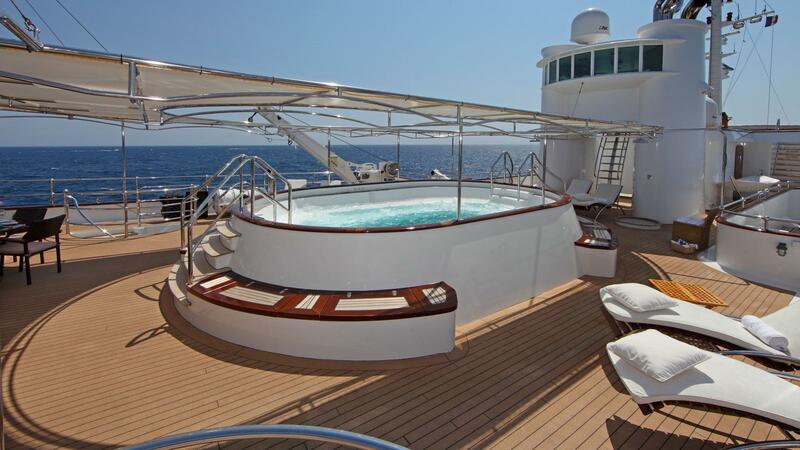 It is great for reading and relaxing when the sun is too hot or having a drink or playing some chess. 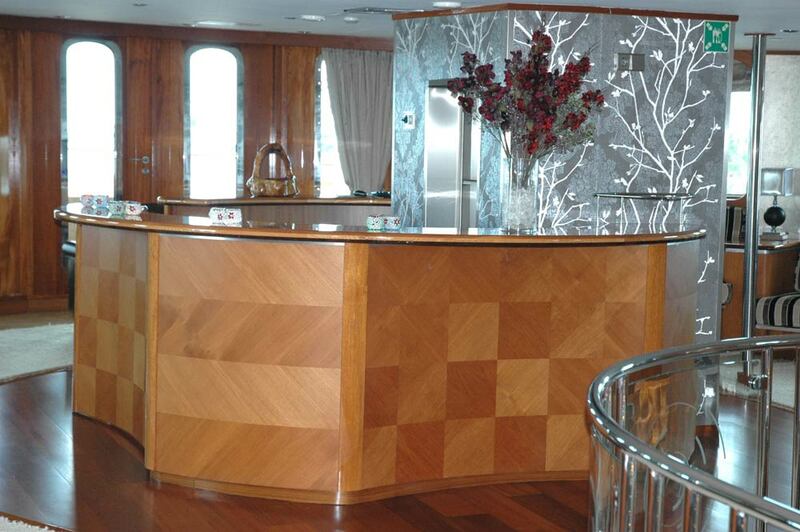 During the night this saloon will be perfect for having swinging cocktails before dinner. 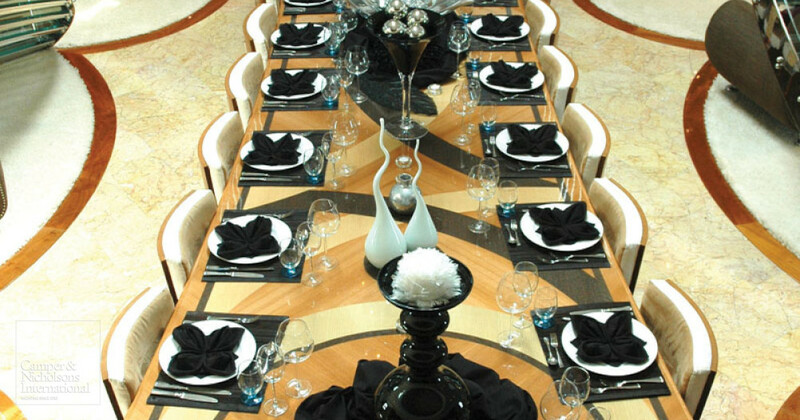 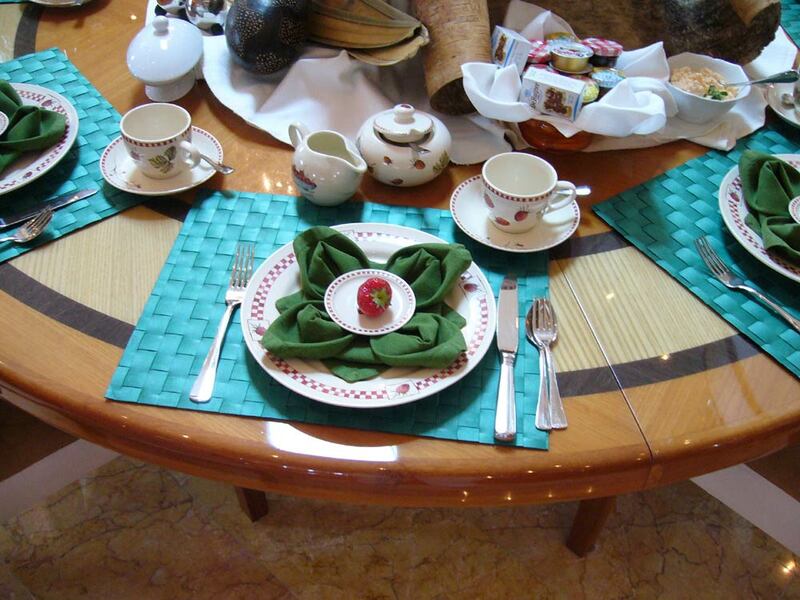 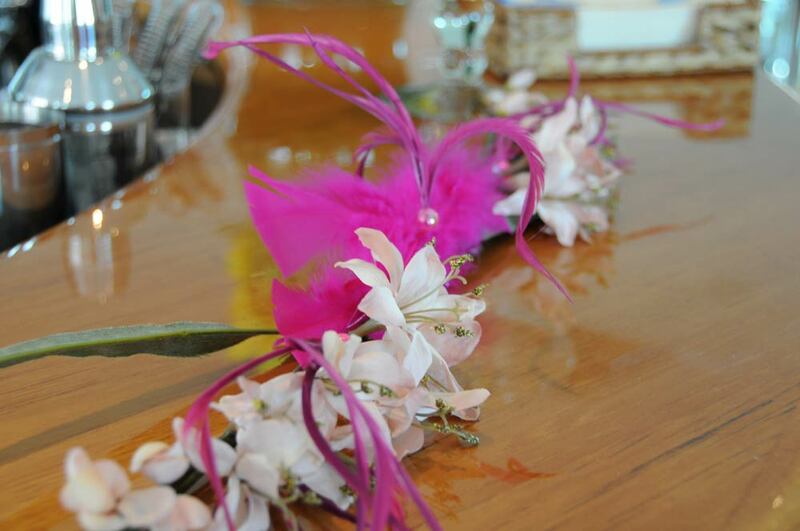 In the meantime, the crew can set a wonderfully decorated table for dinner. 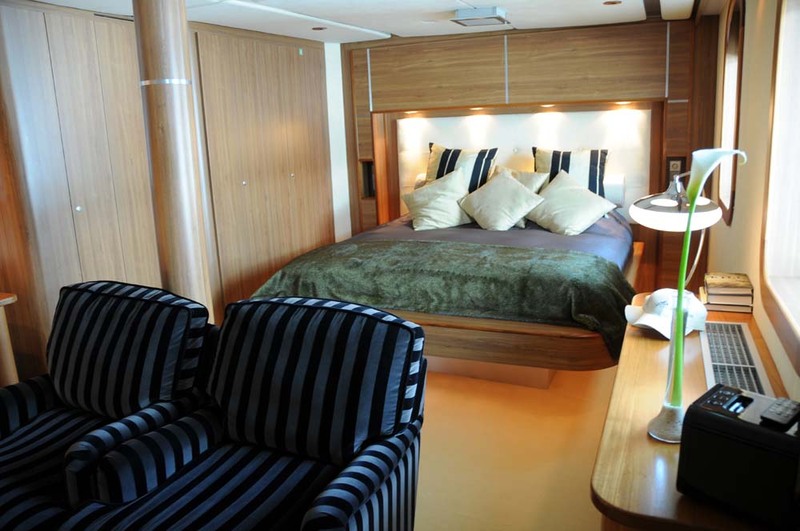 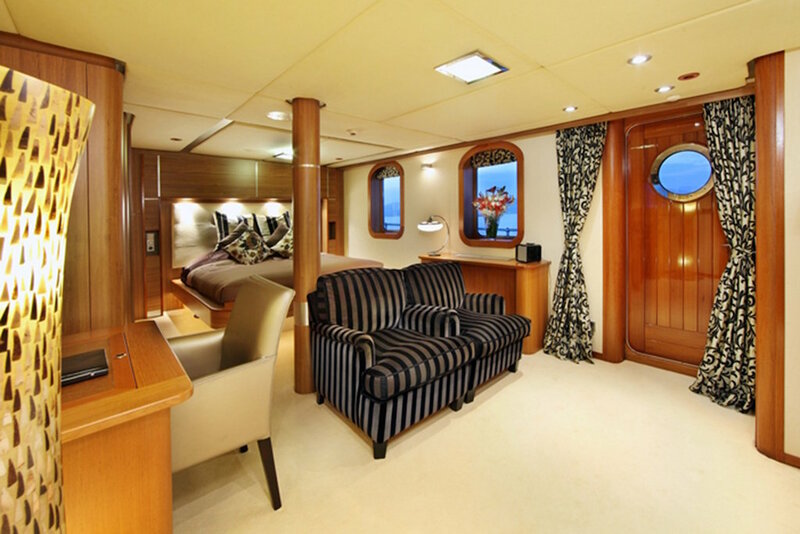 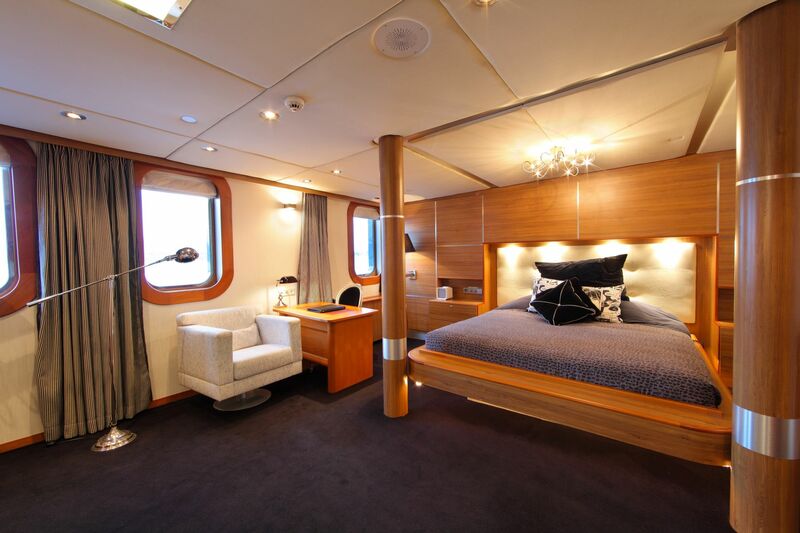 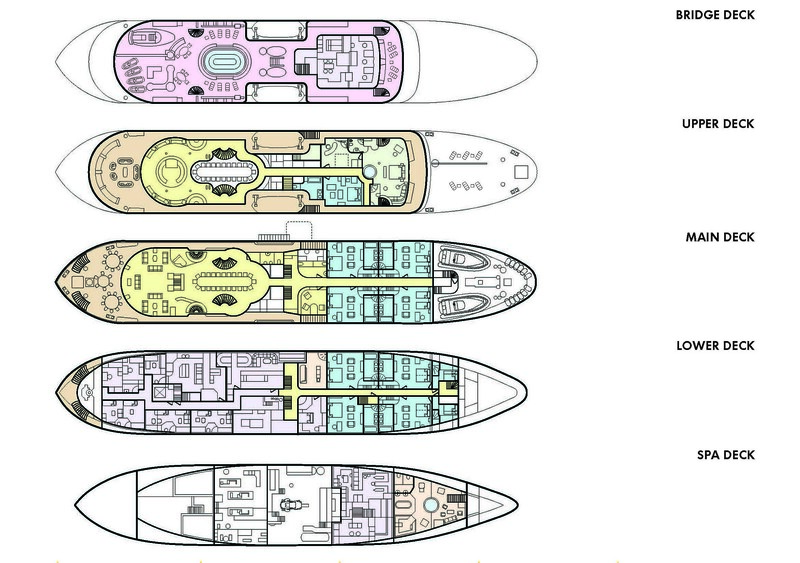 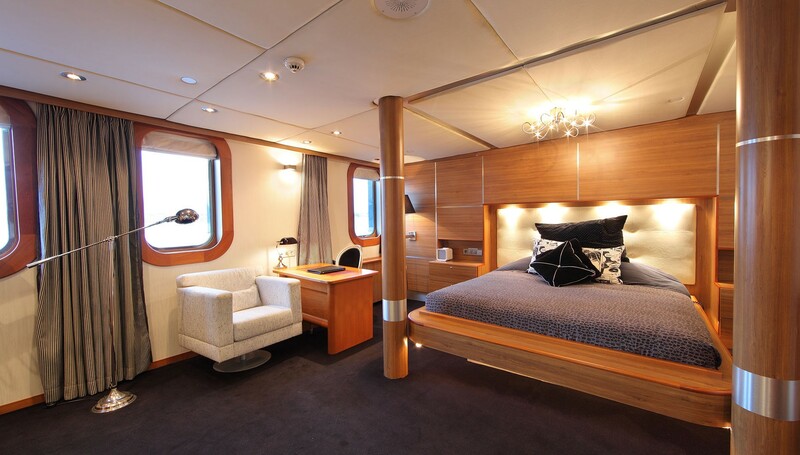 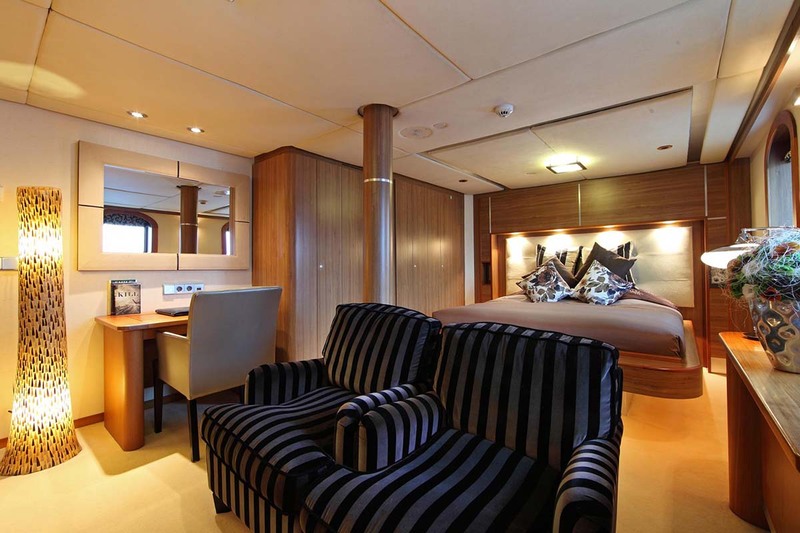 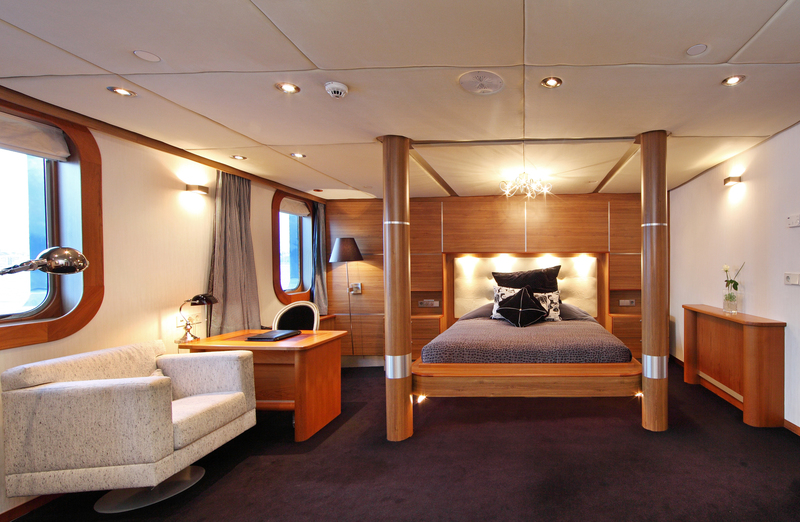 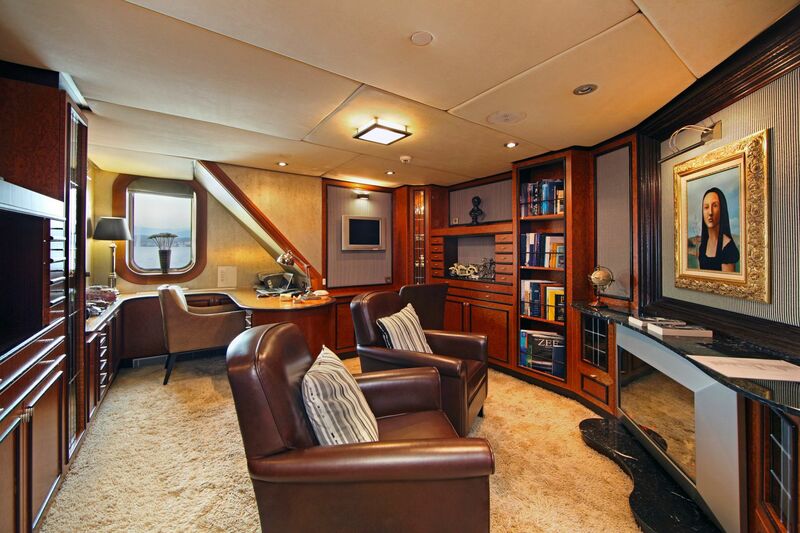 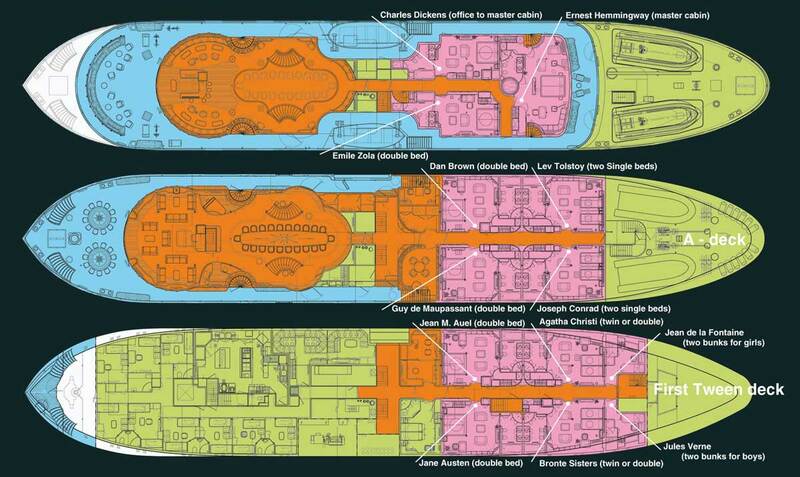 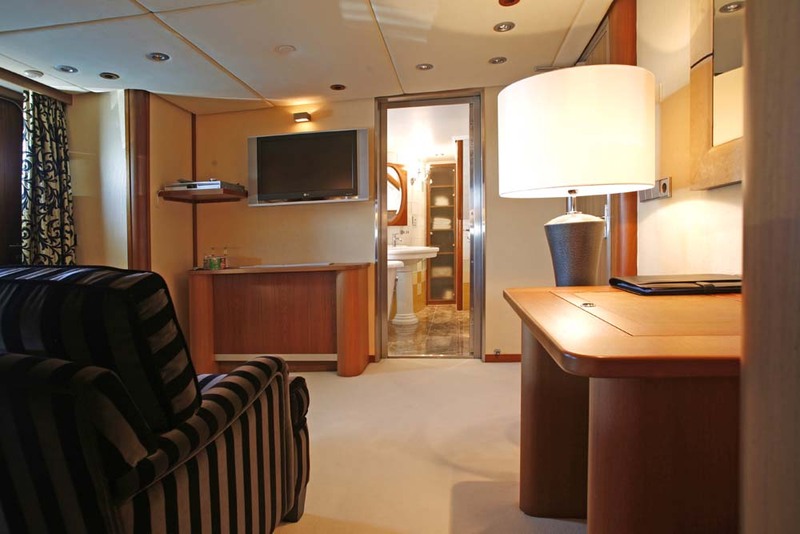 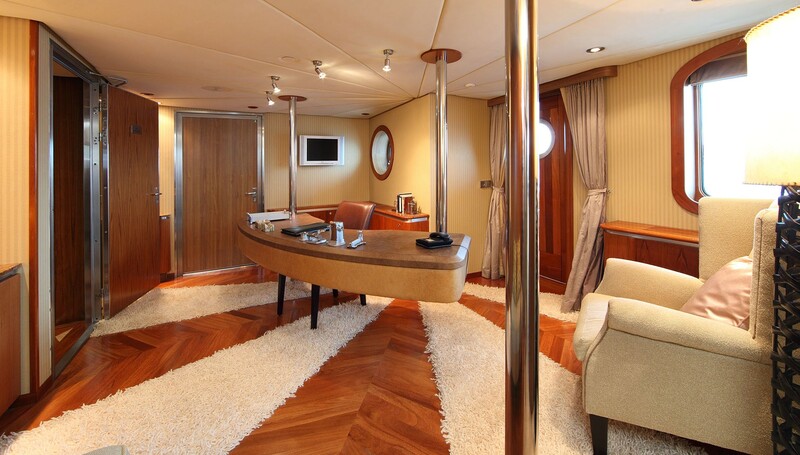 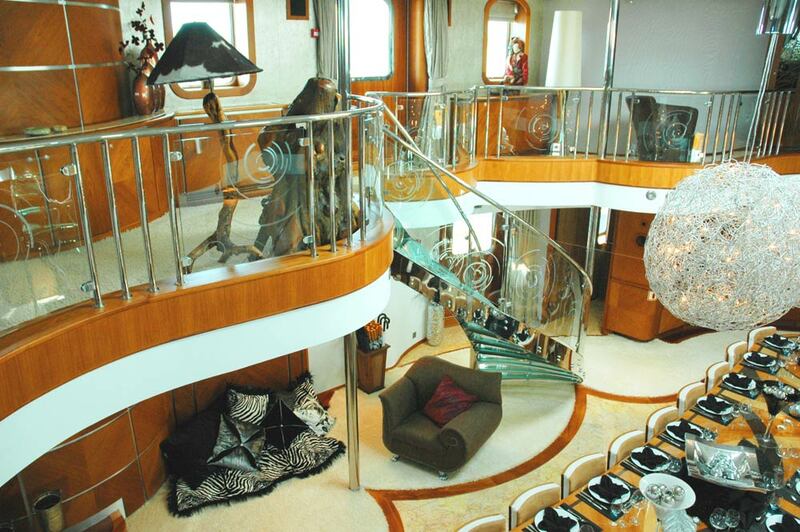 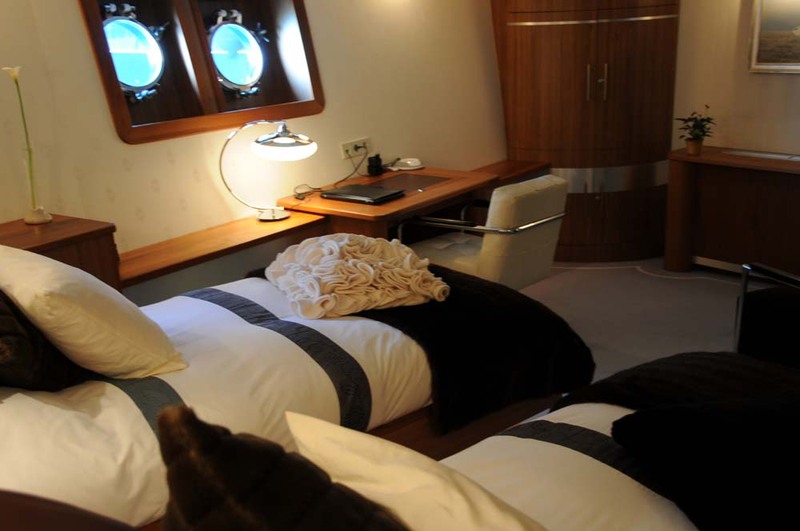 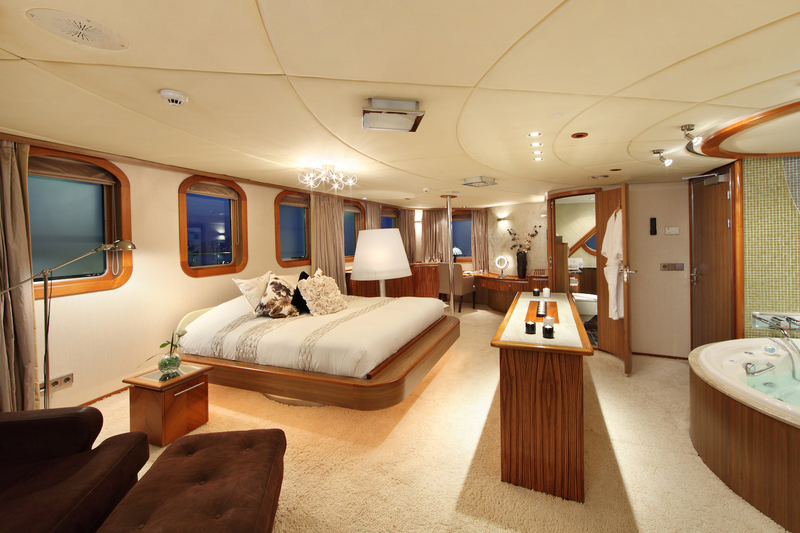 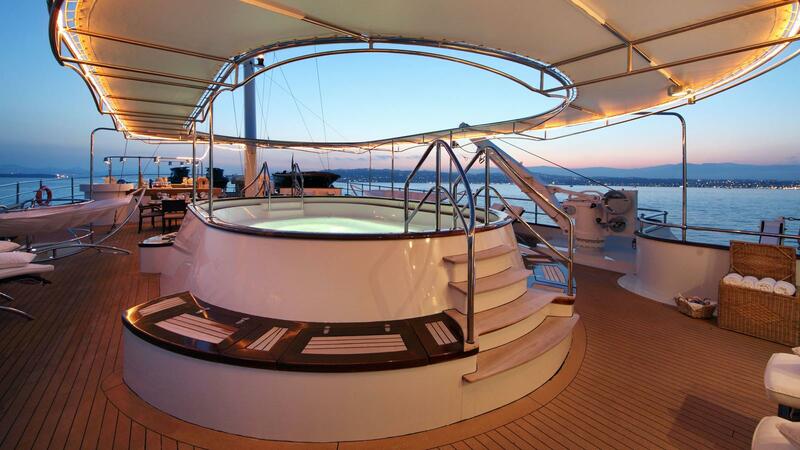 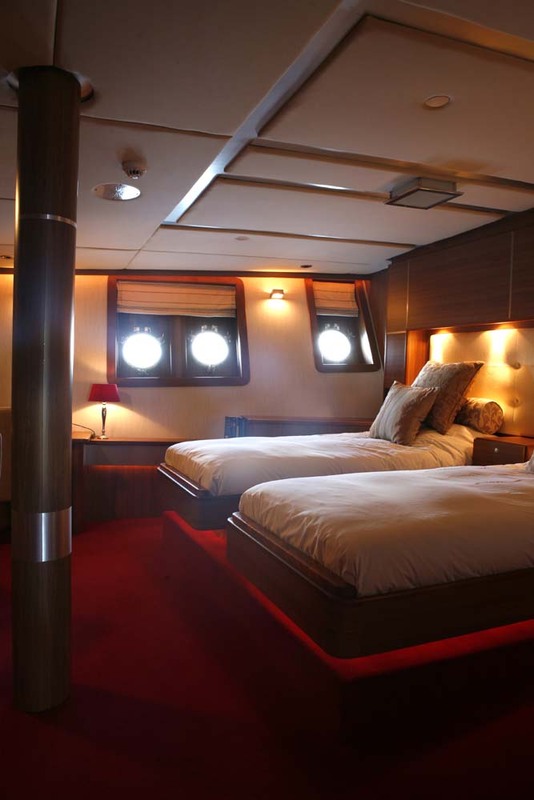 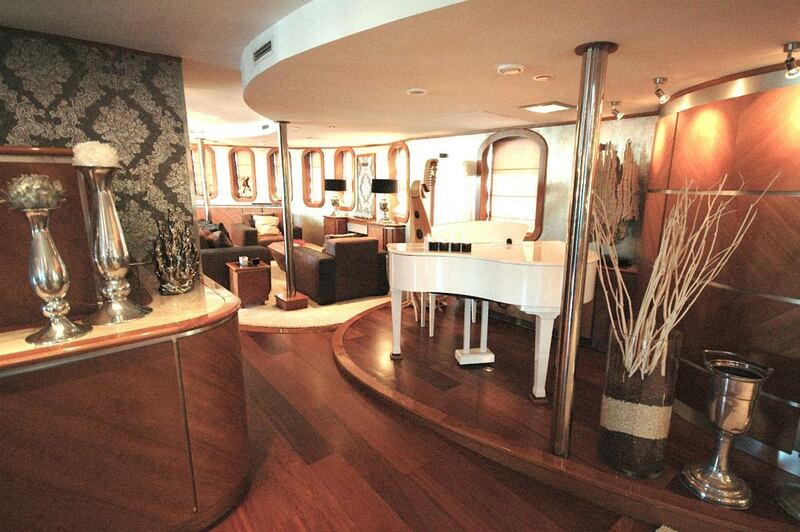 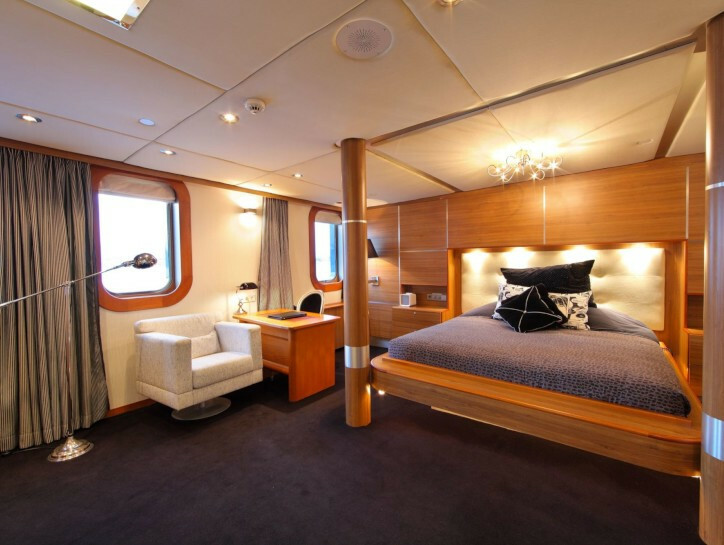 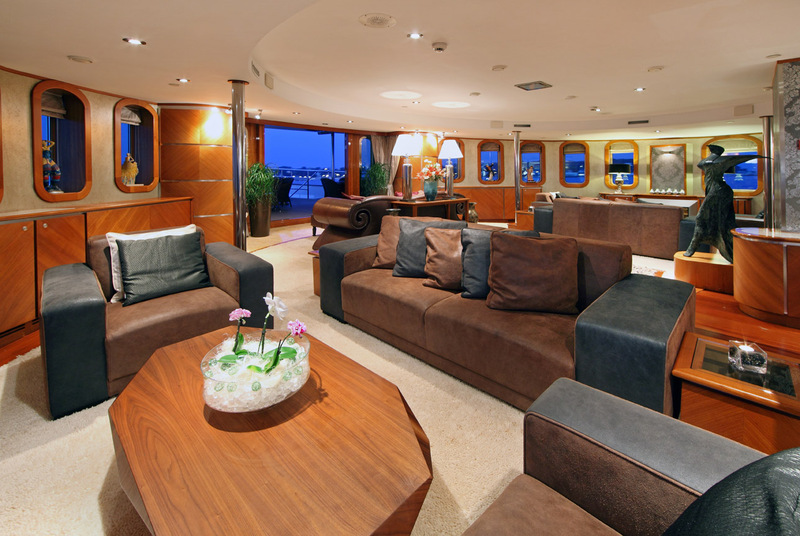 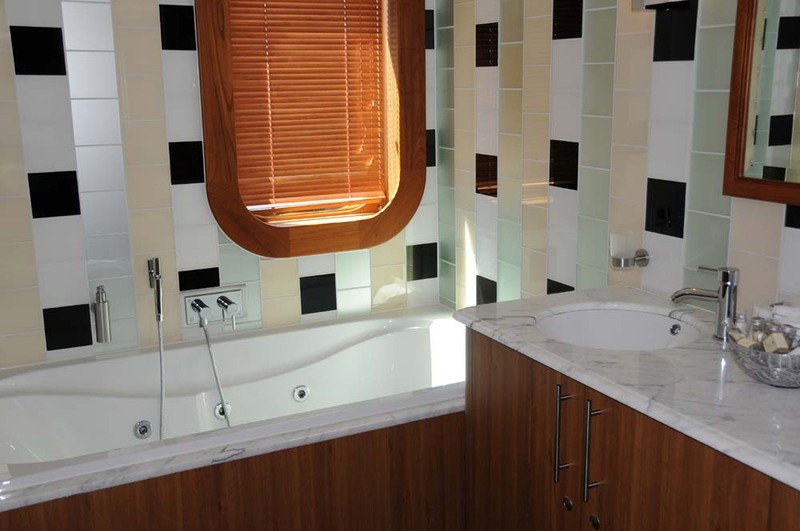 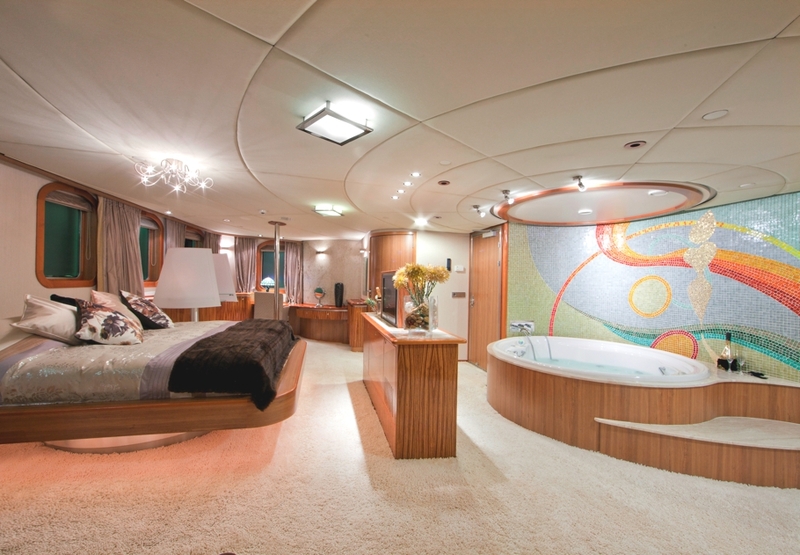 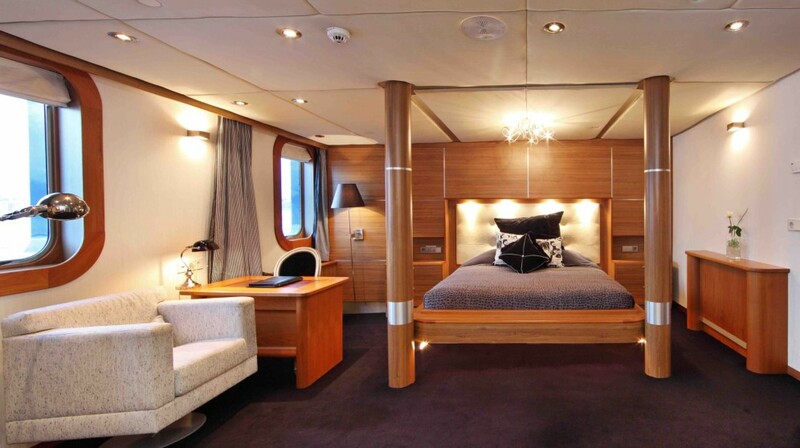 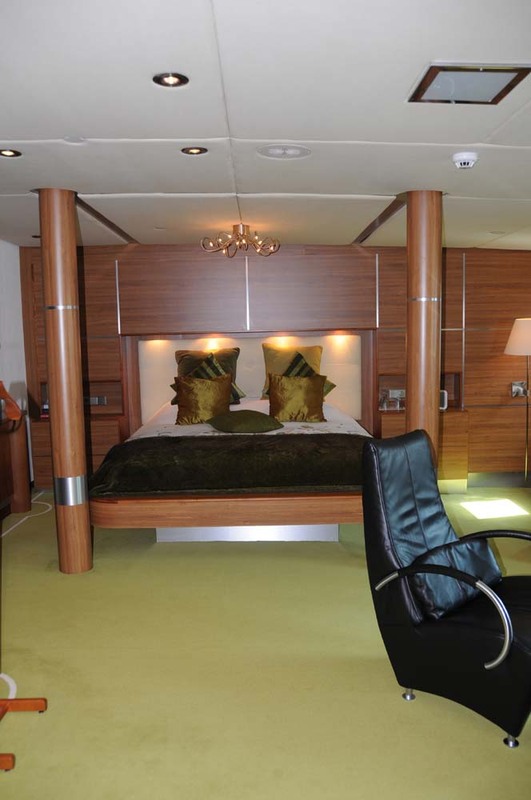 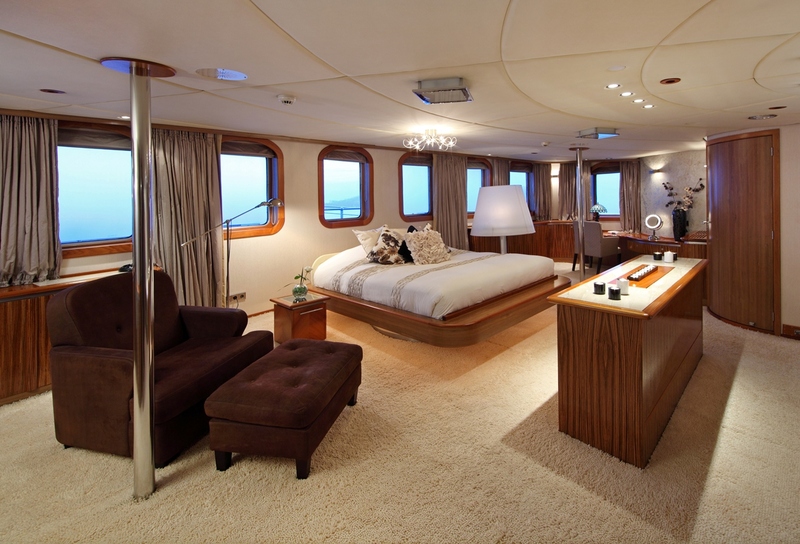 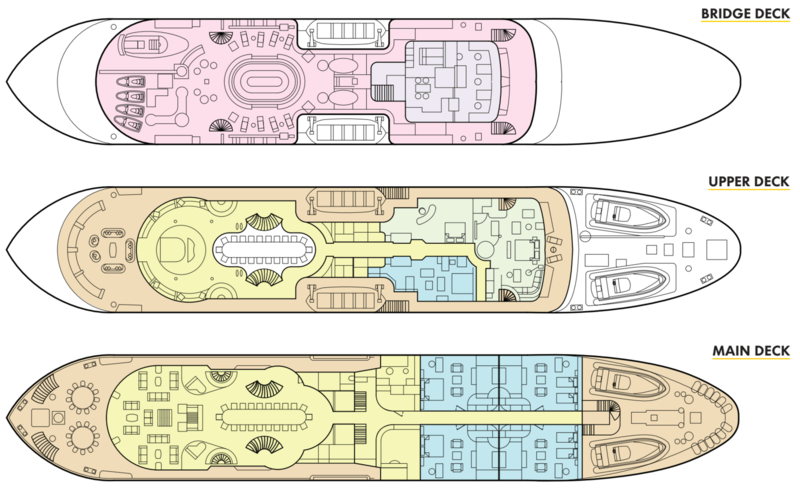 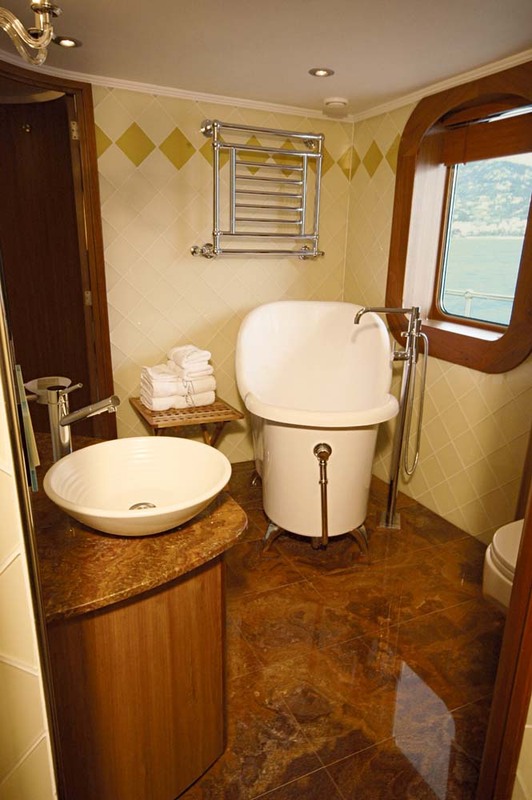 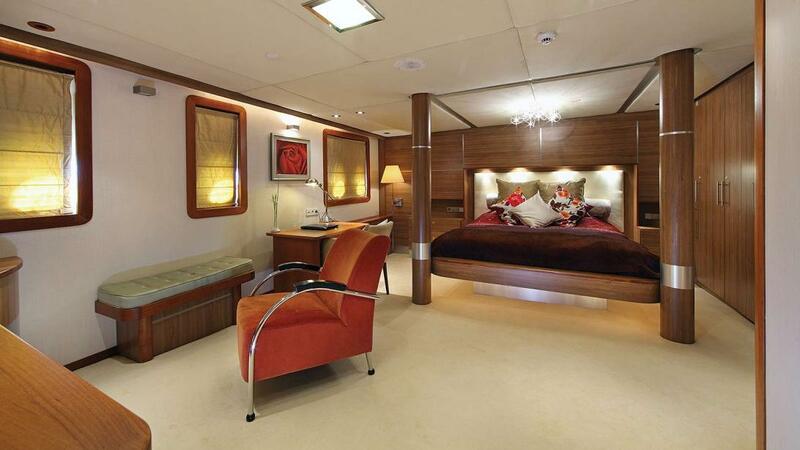 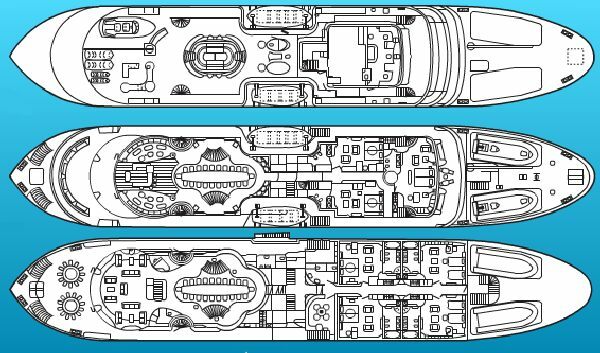 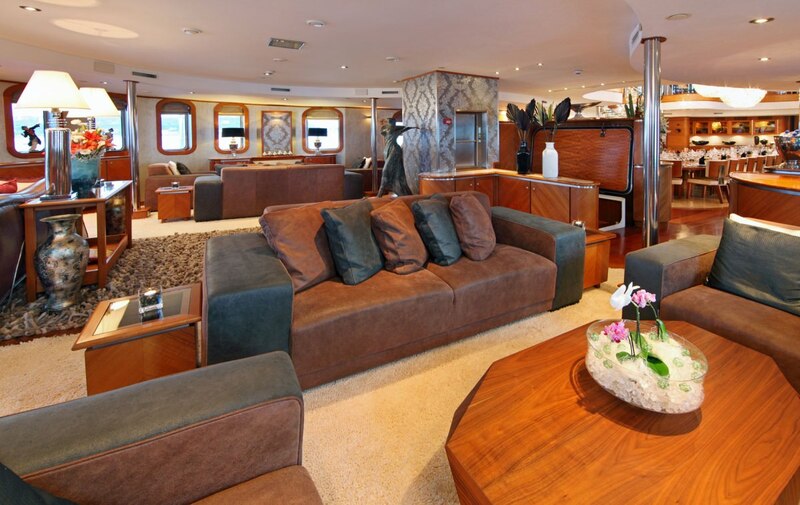 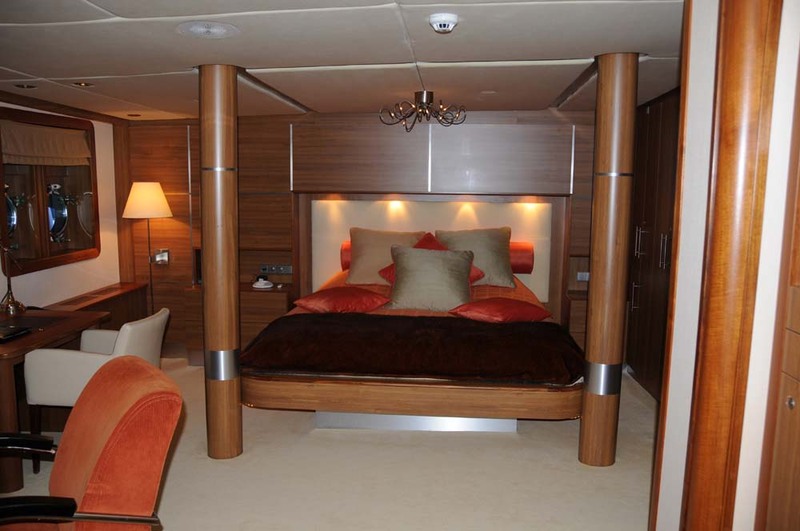 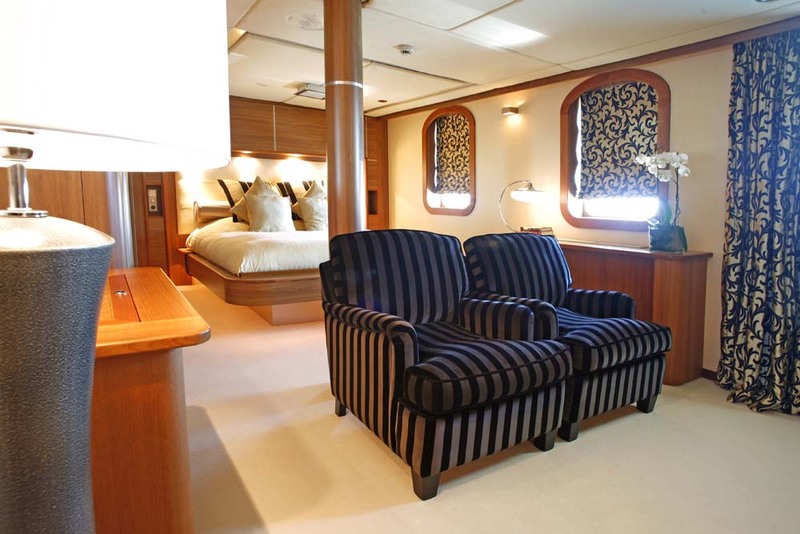 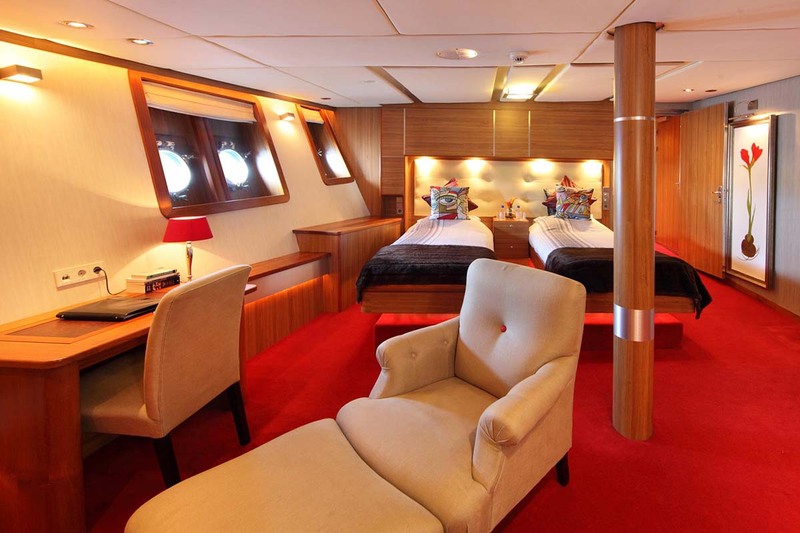 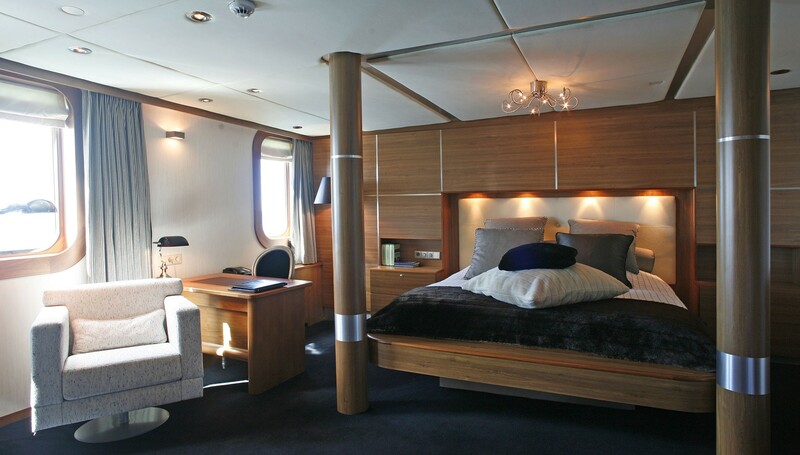 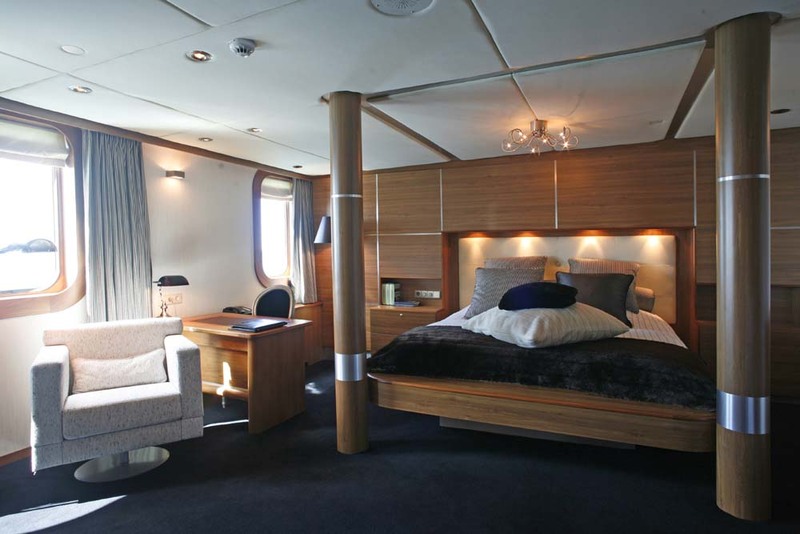 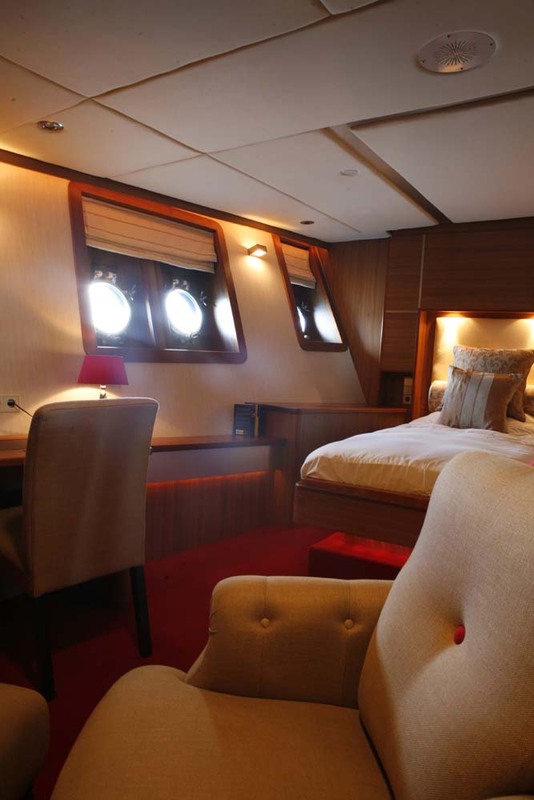 Besides the saloon, the owner's deck contains two suites of 31 m2 and 1 Master Cabin of almost 51 m2! 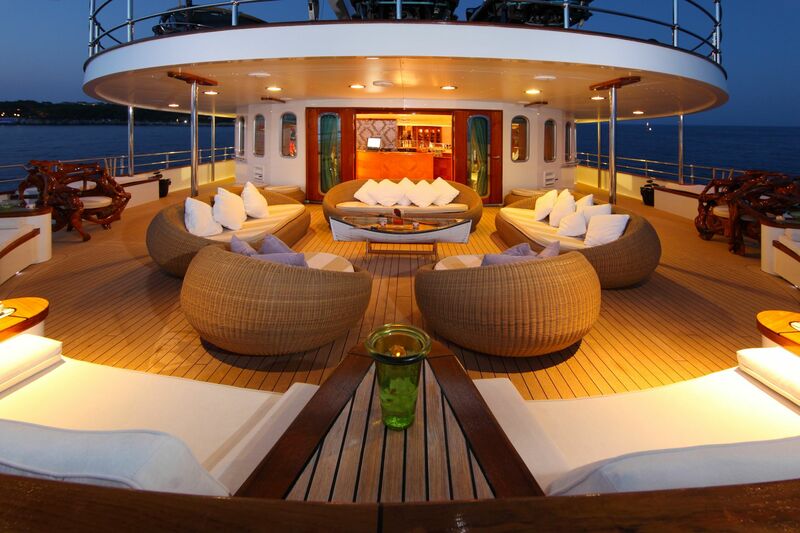 This deck is completely outfitted for the owner with a huge study. 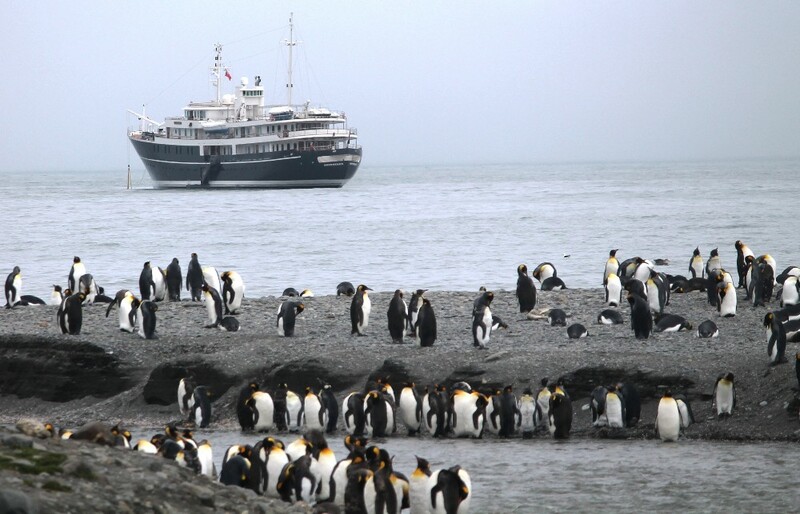 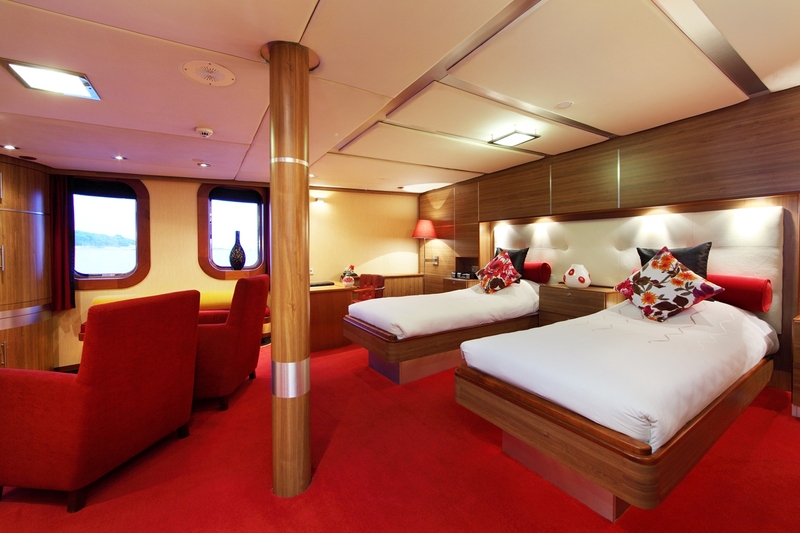 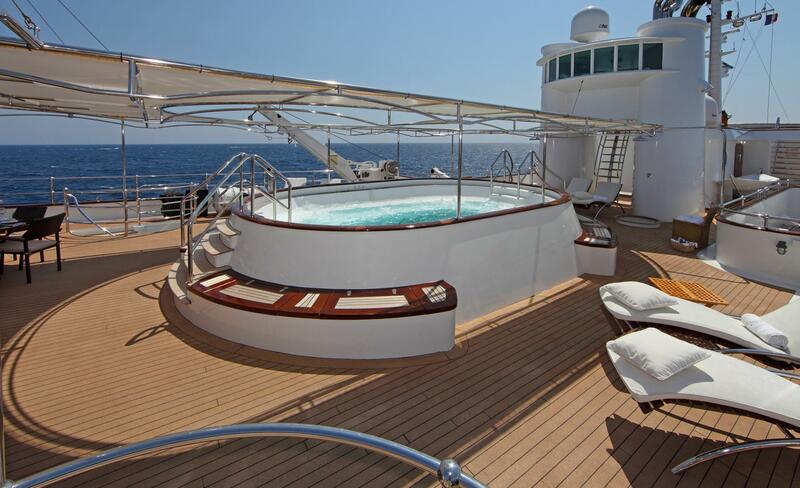 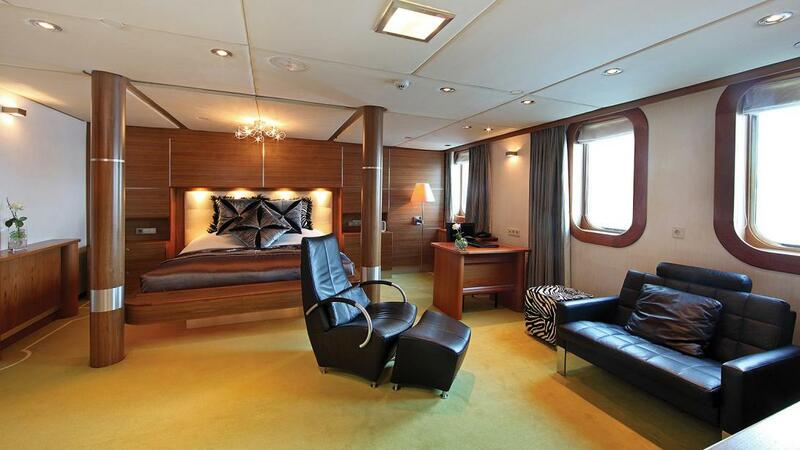 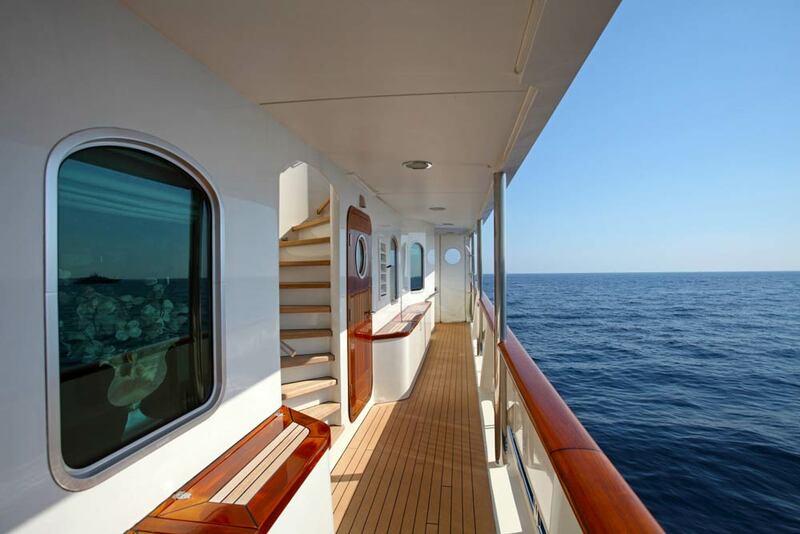 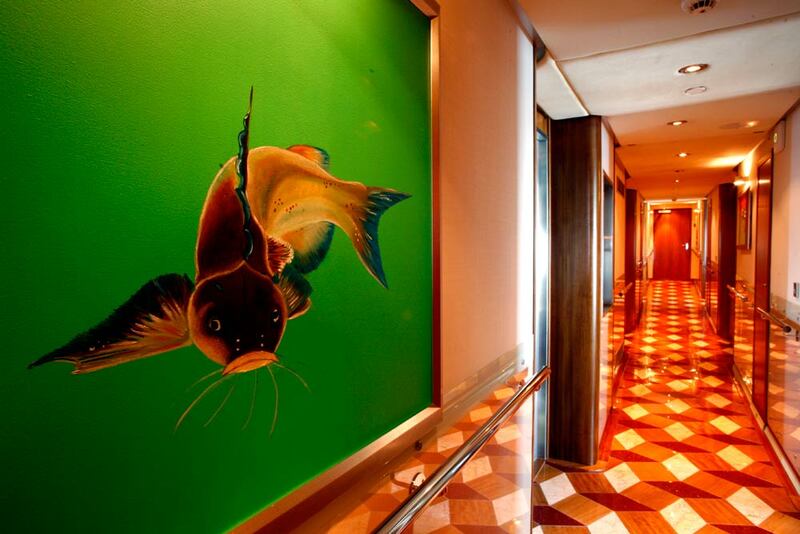 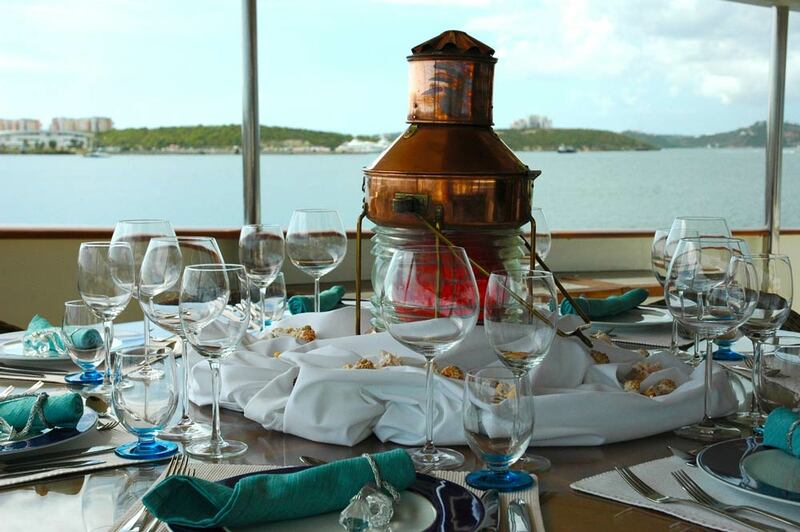 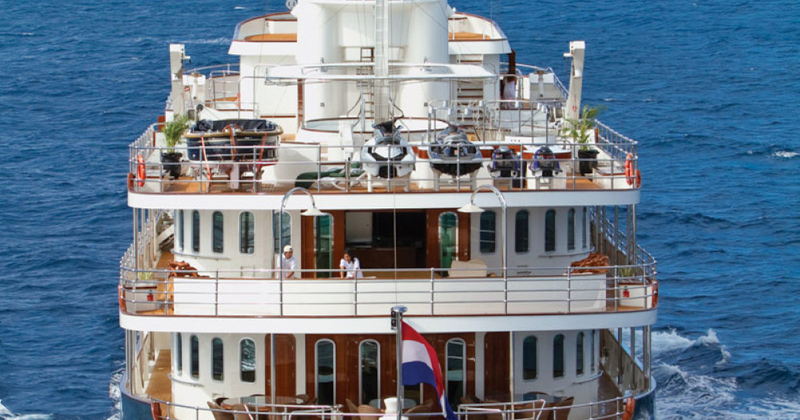 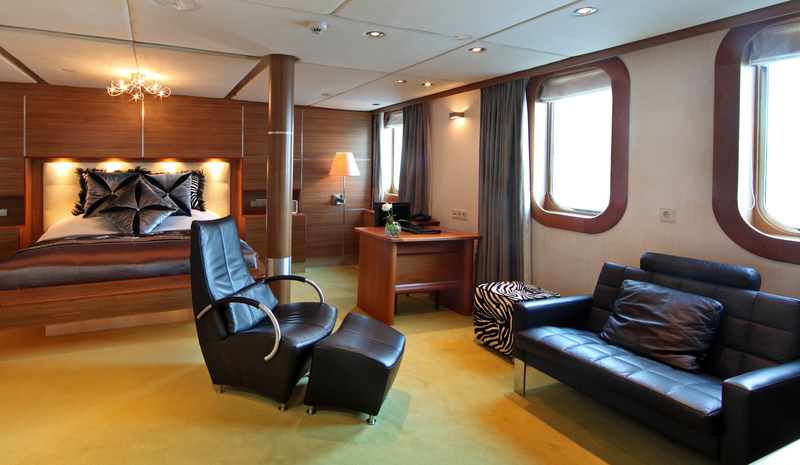 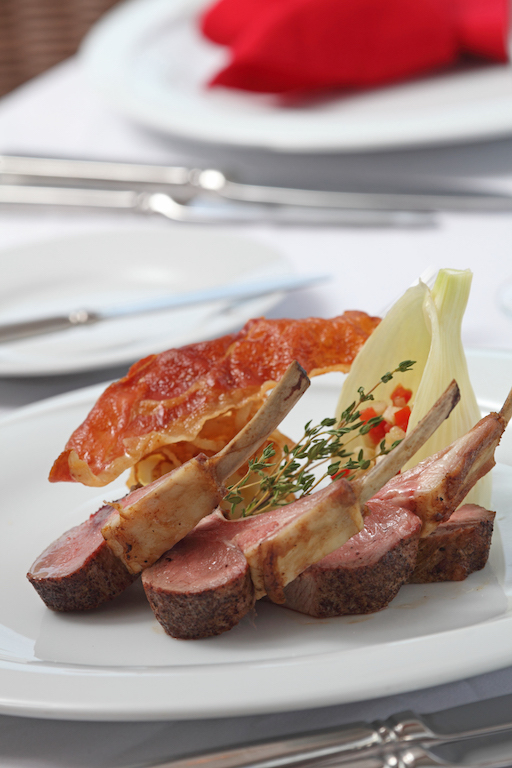 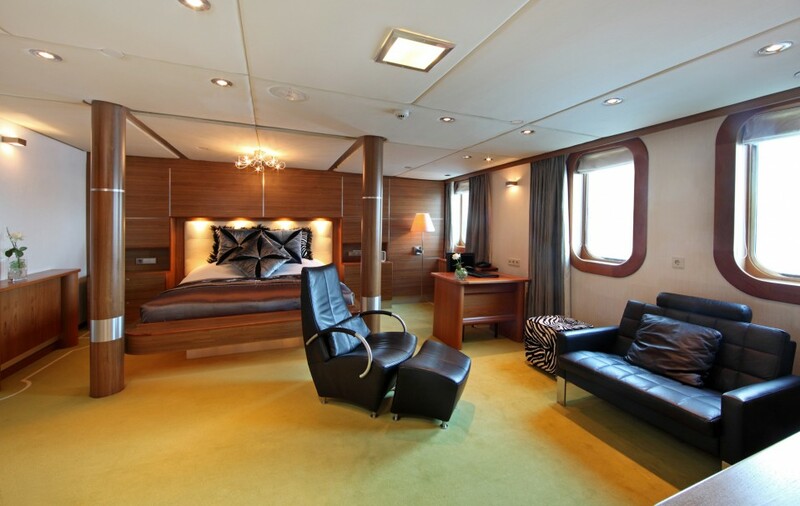 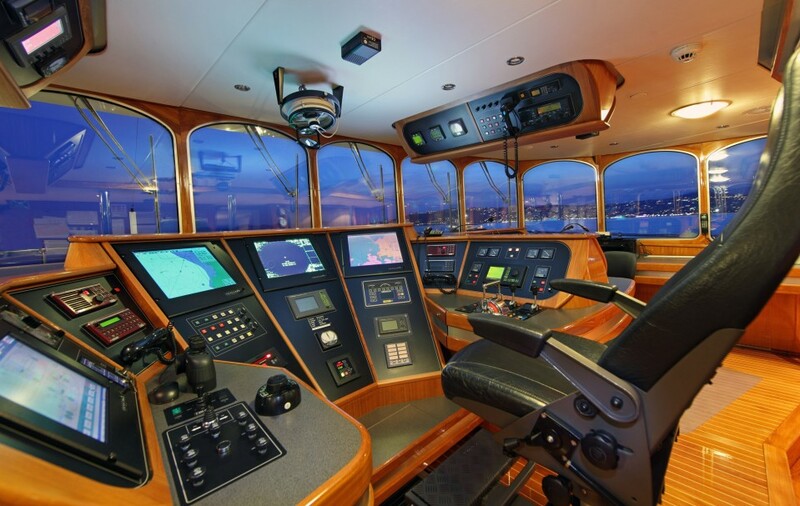 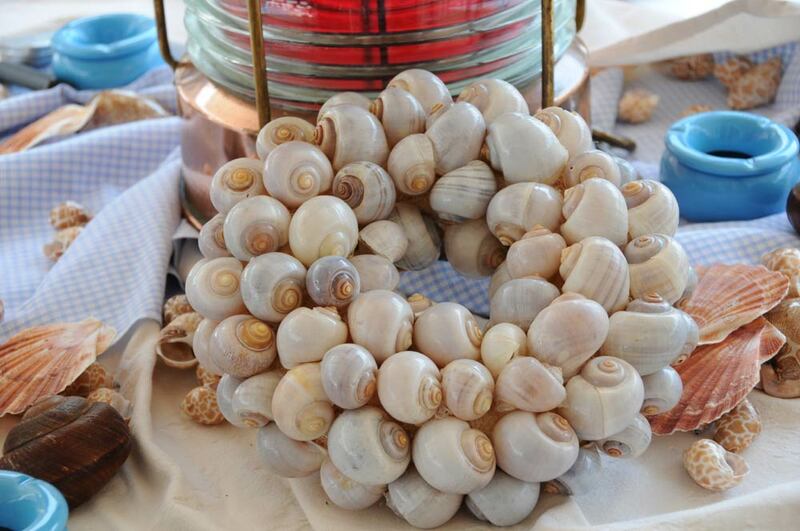 Located at the front of the ship, the master cabin has its own terrace with amazing view of the sea. 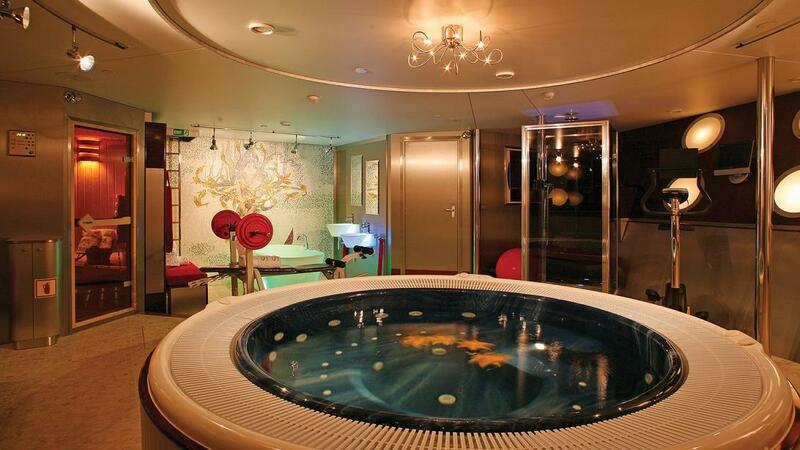 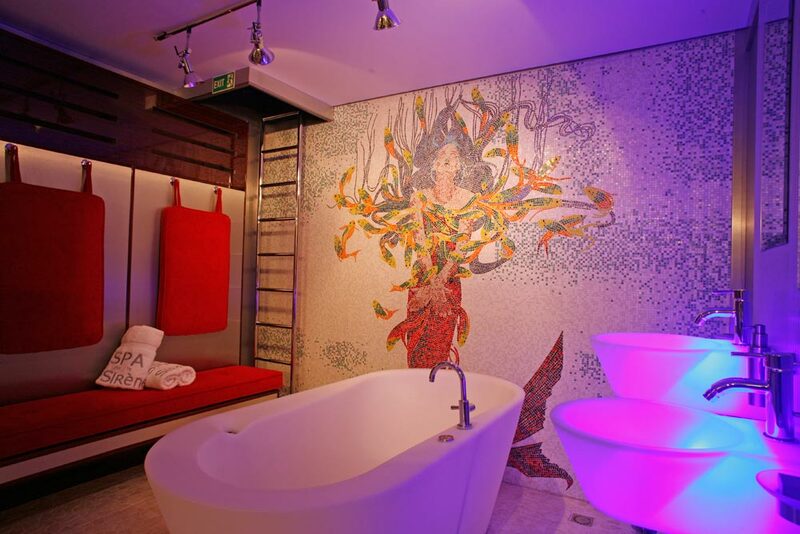 The Spa pool is in the middle of the room, which creates excellent romantic and cosy atmosphere. 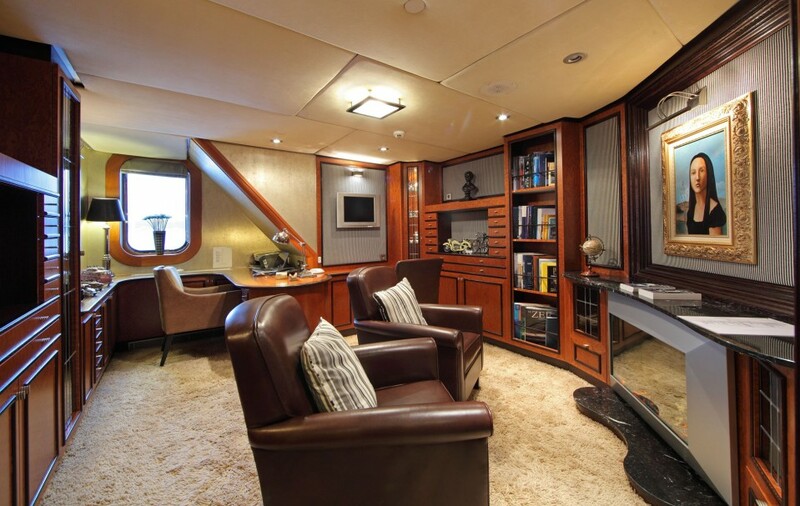 The exterior space of the owner's deck has comfortable chairs, footstools and even table lamps for whose you would like to enjoy a good book or spending a quiet night stargazing. 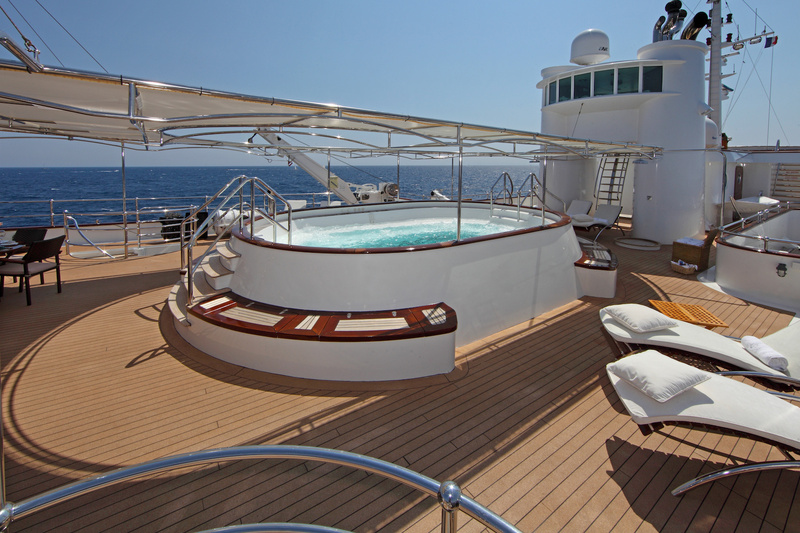 The wheelhouse deck hosts the Spa Pool, loads of deck chairs, a bar, a BBQ area and the look-out house for 360-degrees stunning views. 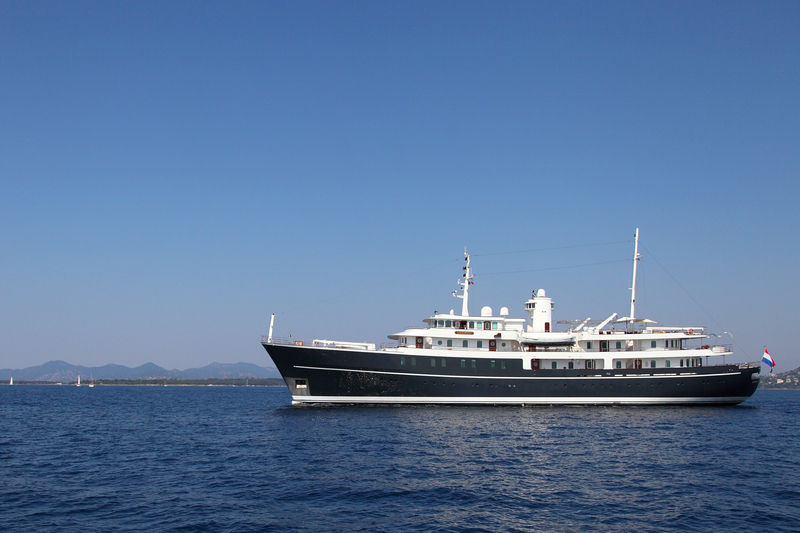 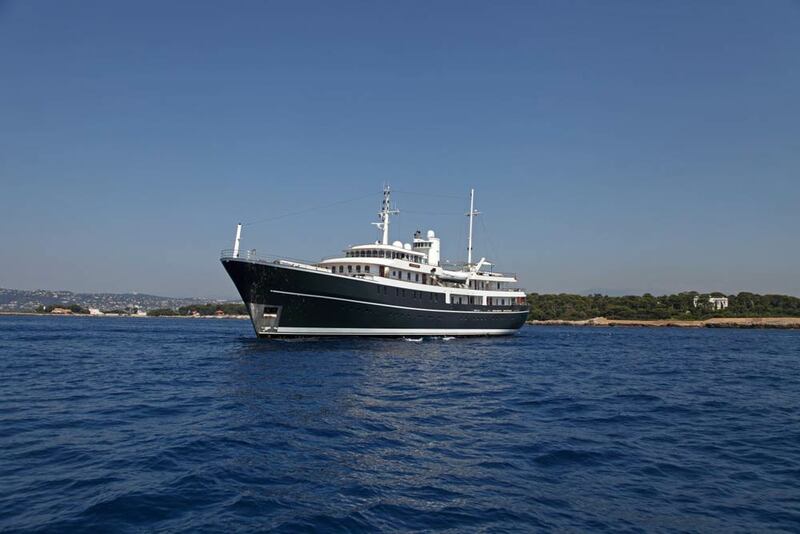 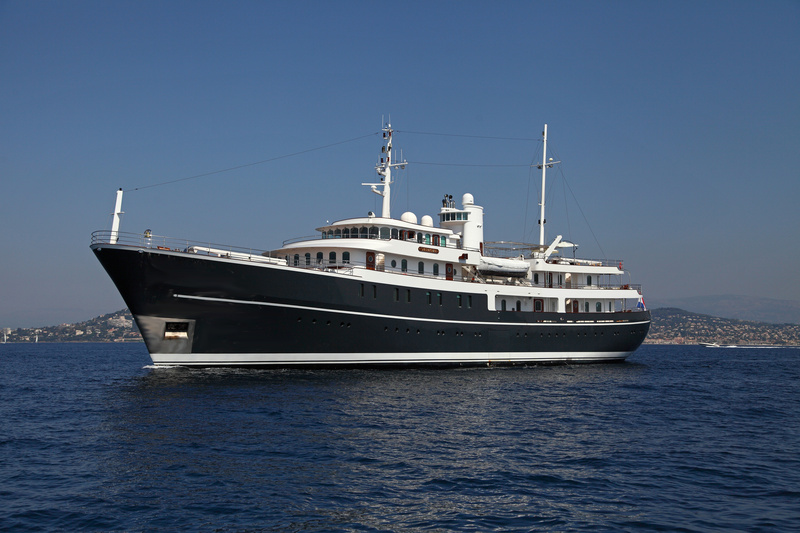 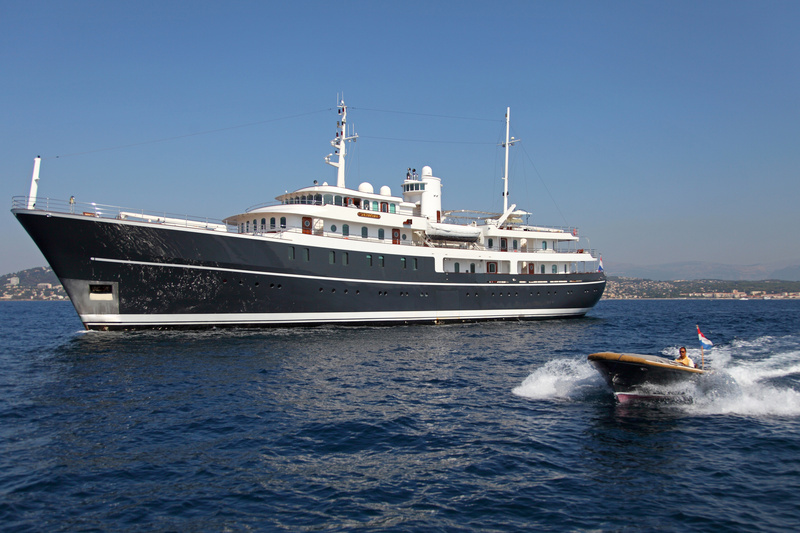 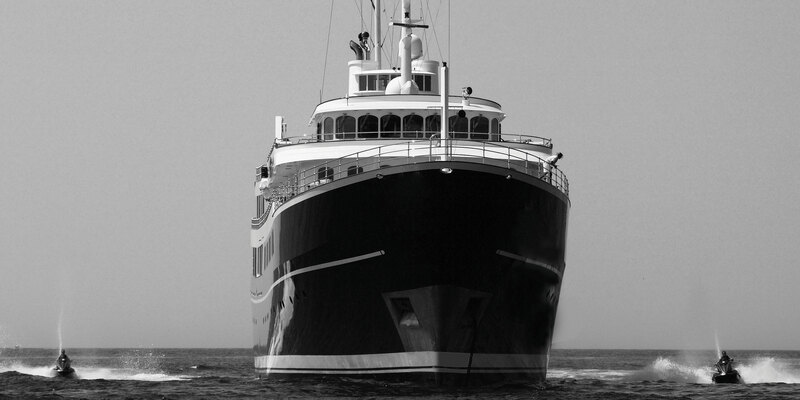 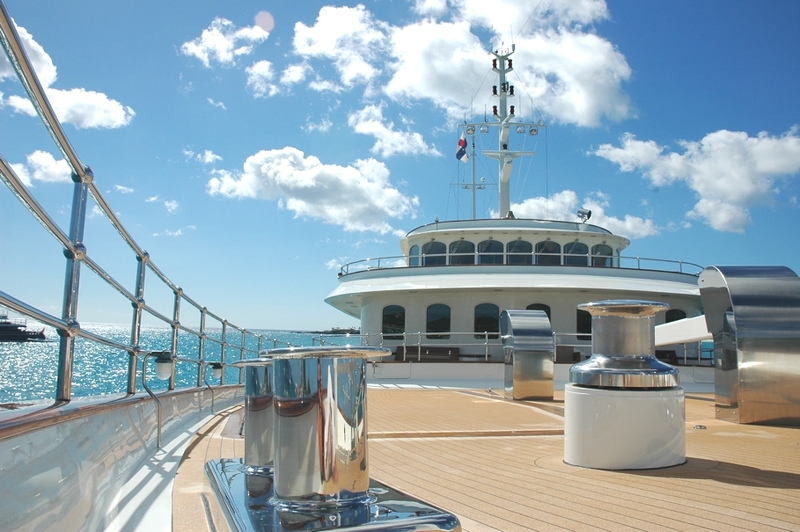 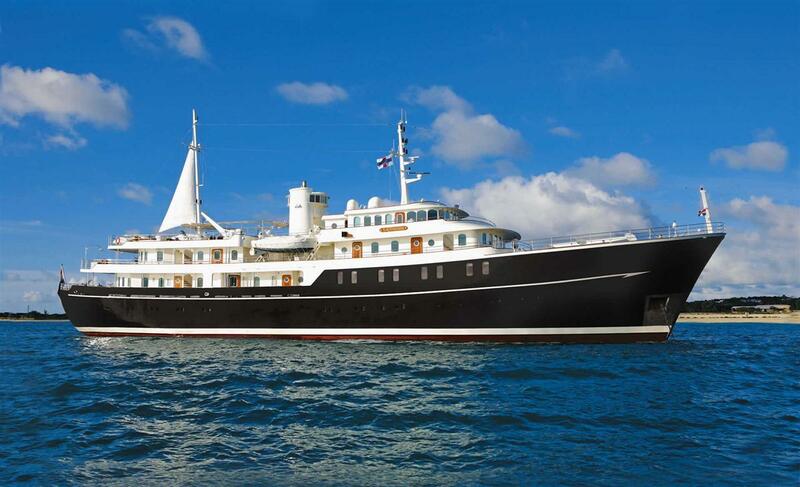 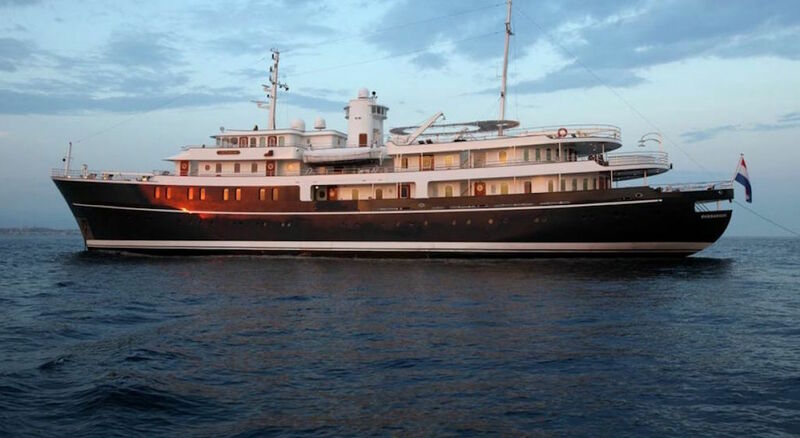 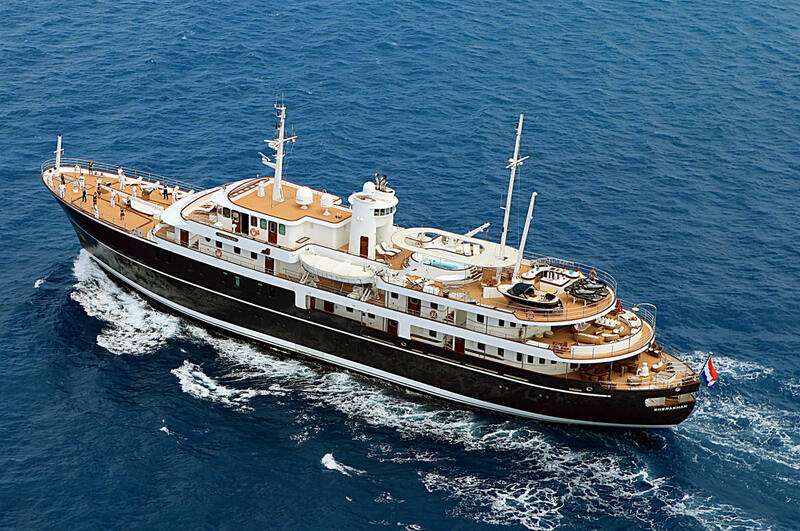 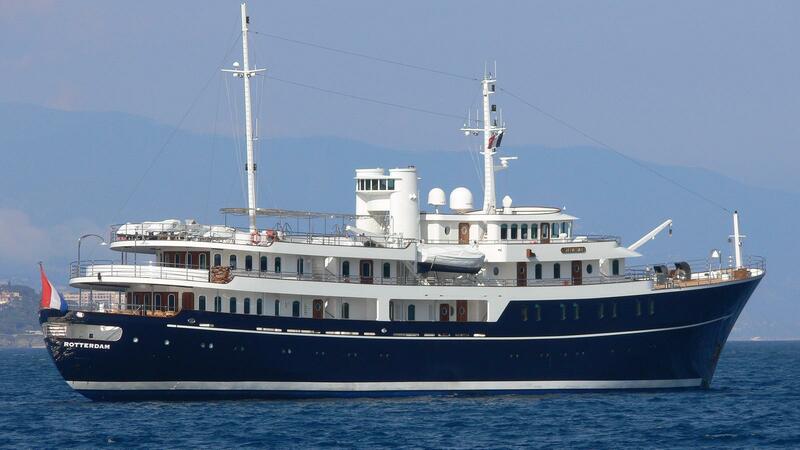 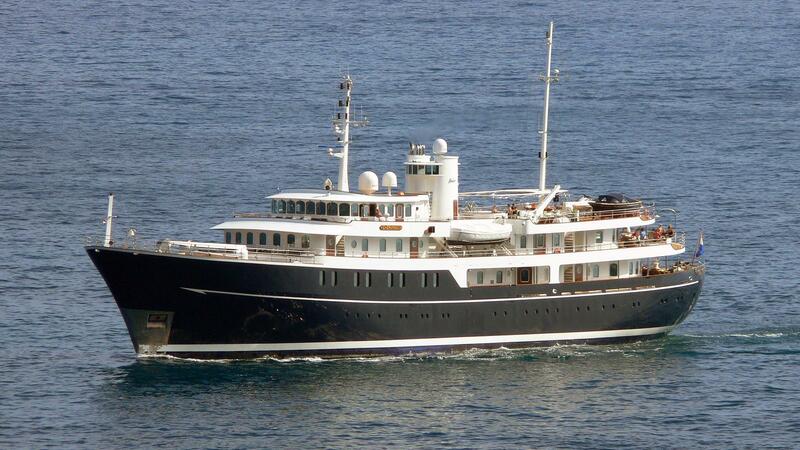 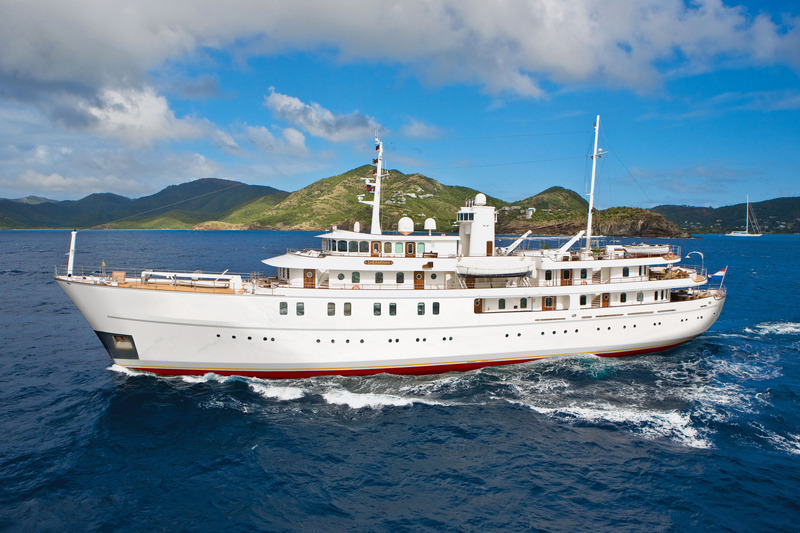 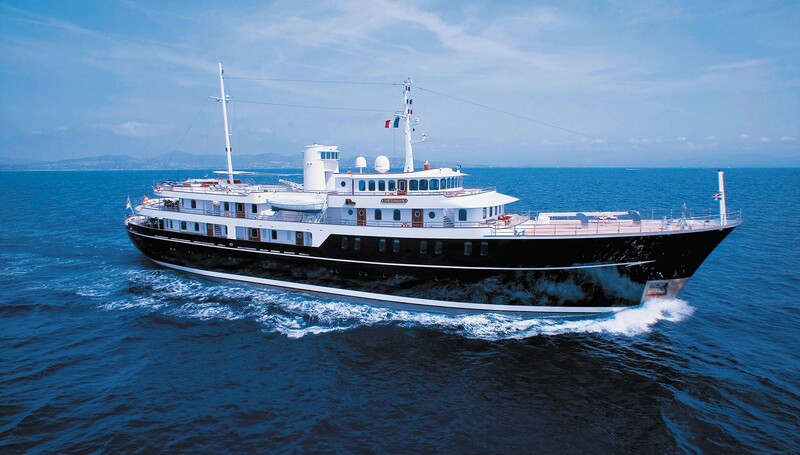 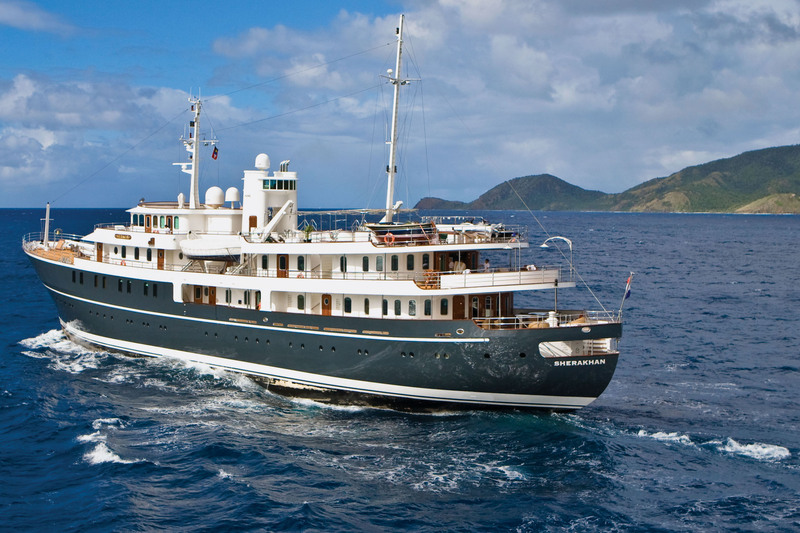 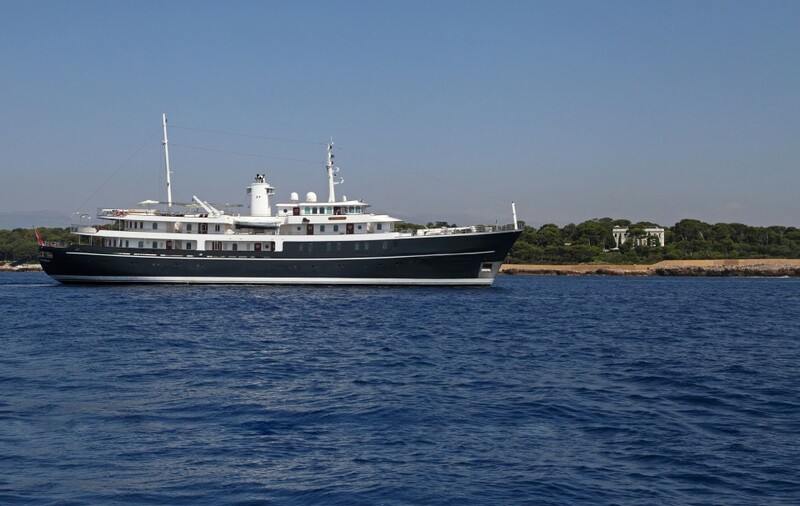 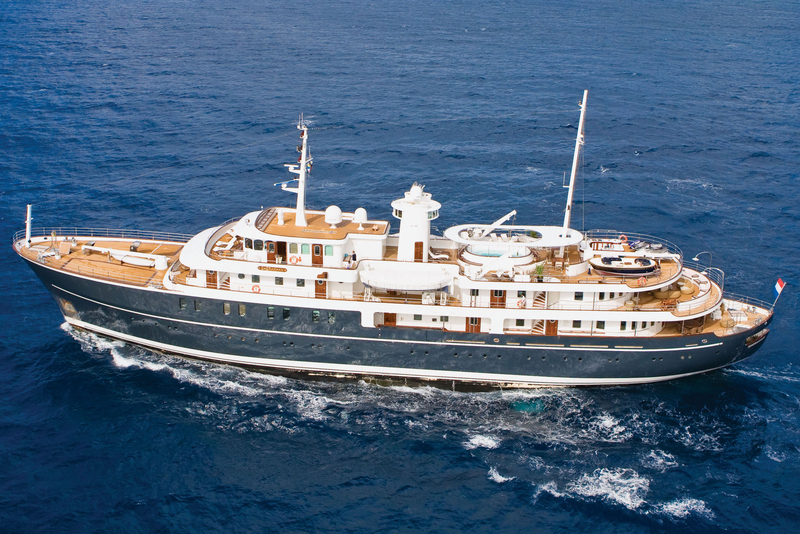 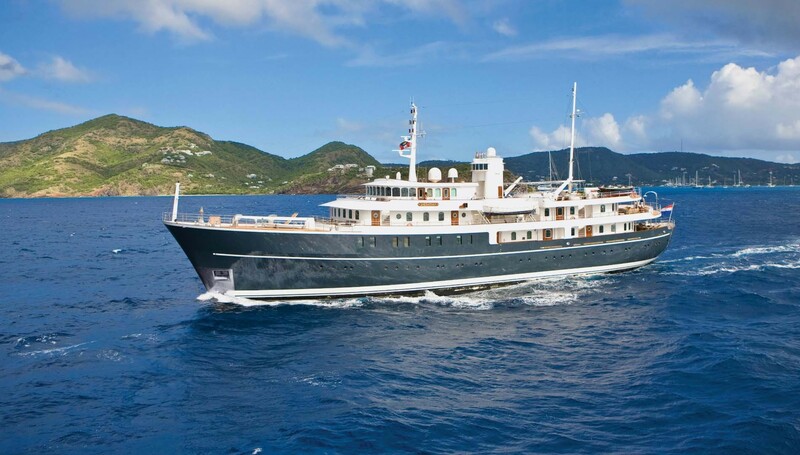 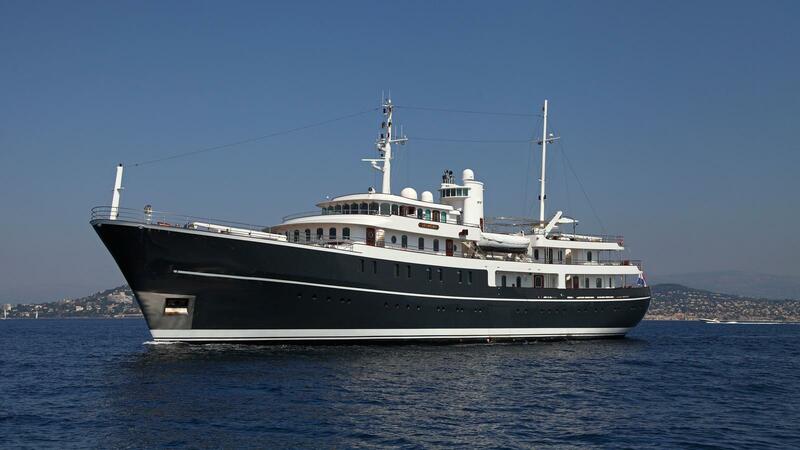 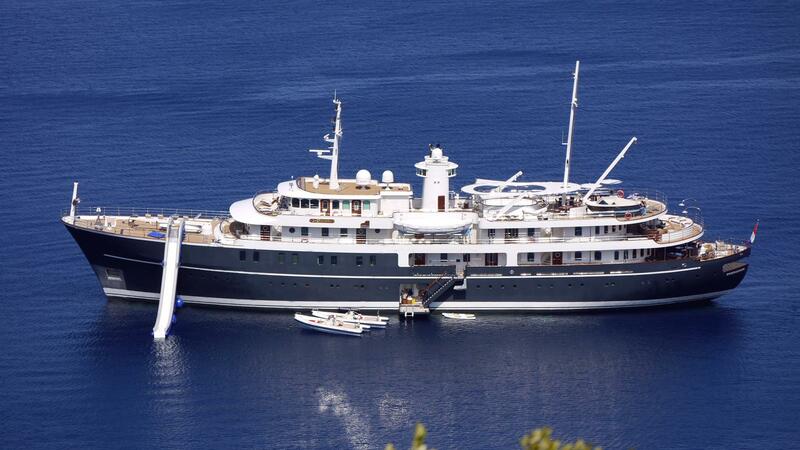 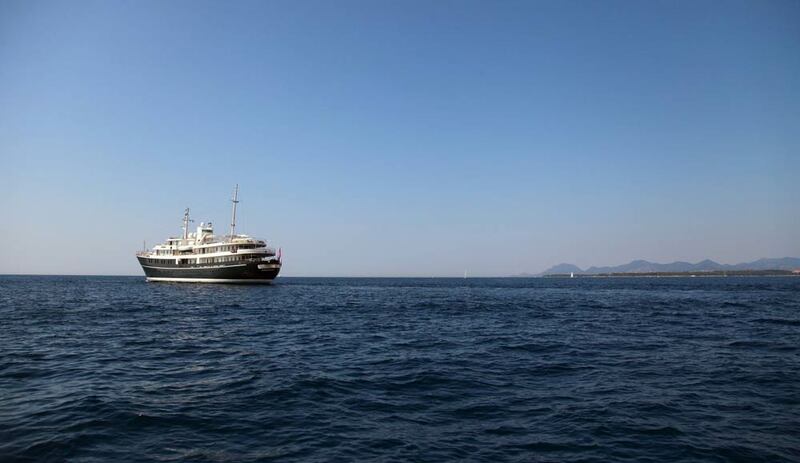 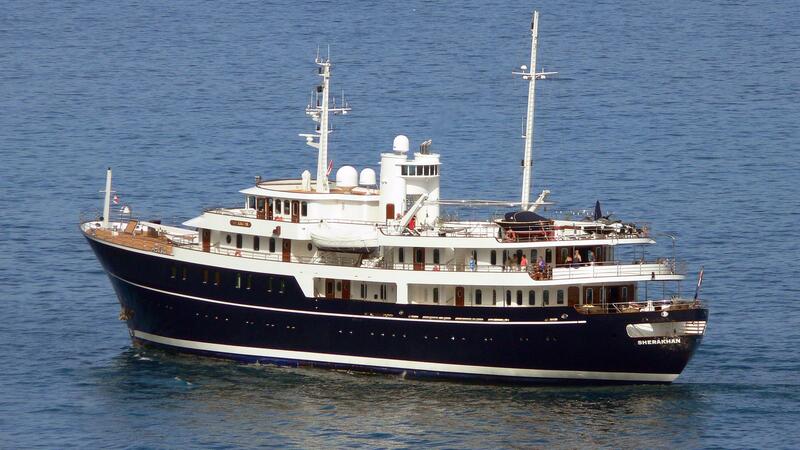 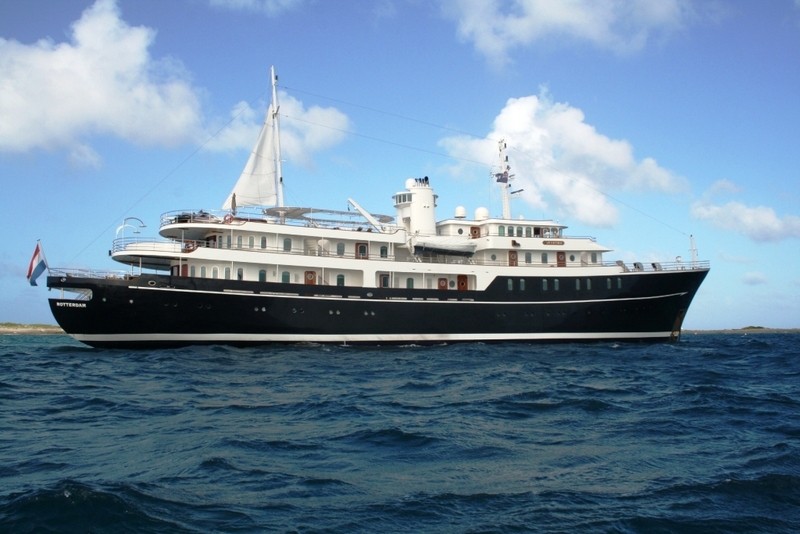 ICON Yachts were commissioned to refit the impressive 1945 Gross Tonnage luxury mega yacht Sherakhan. 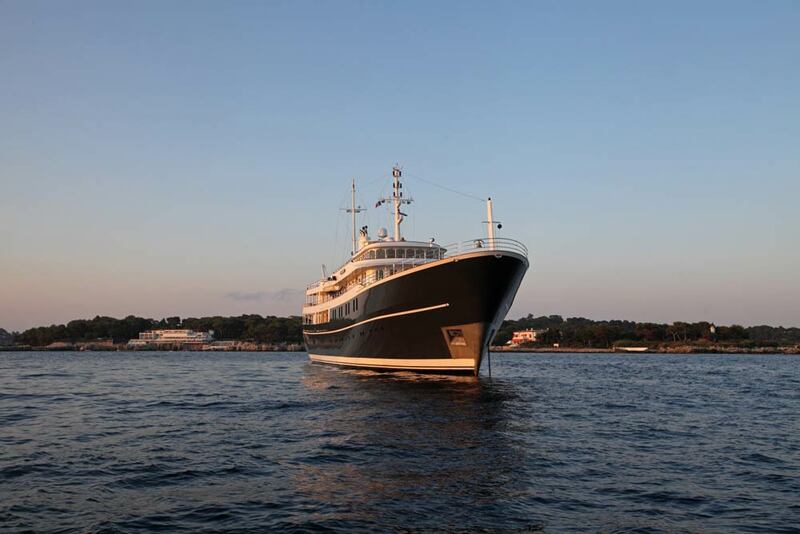 She received a new exterior paint system and new generators. 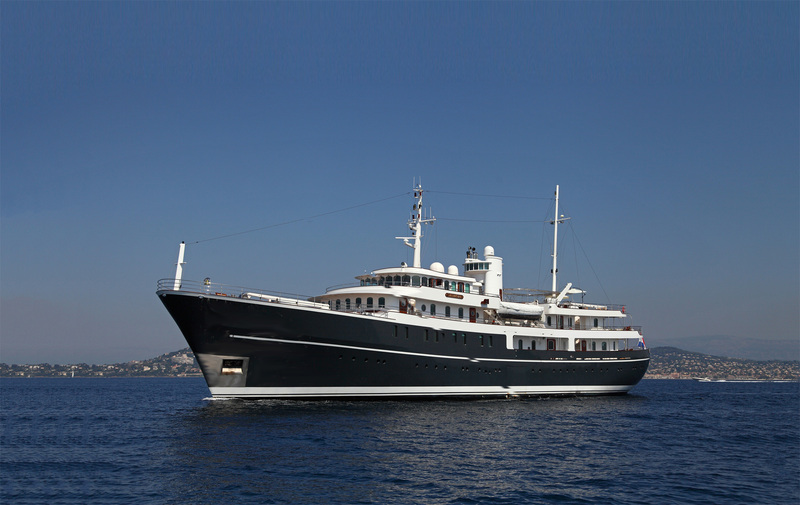 During her brief visit to the ICON yard, she underwent a thorough systems service and maintenance campaign. 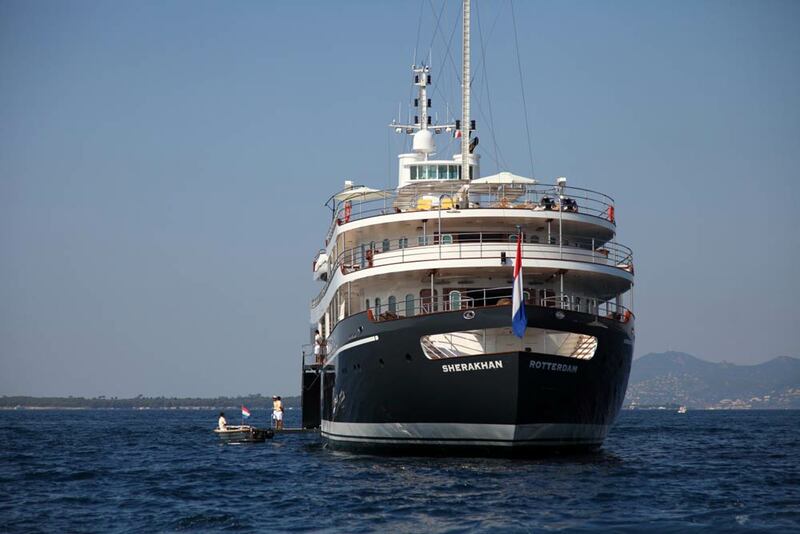 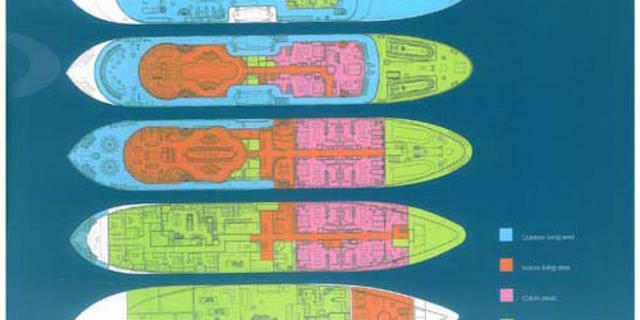 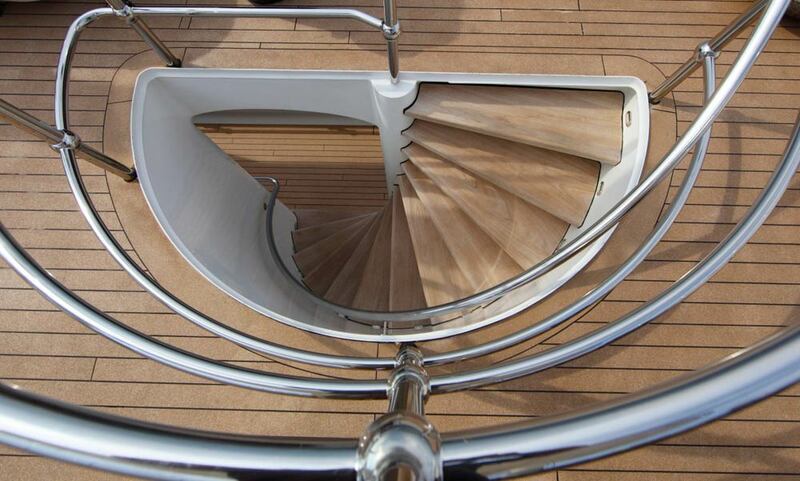 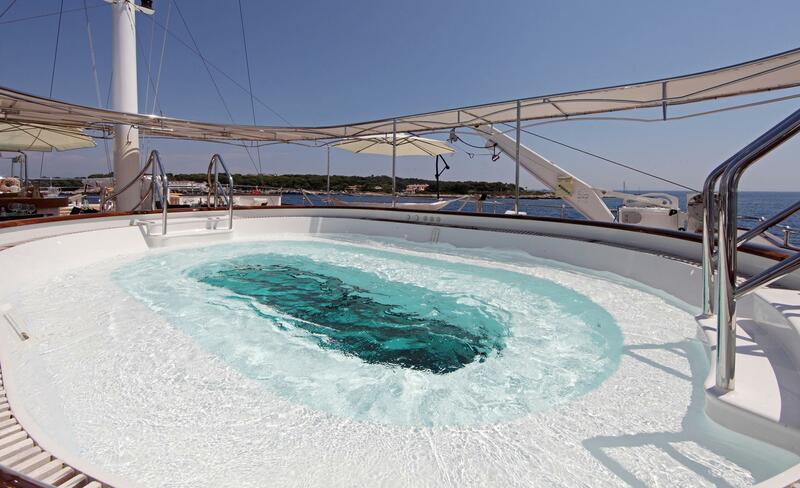 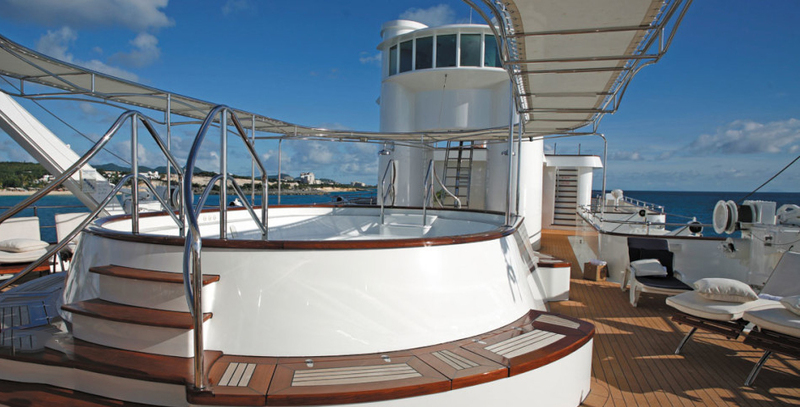 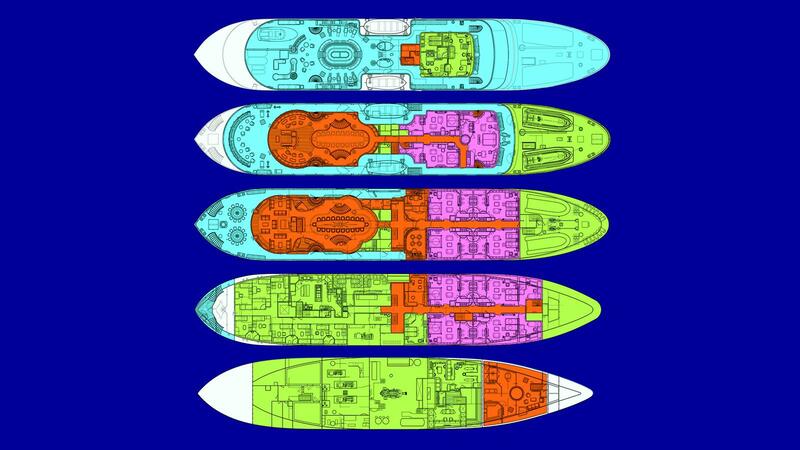 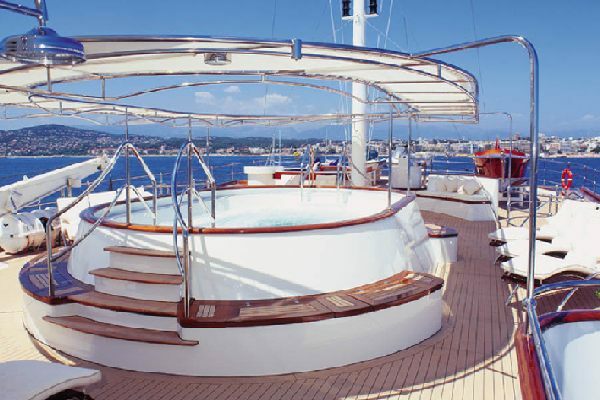 The project was managed by Verkerk Yachting Projects. 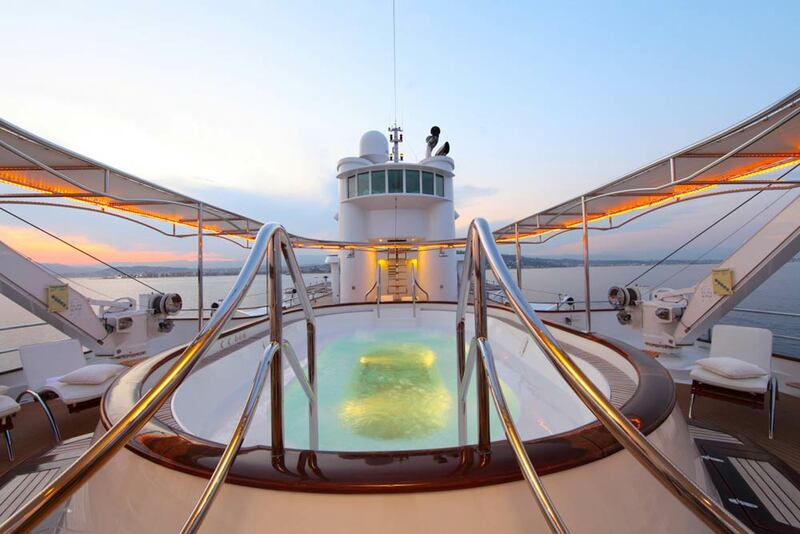 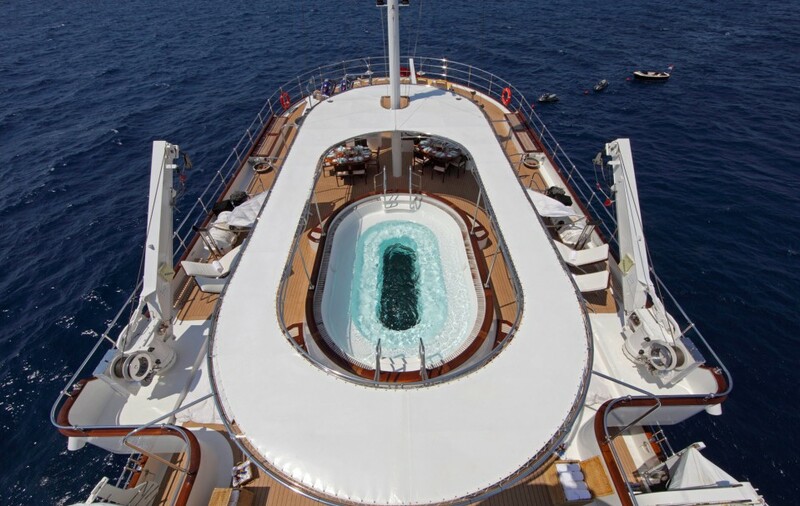 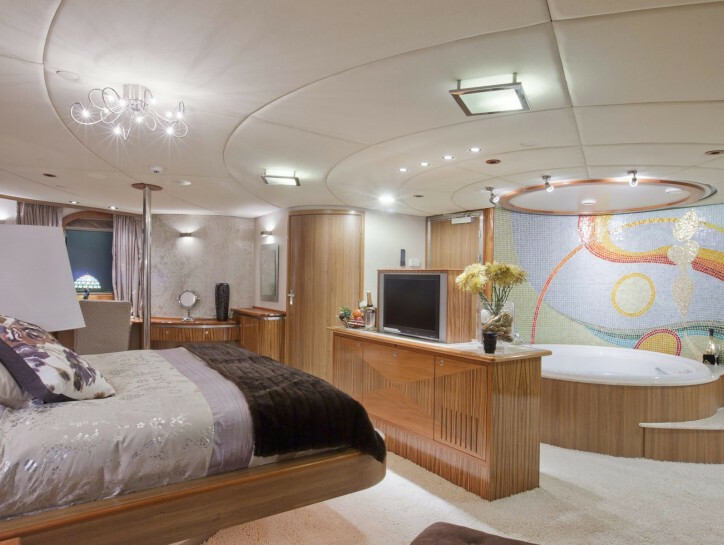 Luxury motor yacht SHERKHAN provides superior accommodation for up to 26 yacht charter guests in 9 double and 4 twin cabins: The Master cabin boasts a Spa Pool, private terrace, and a lounge area/study. 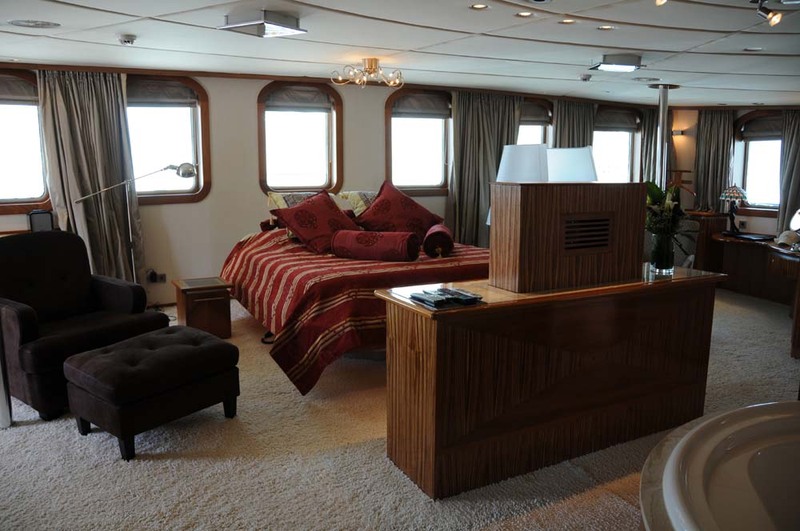 The owner's study/lounge can also convert into an independent double with its own en suite. 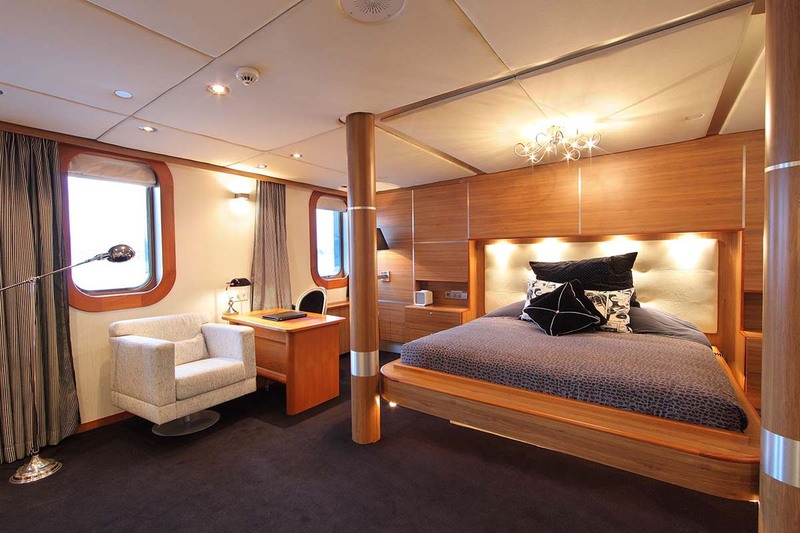 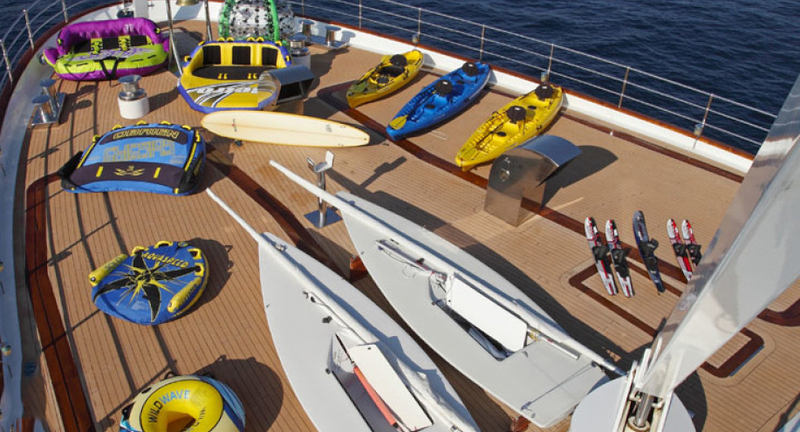 There is One further double on the owner's deck and Eight further equal sized cabins 4 doubles and four twins (two of them convert to doubles) convertibles plus two smaller cabins with bunked twins that each link to a double - suitable for children, nannies or staff. 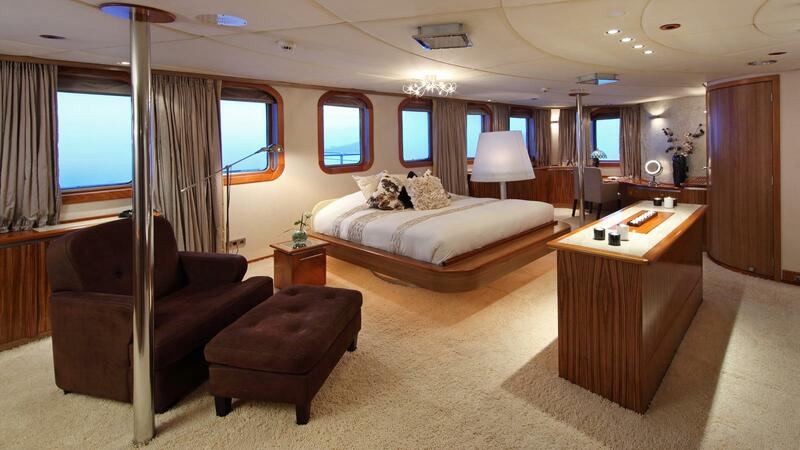 All the double beds are king size. 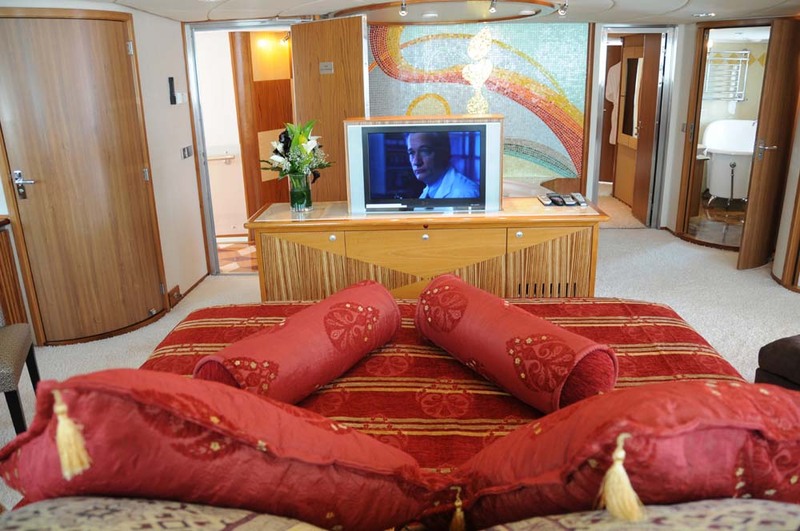 All suites are equipped with a television, DVD, stereo, mini bar, safe, air-conditioning/ heating, a vanity table/desk, a computer point, relaxing chairs, saloon table, and a very spacious walk-in closet, bathroom with toilet, bidet, bath (Spa Pool), double basin and shower. 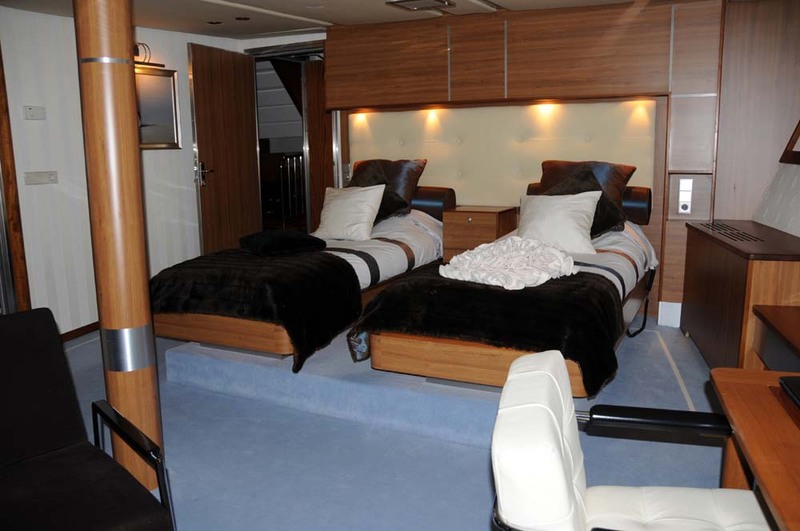 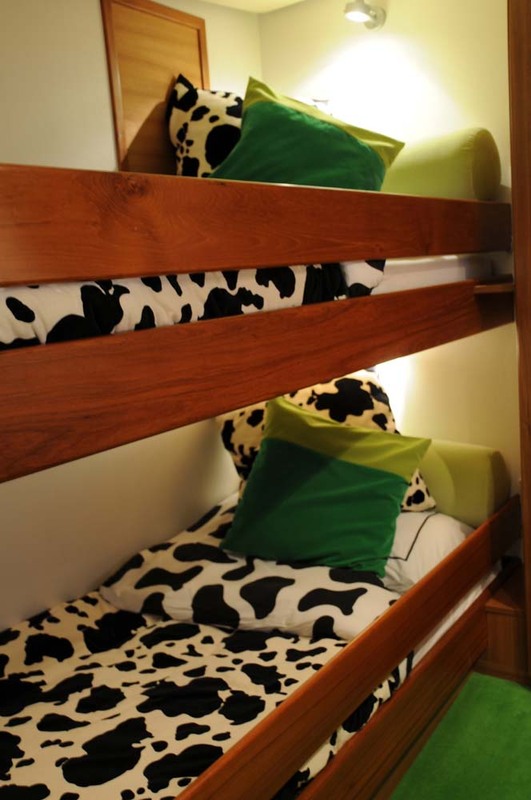 All the double beds are king size. 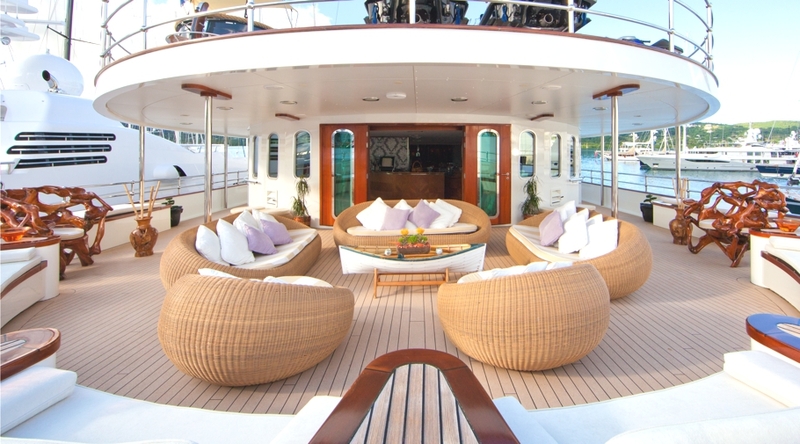 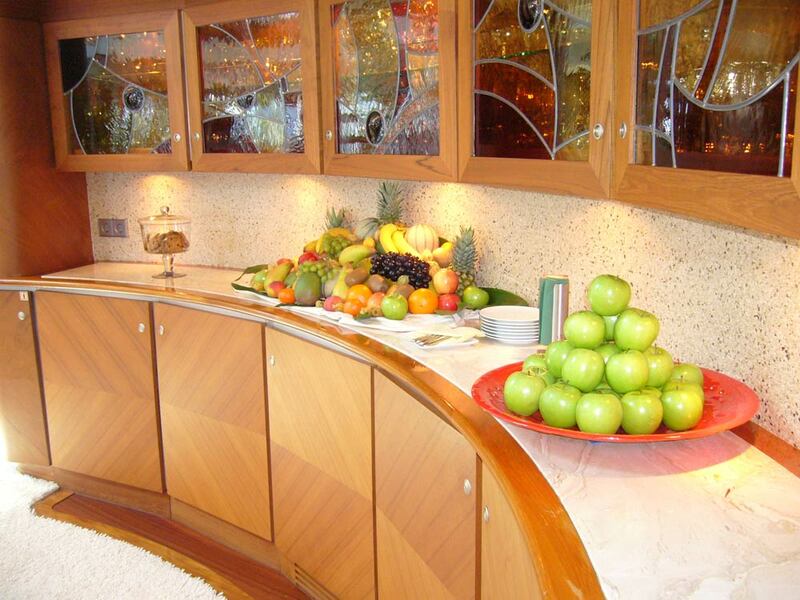 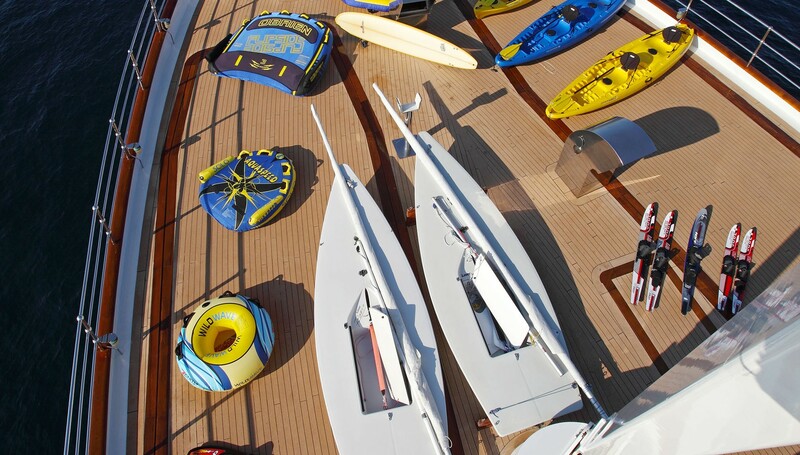 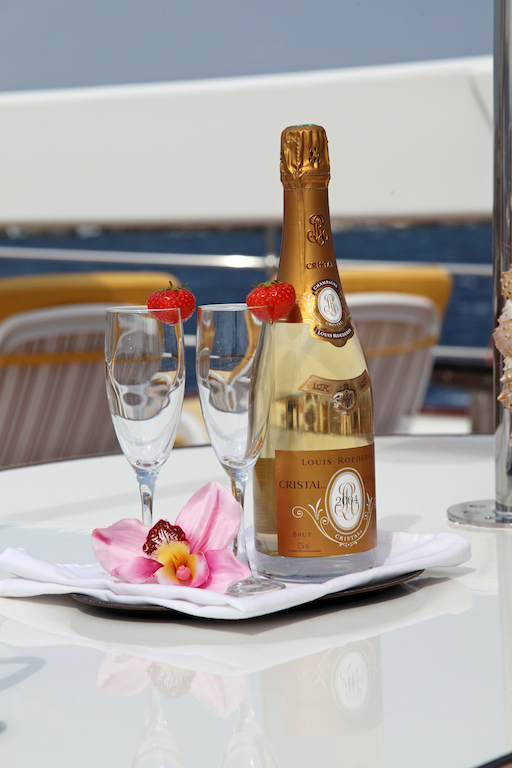 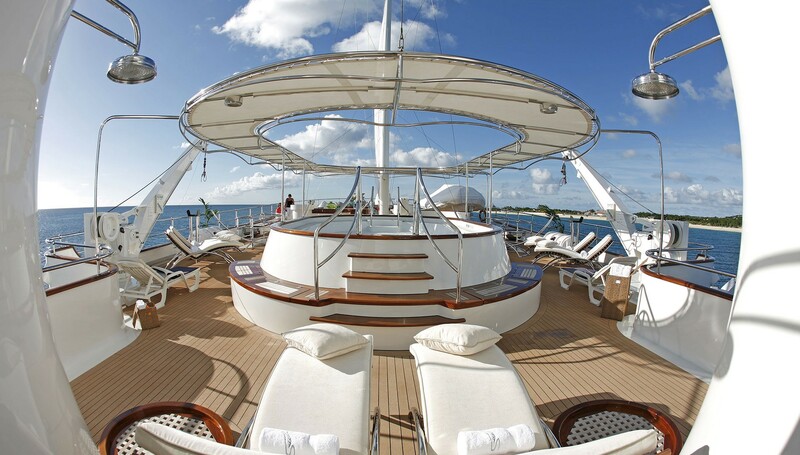 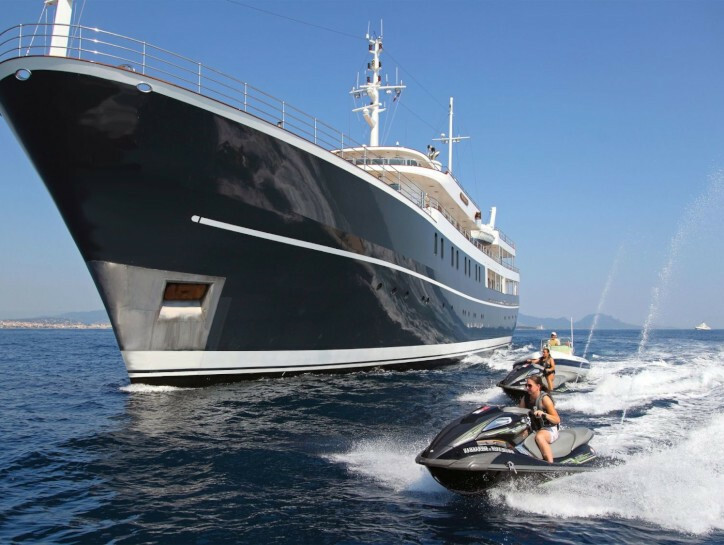 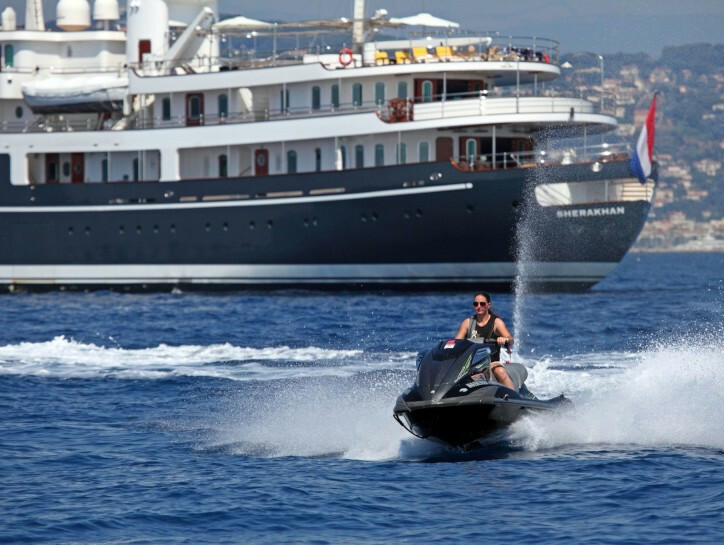 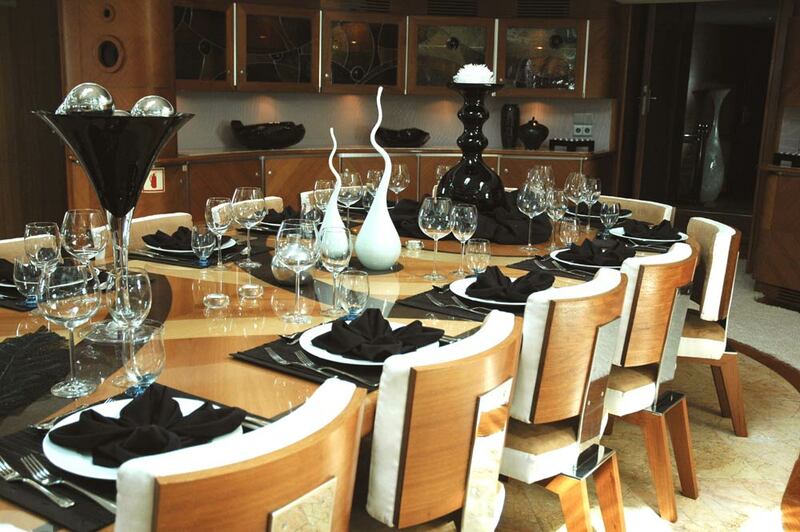 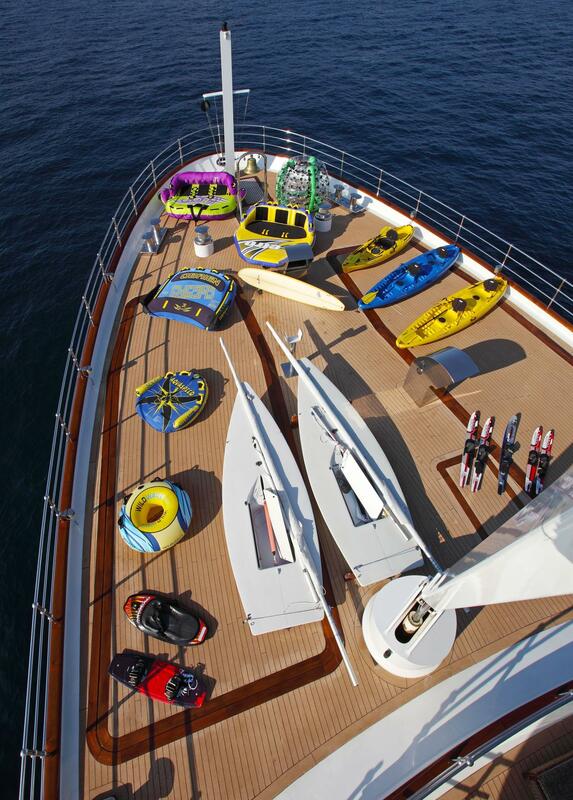 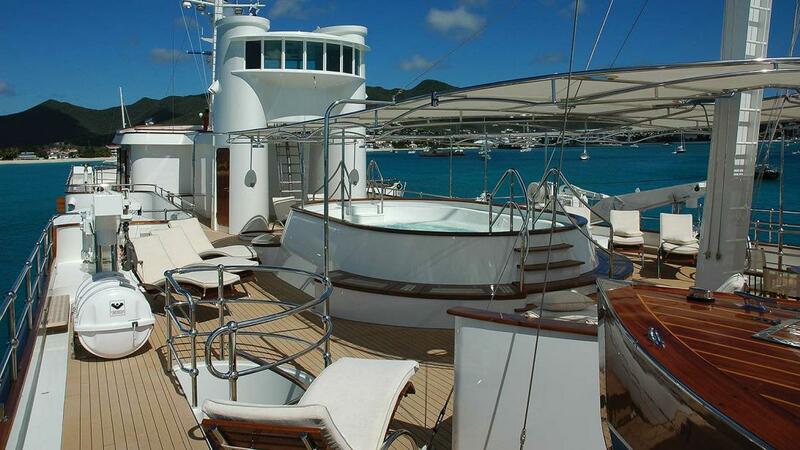 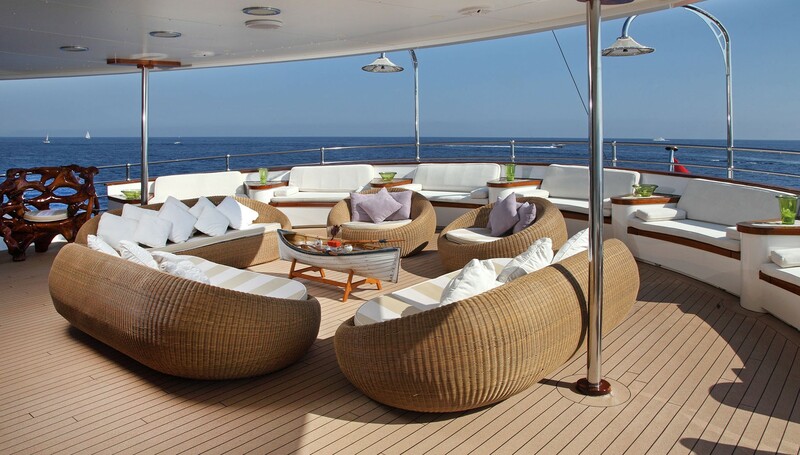 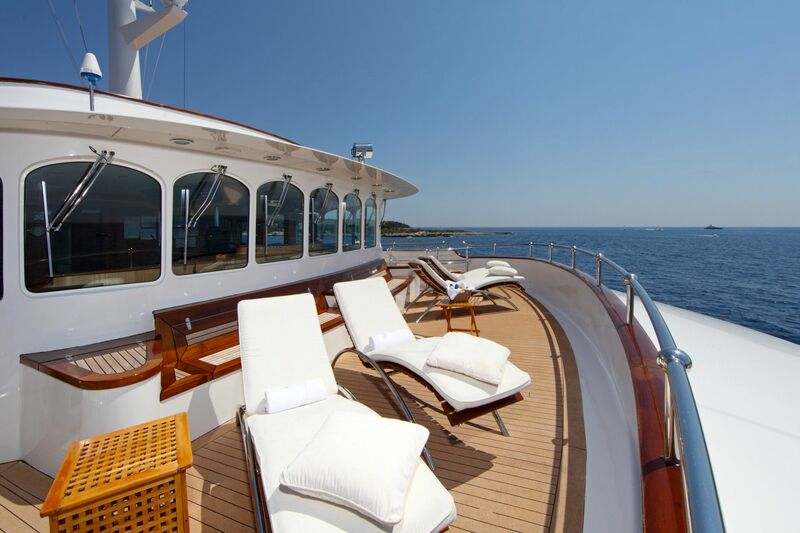 Luxury motor yacht SHERKHAN offers the following extensive list of yacht charter amenities and extras. 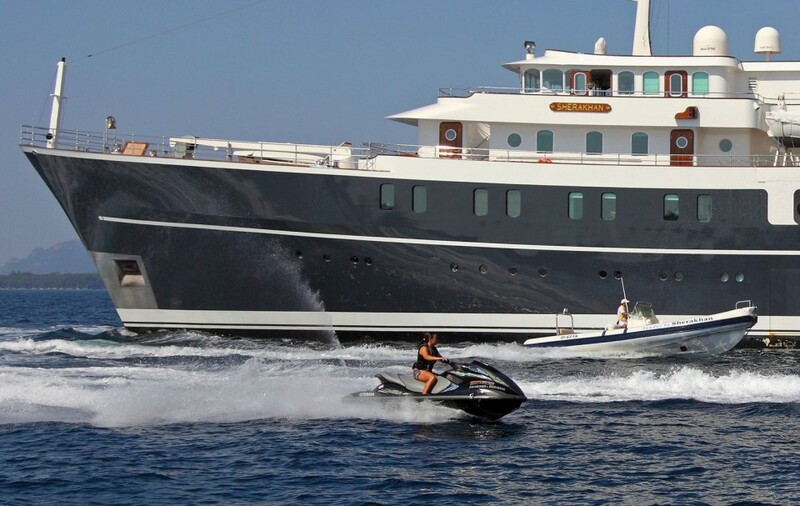 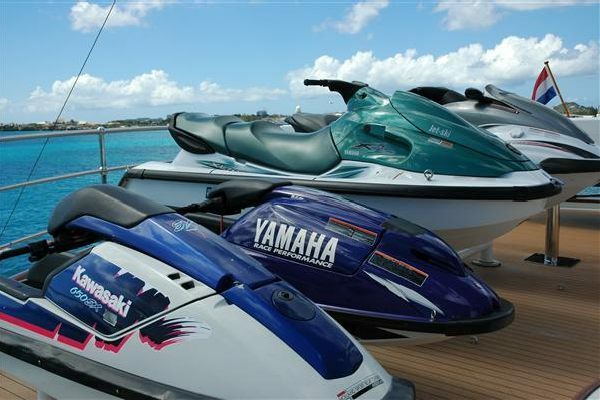 The Tenders and Toys onboard include two 24ft (7.3m) Joker Clubman inflatable tenders type 24 EFB with 260hp Yamaha inboard, two Yahama jet skis Superjet 700, two FX1400 Yamaha WaveRunners a Laser sailboat, two wind surf boards, a surf board , a floating trampoline, a kayak, fishing rods and tackle. 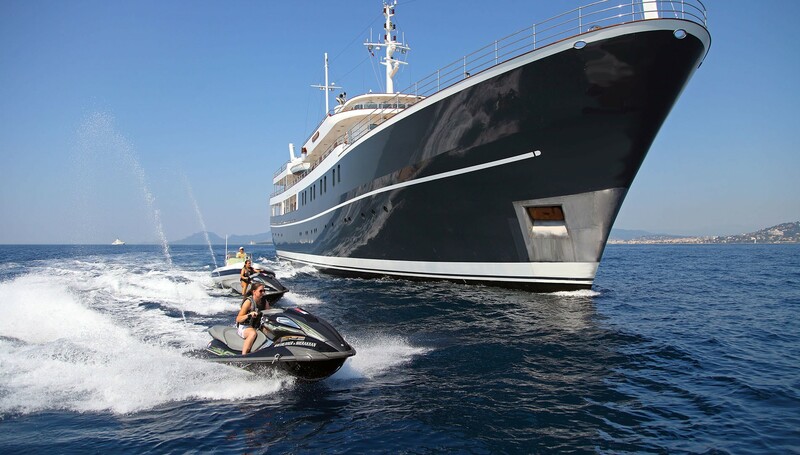 The yacht also has an extensive range of Fitness equipment including a Stationery Exercise bike, a Step Machine, a treadmill, a precor elliptical trainer and a set of Free weights. 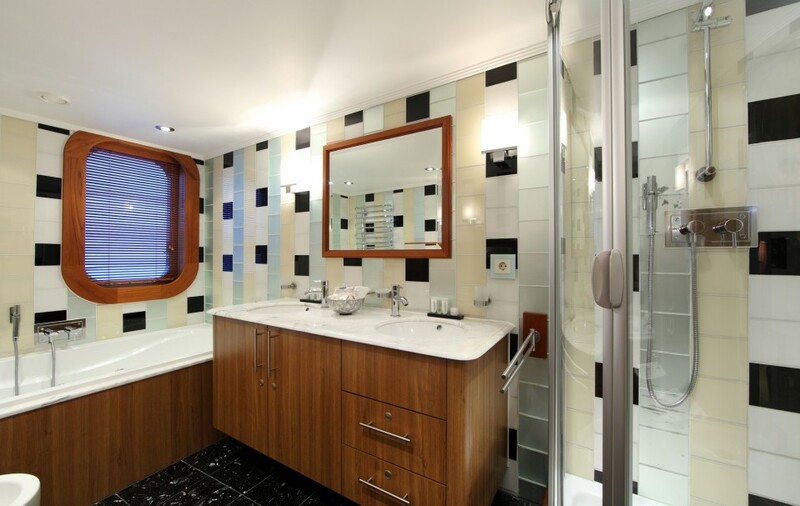 Extra features include , a Beauty salon, an Outside BBQ area,a Spa Pool for up to 18 guests, Hang mats, Sauna & Spa room, Library room with internet access,. 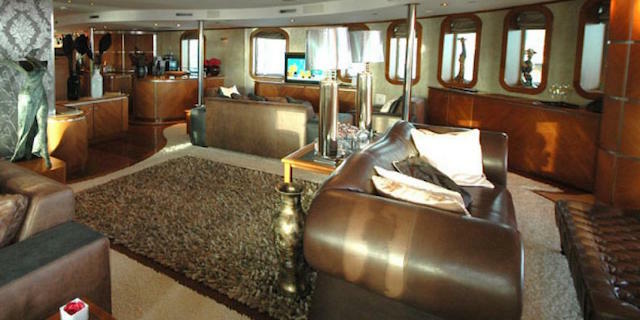 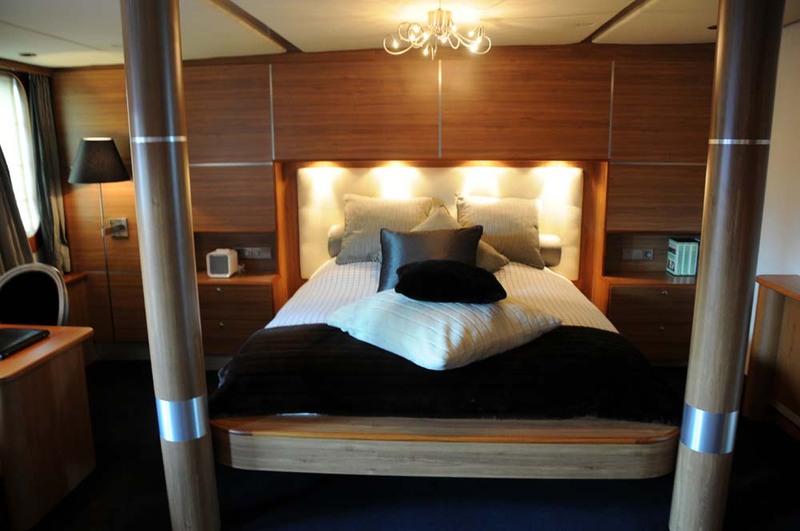 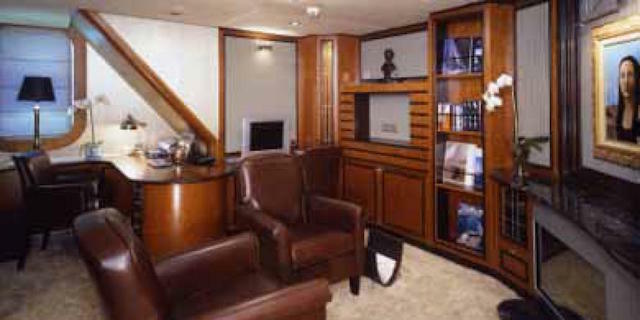 The yachts Audio Visual Equipment and Deck Facilities include a TV , DVD in all cabins and the saloon, Sat TV and Hi Speed Internet access. 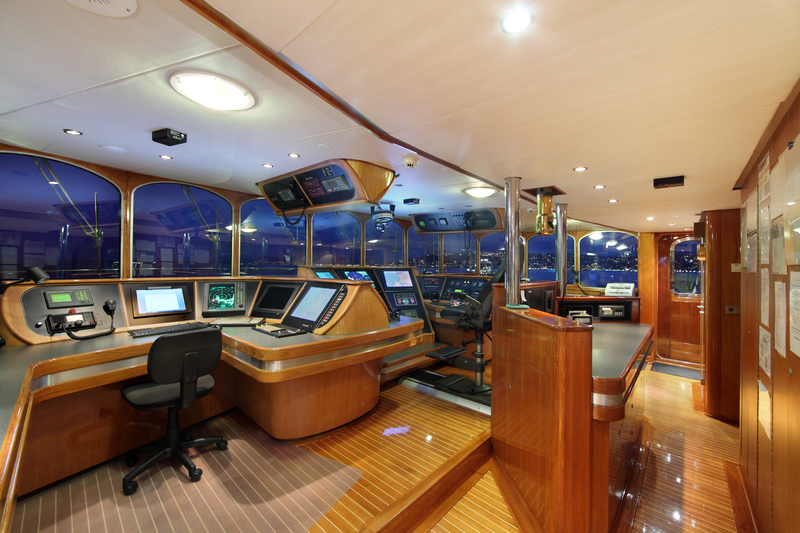 Her Communications include GSM, Satcom , seatel,vsat and wifi.